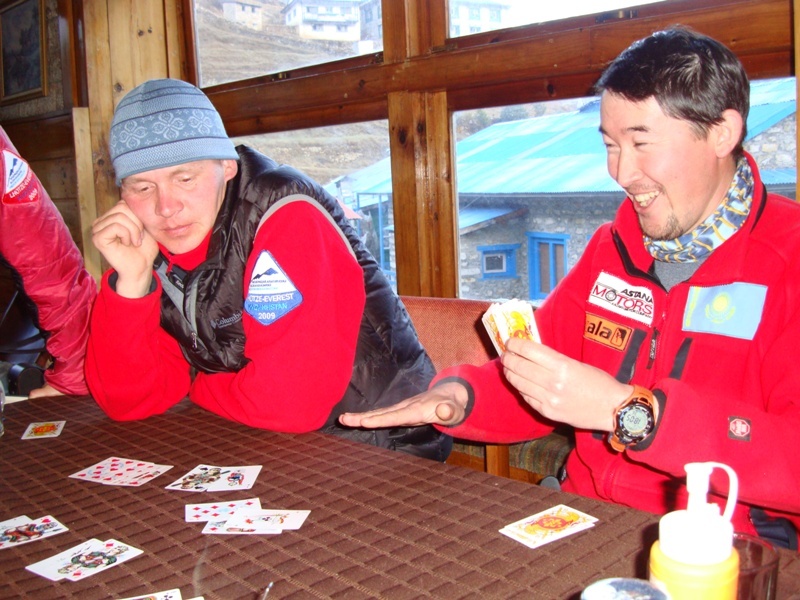 “Group 1 (Maxut Zhumayev and Vasiliy Pivtsov) and Group 2 (Svetlana Sharipova, Nikolay Gutnik and Dmitriy Grekov) are in Camp1 (6100м) together. 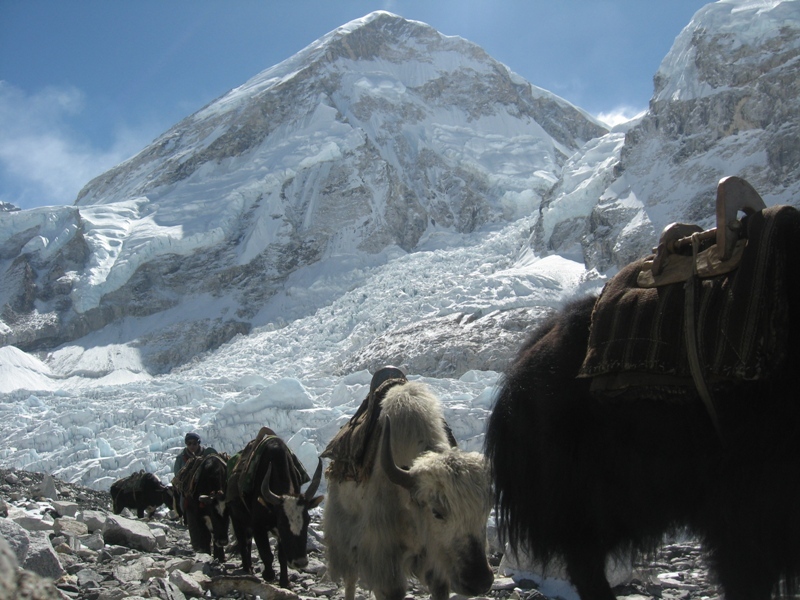 Plan to go across Khumbu glacier down to the Base Camp tomorrow early in the morning. 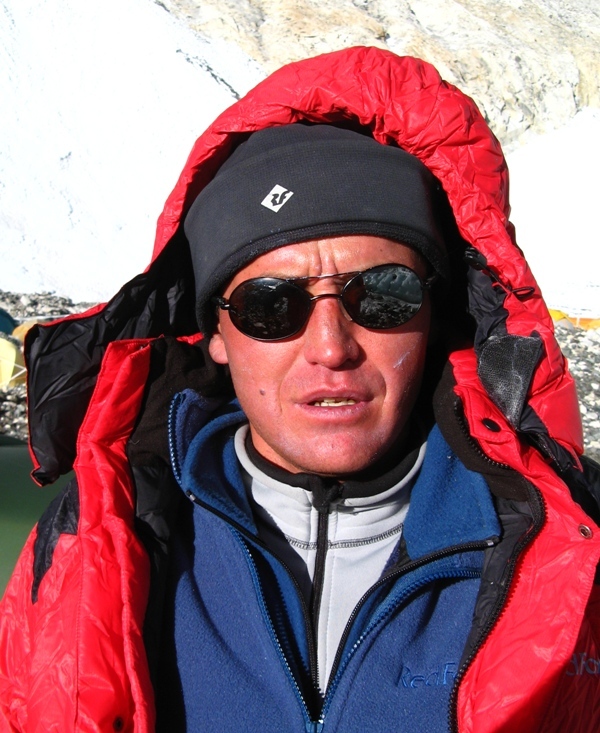 A group of Sherpas are going to carry Sergey Samoilov’s body to the Camp2 for temporary burial. 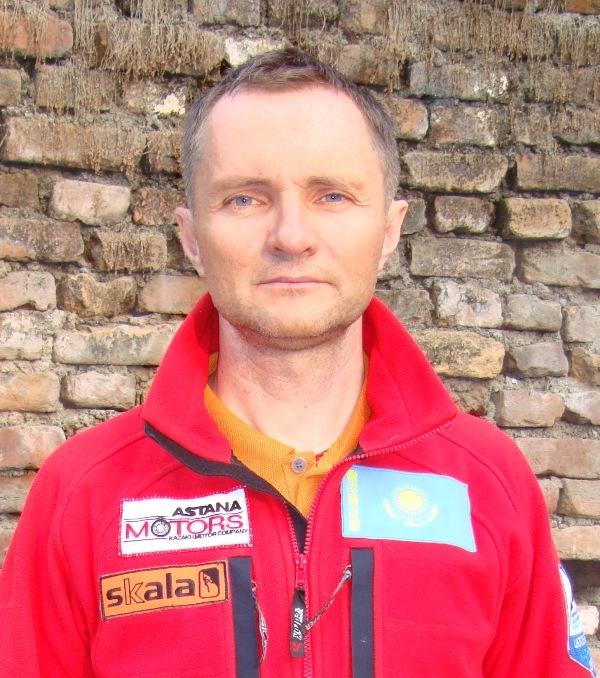 Sergey’s body evacuation expedition to bring it to Almaty is planned for this fall, after the monsoon period. 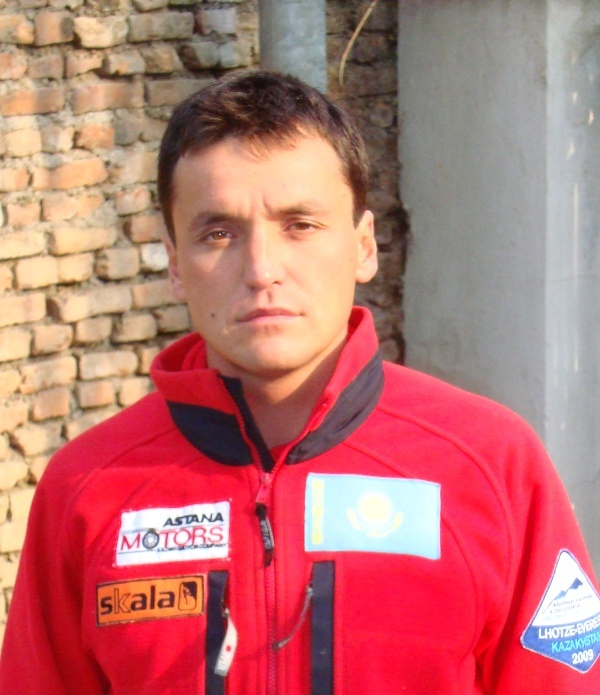 May 27, During the last attempt of Lhotse summit, Sergey Samoilov was lost. They came in L4, the weather calm, overcast, visibility of 200 meters. Last night a strong wind blow, and today all day drizzles fine snow. Now sitting in a tent and dried puff. 1 st group: me, Vaso, Serge, withdrew today from the 2 nd in 12.05 and the camp came to the 3rd camp. Set up the tents, cook dinner now. In the morning the weather was clear, no significant wind … snow has dust from the ground. At the tops of the flags. 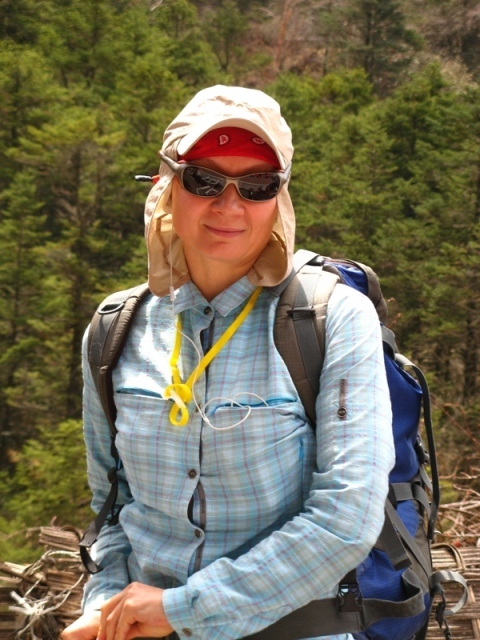 Today, from BC to Camp 2 and came 2 nd group: the Greeks, Gutnik and Sharipova. Both teams go with a break of 1 day. 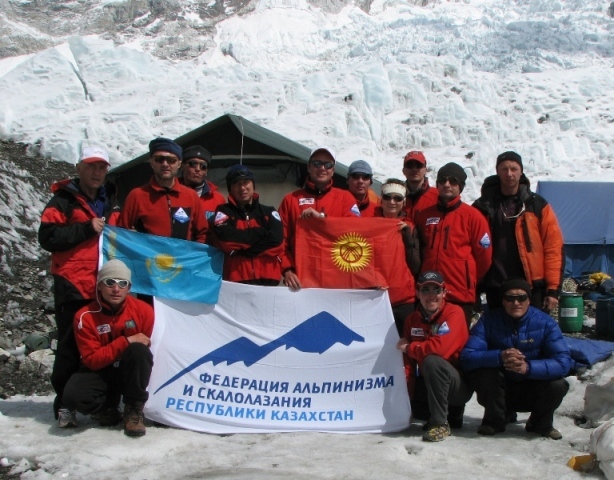 All expedition scaling down the camp, the Kazakhstan team final attempt! On the assault came three: Maksut Jumaev, Vassily Pivtsov and Sergey Samoilov! 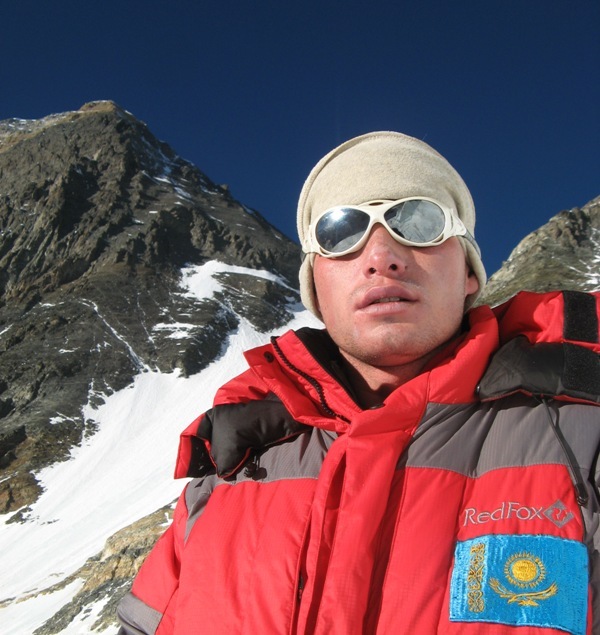 Do not just get an attempt to climb to the top of the Kazakhstan team Lhotsze (8516m.) 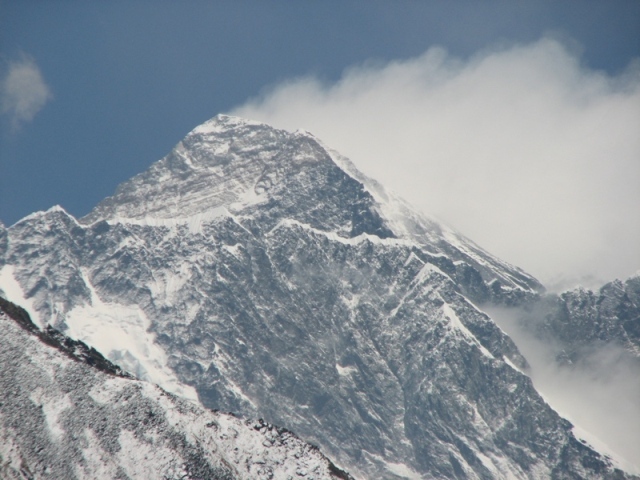 and Everest (8848m.). May 15, command the two groups came to climb. 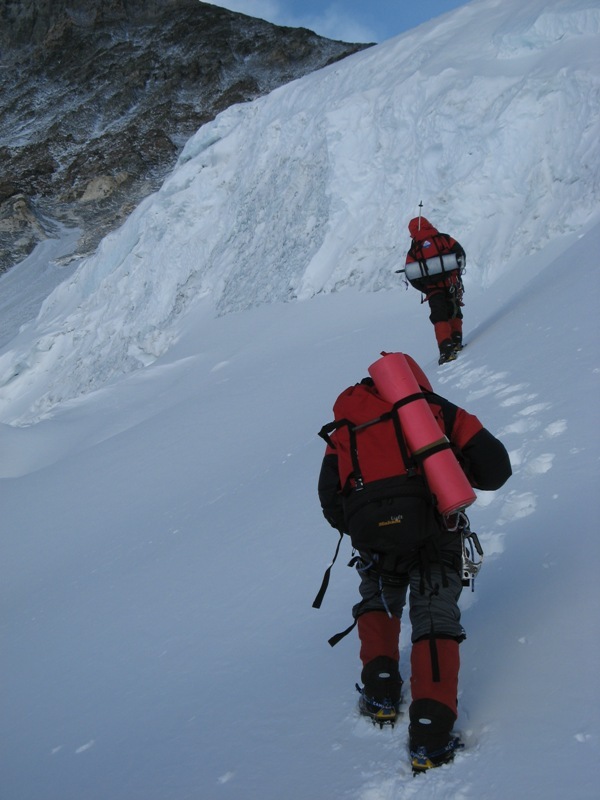 1 st group has reached a processing route at 3 am, despite the weather: at altitudes above 8000 meters on the projection was about -40°, significantly worsened the situation a strong wind to blow down. 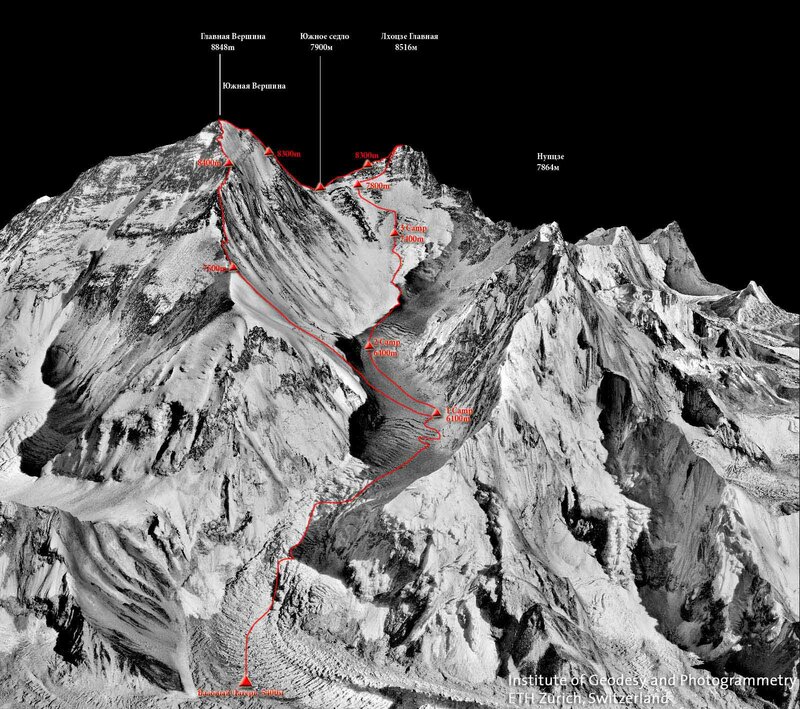 Process route had heights ranging from 7900 meters. 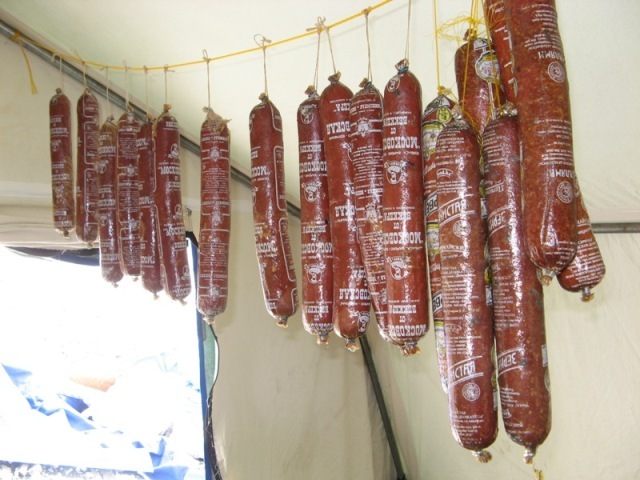 Ropes hung from the tent at once the 4 th camp. 1 st group sag of 400 meters of rope to the top vertex margins. Then, with heavy backpacks (about 10-15 kg. 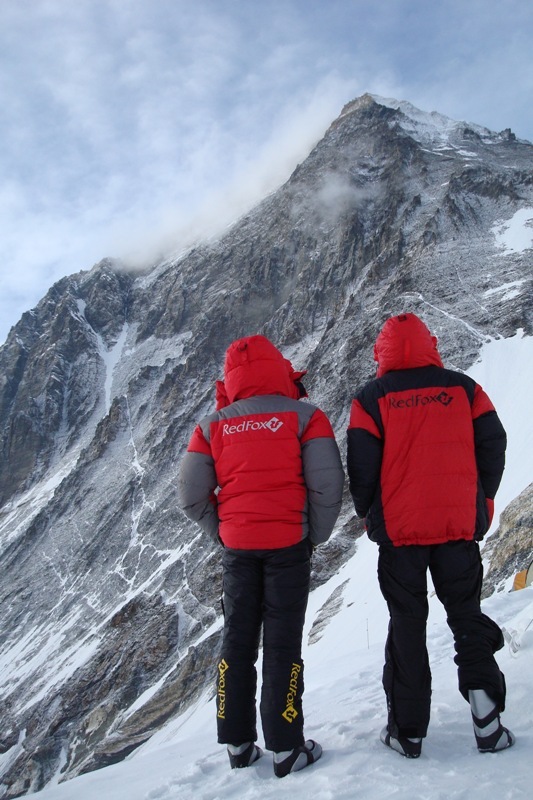 ), We continued the ascent without railings. 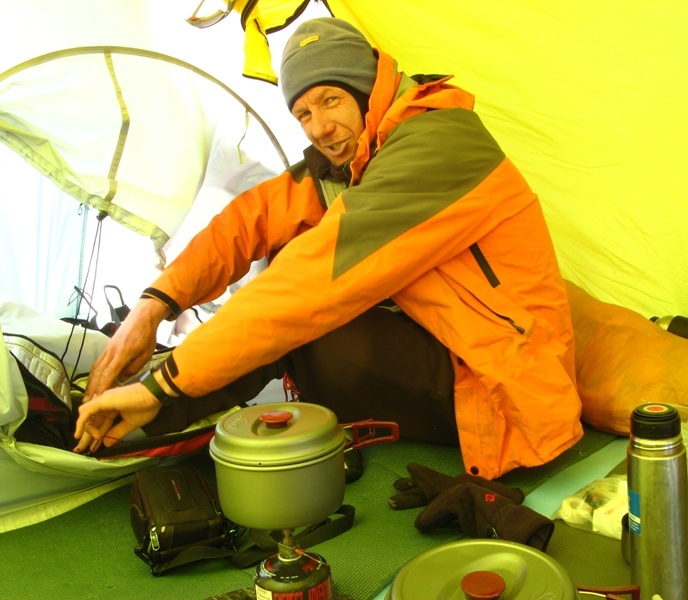 In a backpack, it was only necessary for a yoke (tent, the 3 main ropes, rock hooks, ledobury, high-altitude food, sleeping bags and stuff, though … things do not often “). 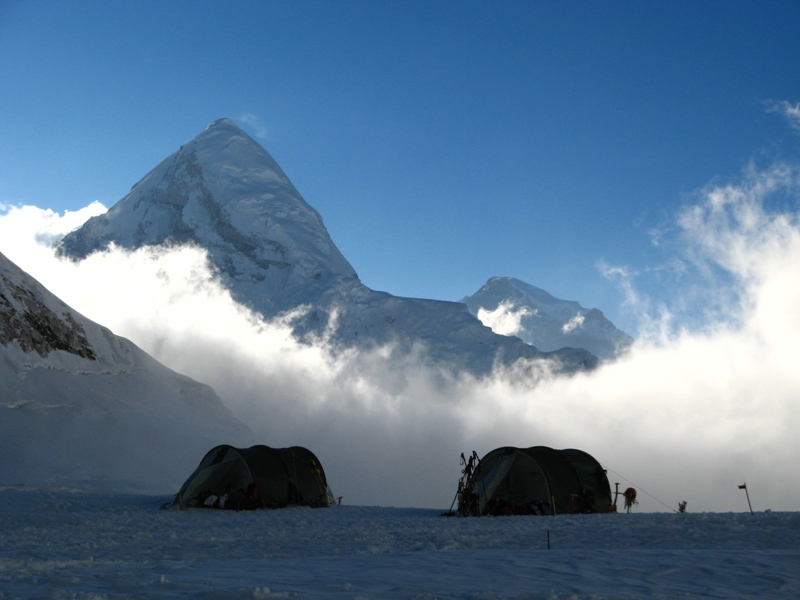 In the afternoon the weather deteriorated sharply – a strong wind blew from the bottom. 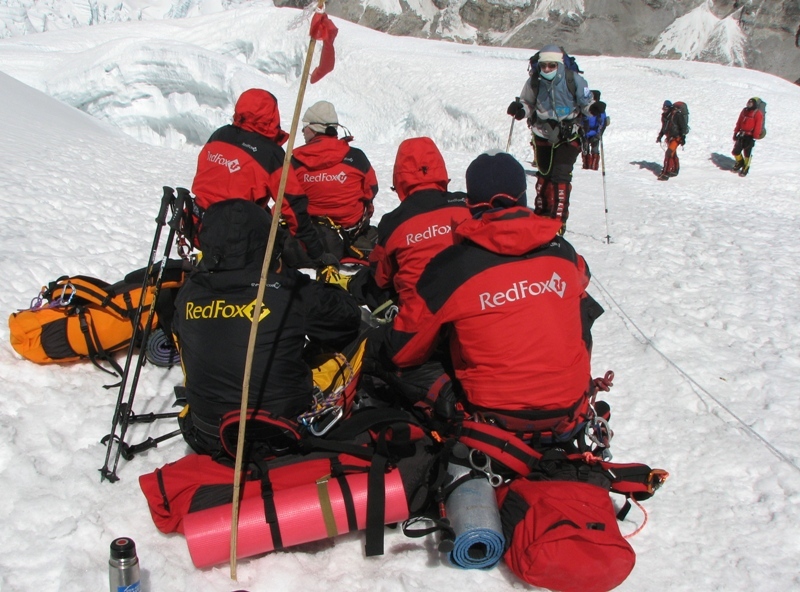 Group 1 passed 2 key route, closer to the top – the visibility dropped to 10 meters. 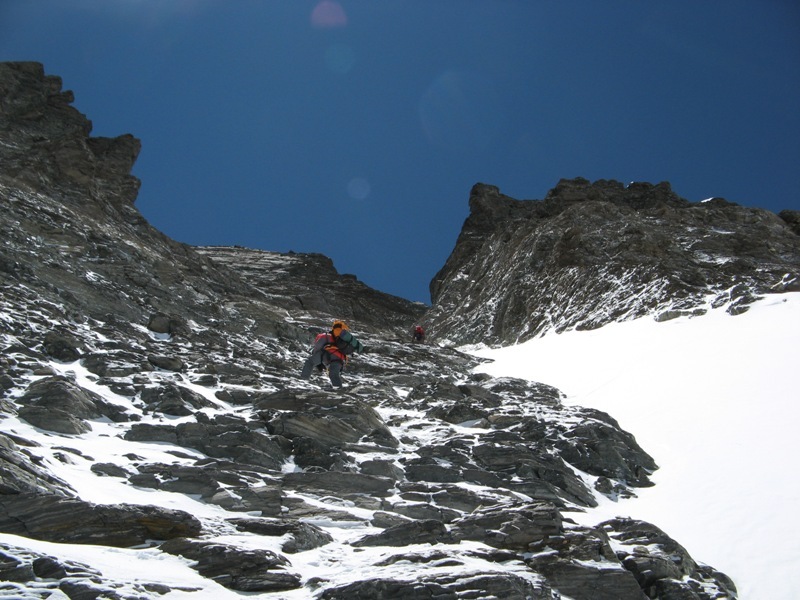 Further continuation of the climb and the more passing yoke was too dangerous to live. 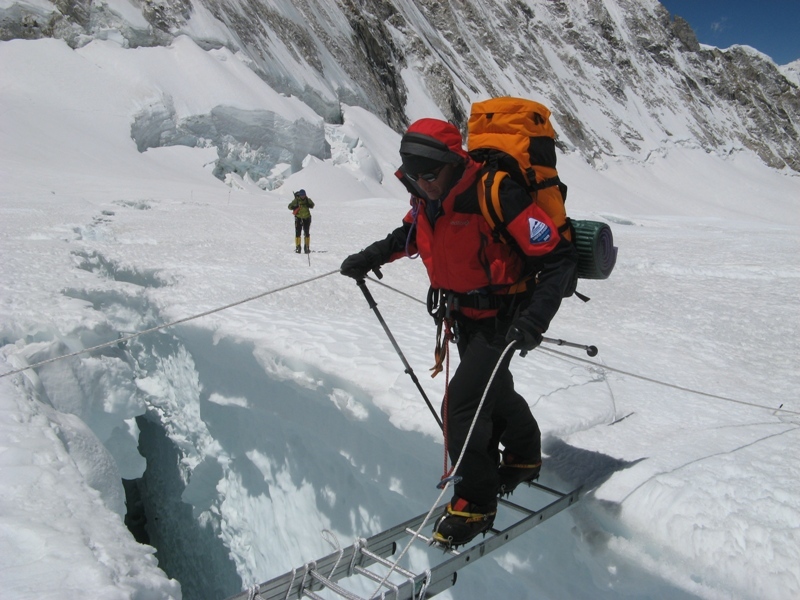 Group 2, published after the 1 st, sag 200 meters vertex margins and because of the outbreak of the storm, leaving at the end of railings another 250 meters of rope, turned back to the 4 th camp. 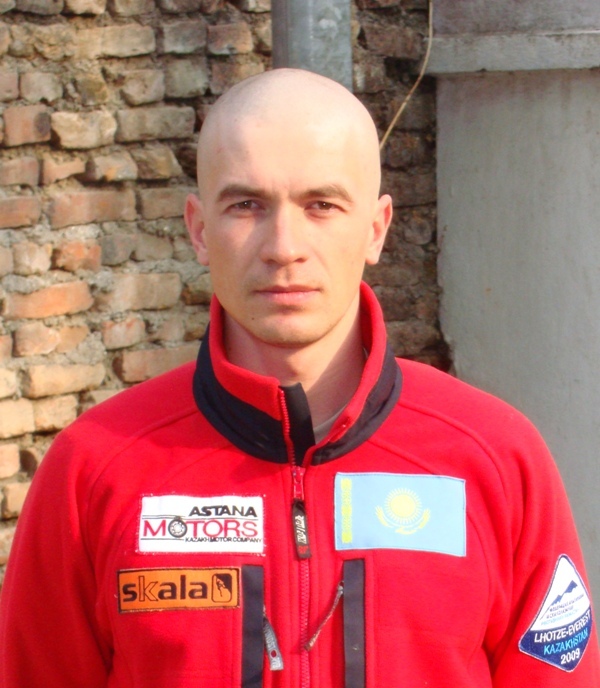 Total Kazakhstan team sag perilnoy 600 meters of rope on the route and added another 250 meters. 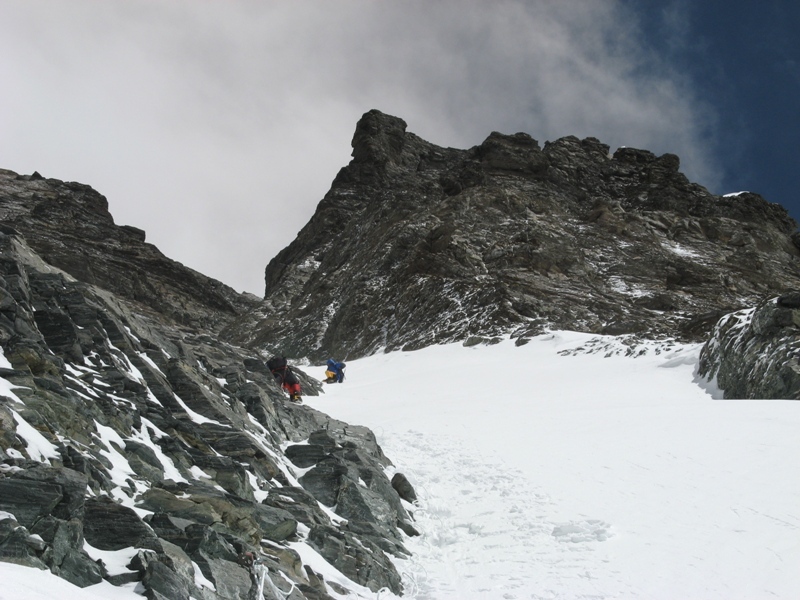 After much work on the processing route, the team left the necessary equipment at an altitude of 8350 meters. 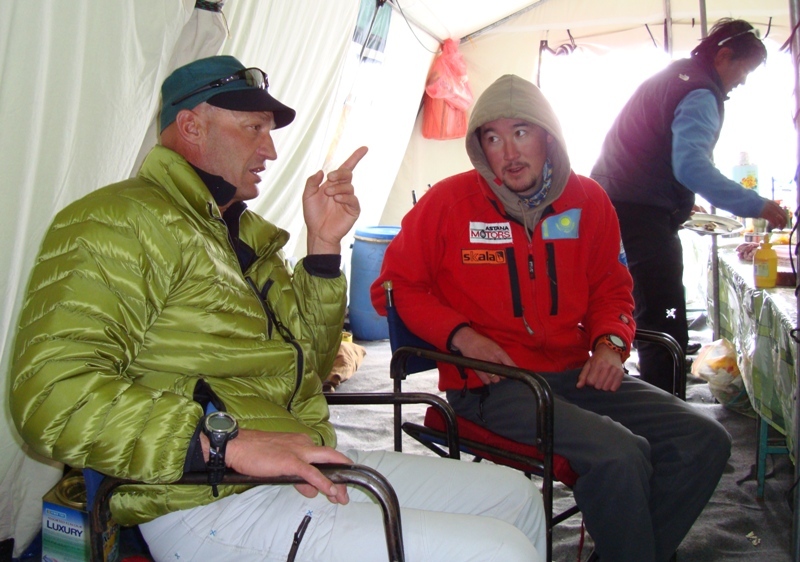 May 17, 2009, 1 st and 2 nd team as a whole returned to base camp. May 18, 2009, 1 day of rest and rehabilitation before re-assault. 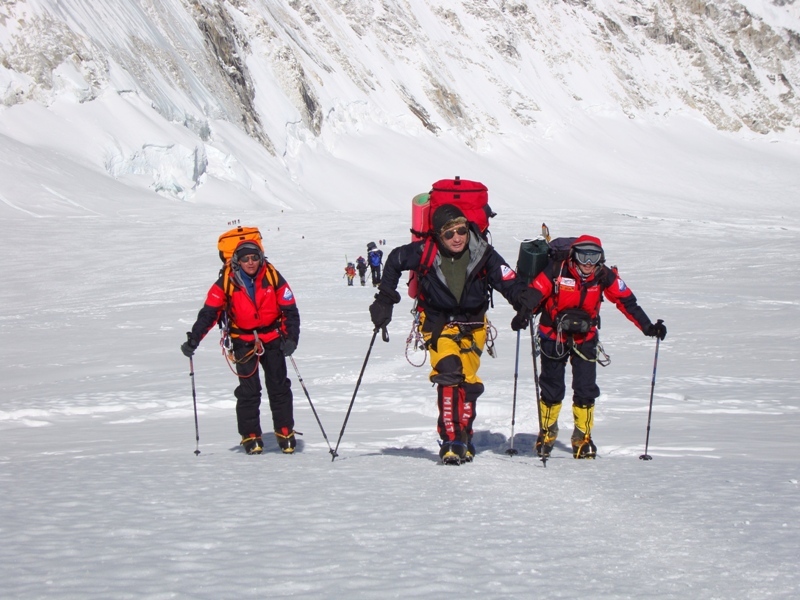 1 st group in the 4th camp, Group 2 on the approach. We need to do pad under the tent. Normal weather, we will pray that the night was warm and sunny day. Three o’clock in the morning, starry sky, and all began to gather in the assault. But during a breakfast at 4.15, weather fast start port, came out of BC in the snow. Ice fall passed quietly. 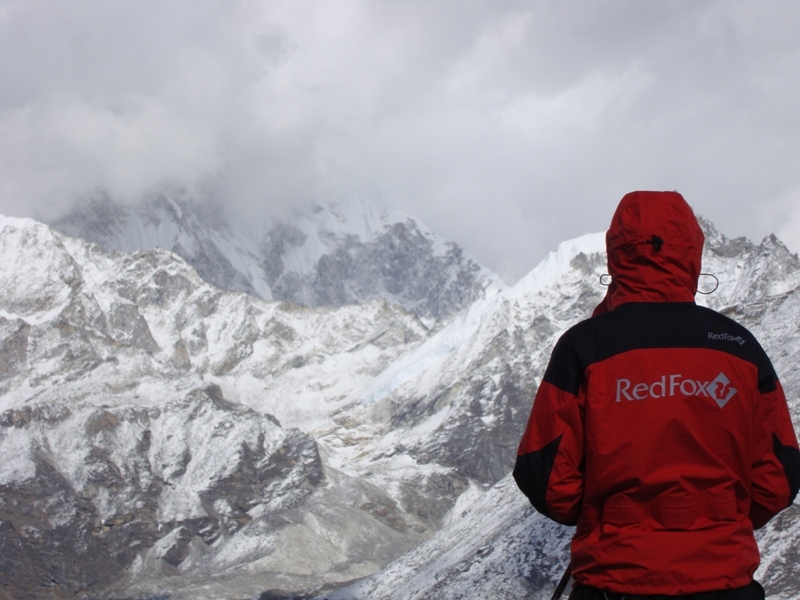 Low clouds, snow long flags … 7000m above mean hurricane wind blows. While going in the ice fall wind was not as soon as they came to C1 – blew. 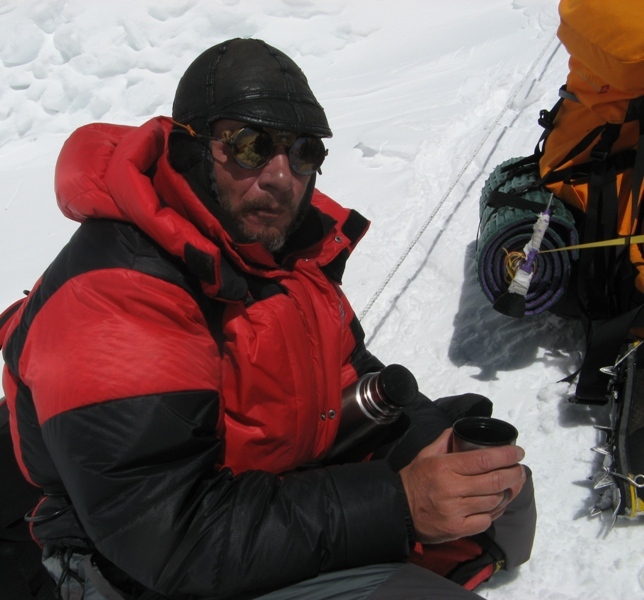 Lunch at camp 1 and went further – in the C2. 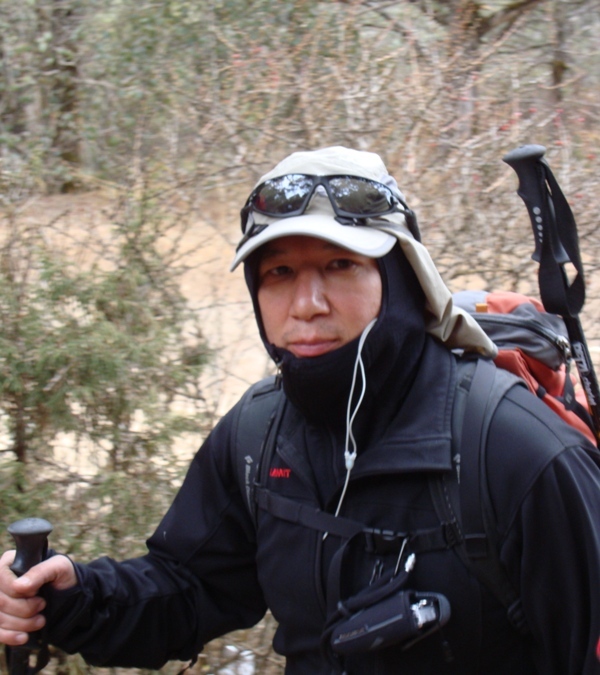 At the plateau the wind played with us, when confronted with the trail, forcing it to stop and cover the person handed. 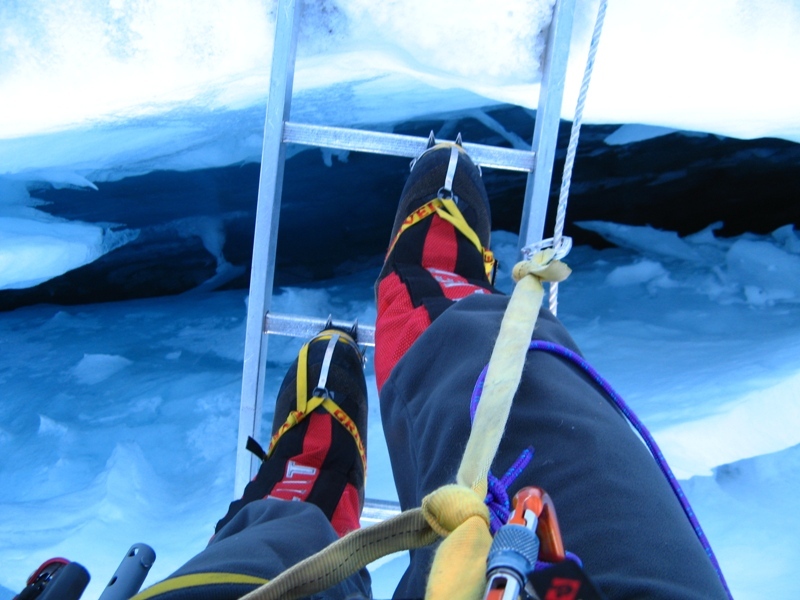 Gusts sometimes very strong – it was difficult to stand on my legs! 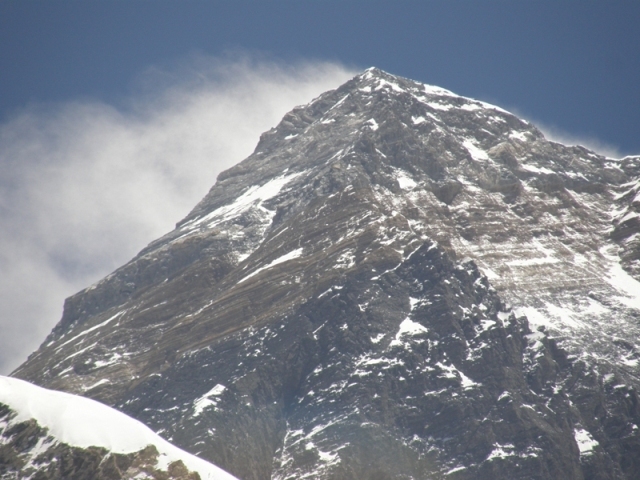 By the afternoon the wind and opened verse clear sky, but Everest is still abuzz. 1 st and 2 nd team safely arrived in the C2. Rest, drink juice. In the last acclimatization out sick Skopin A., during rest, he never recovered. 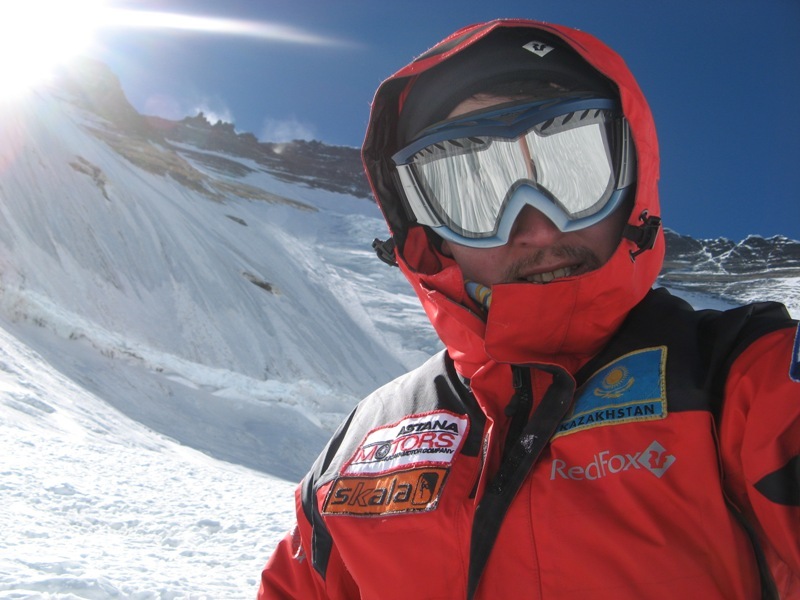 The doctor from the team “7 summits” is not recommended to do attempt the climb. In the second group Artem replaced Sergey Lavrov. Hey all! 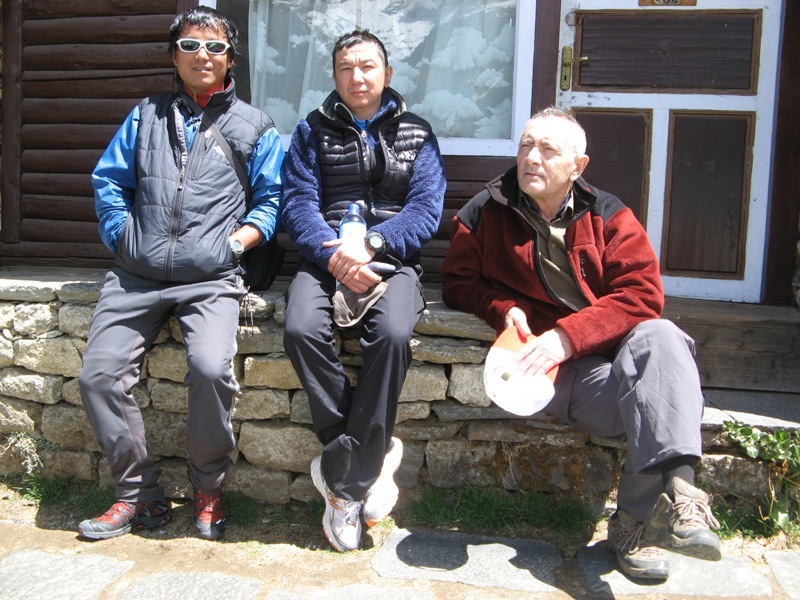 Today the team of Kazakhstan on climbing graduated health-restoring recreation in the forest zone of the village Diboche (3700m.) and went back to base camp. 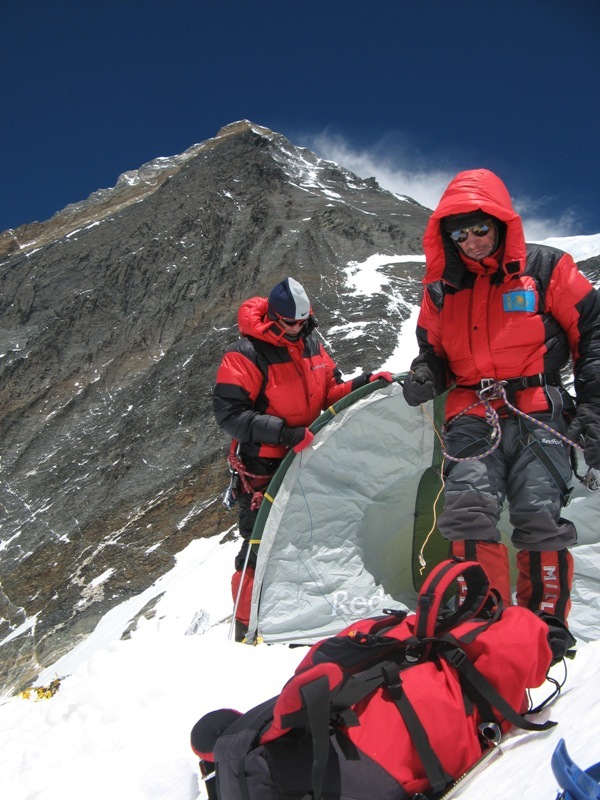 According to plans, tomorrow morning the team should arrive at the location of base camp. 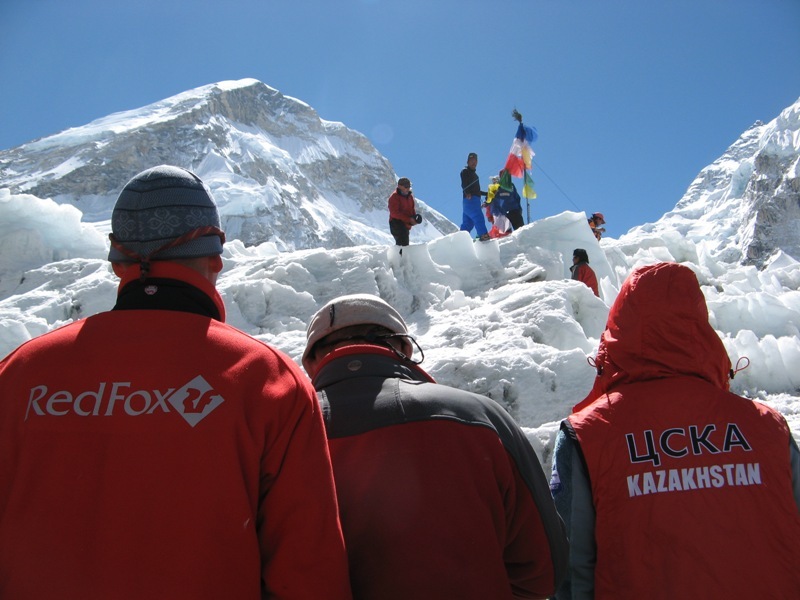 10:00 deuce Jumaev Maksut and Sergey Lavrov, left the base camp on the slopes of Mount Pumori, for visual inspection of the western ridge of the planned route of descent from the top of Everest in the yoke tops Lhottse and Everest. 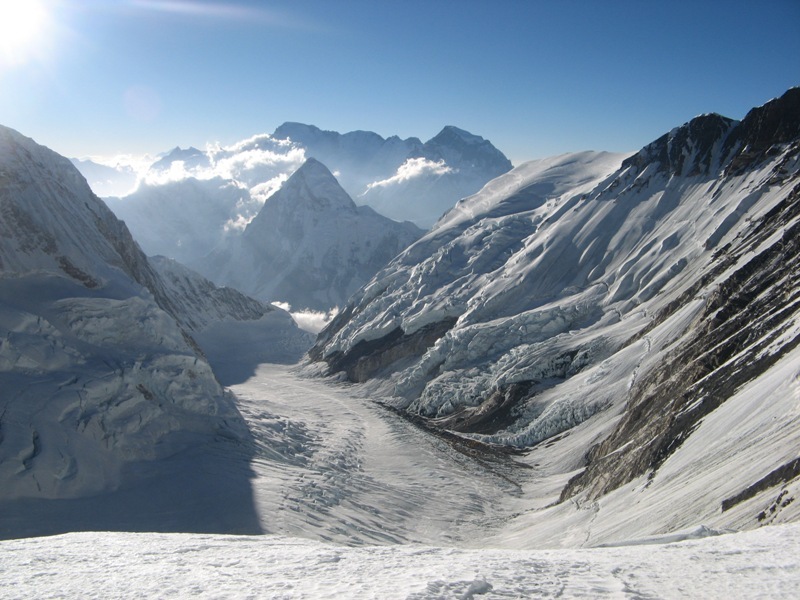 Approximately 11 hours of the day from the south-western slope of Everest, was the collapse of the glacier. 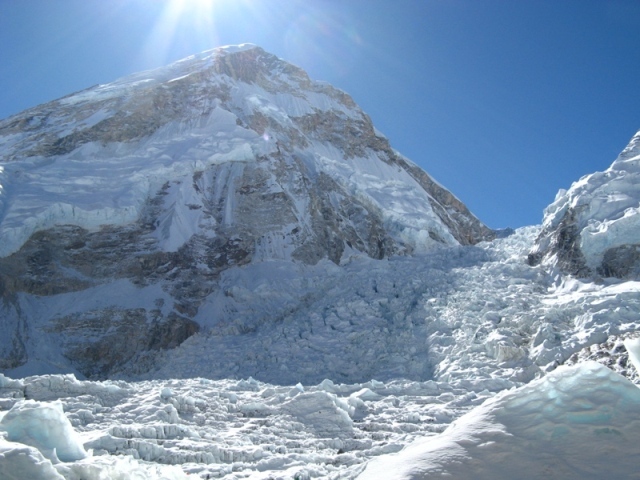 In the line of fall a huge mass of ice was the path that led from the base camp in the 1 st camp through the Khumbu ice fall. 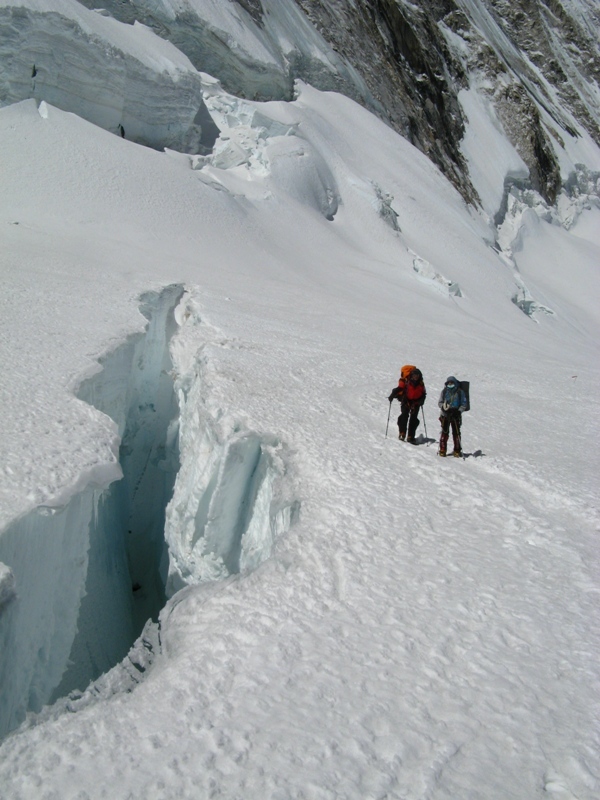 Unfortunately, at the time of collapse glacier the path was a group climbers, who descended from 1 st camp. 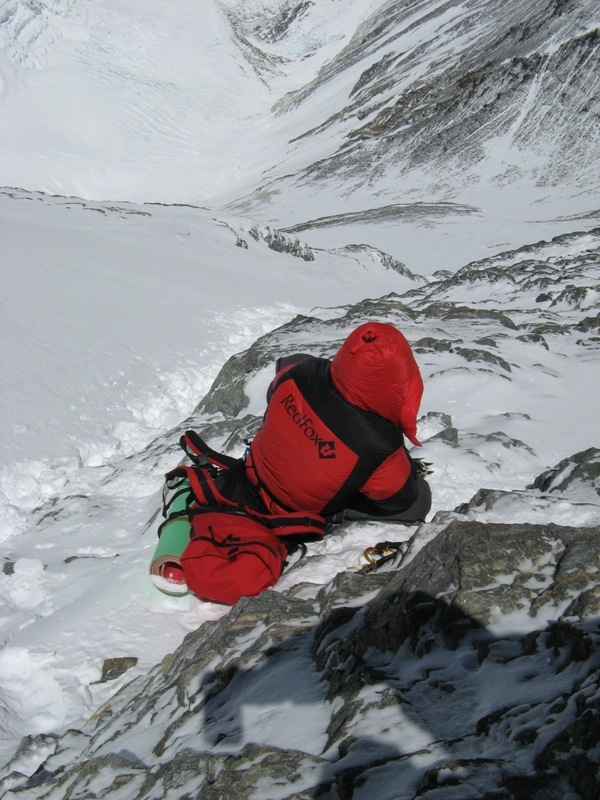 Immediately after the avalanche disaster in the region had become a large group of climbers in rescue efforts. 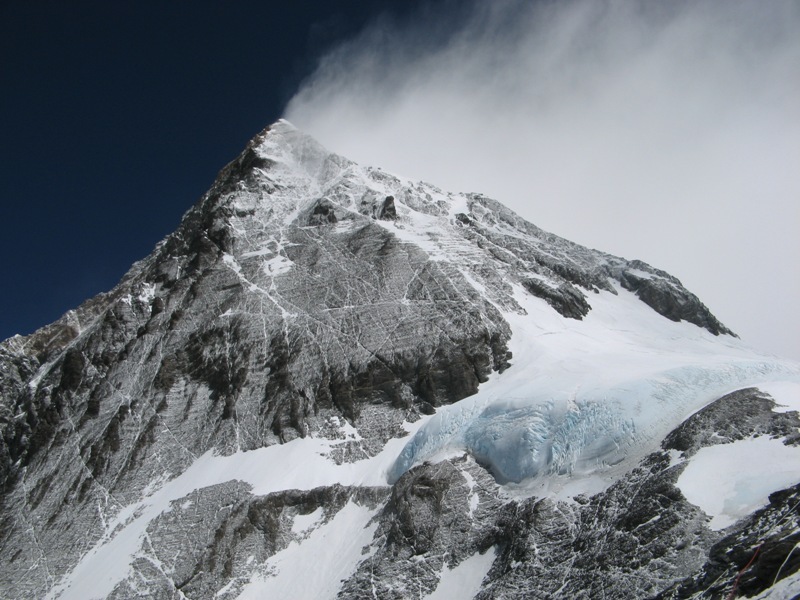 According to rescuers, the magnitude of an avalanche is not large, but the shock wave was strong. 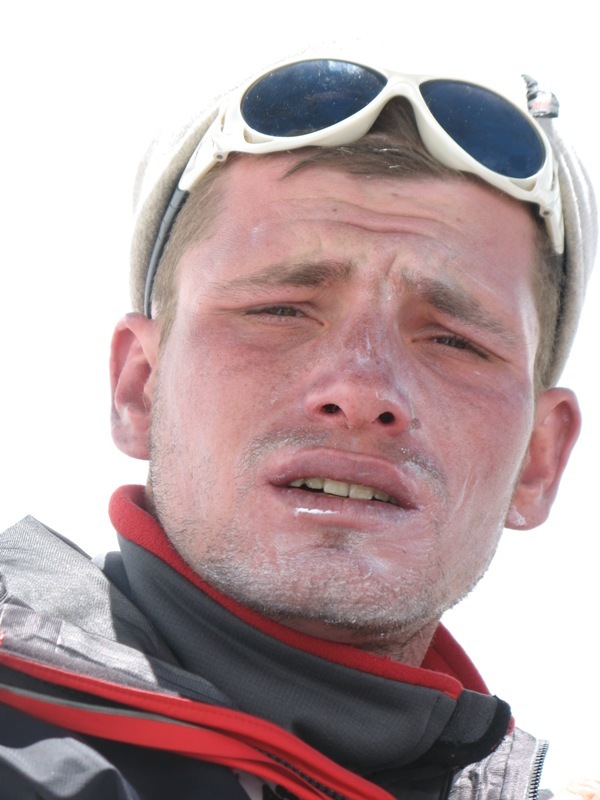 Snow avalanches of dust in a matter of seconds reached the base camp, and covered it completely. 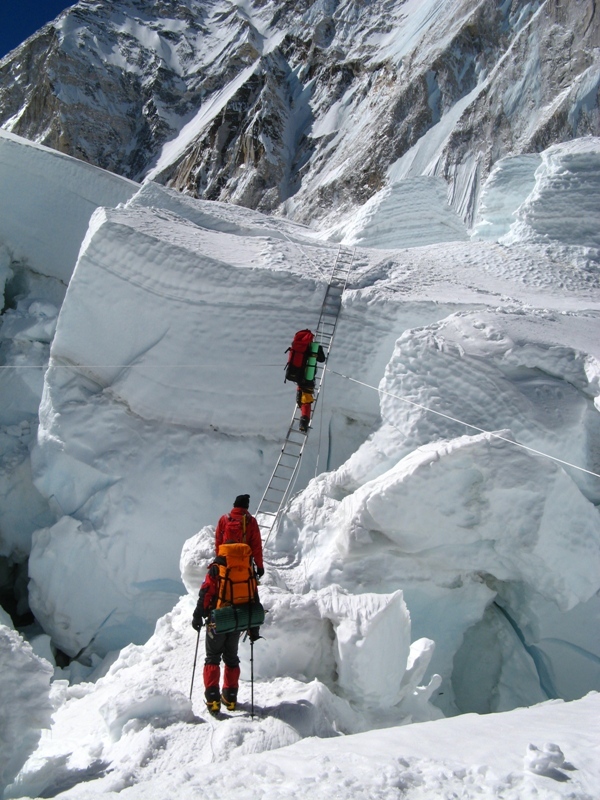 Group of climbers appeared to be in the midst of trying to escape an avalanche of ice fractures. Those who managed to hide in the crack saved their lives. Rescuers noted with regret the loss – 1 person. At the site were found only a backpack and shoes missing person. 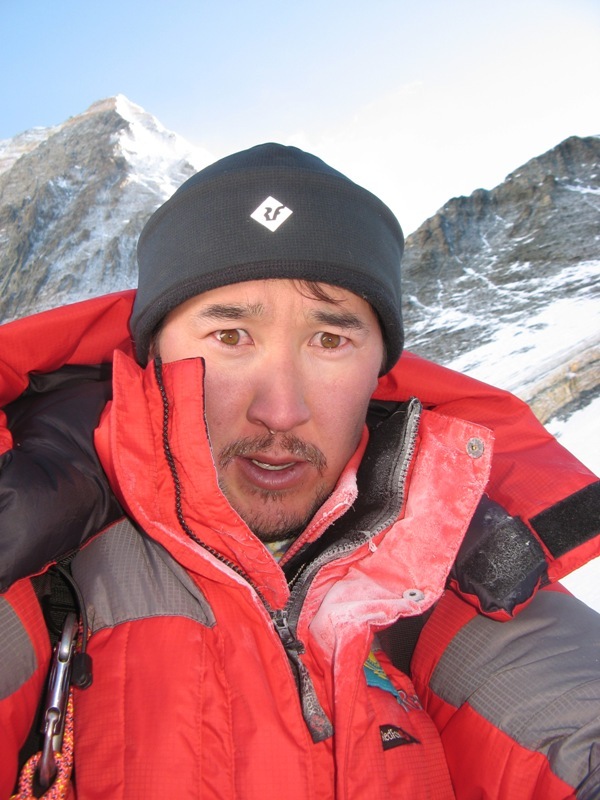 This young guy, Sherpa, who worked as a guide to international environmental Eco-Everest Expedition 2009. 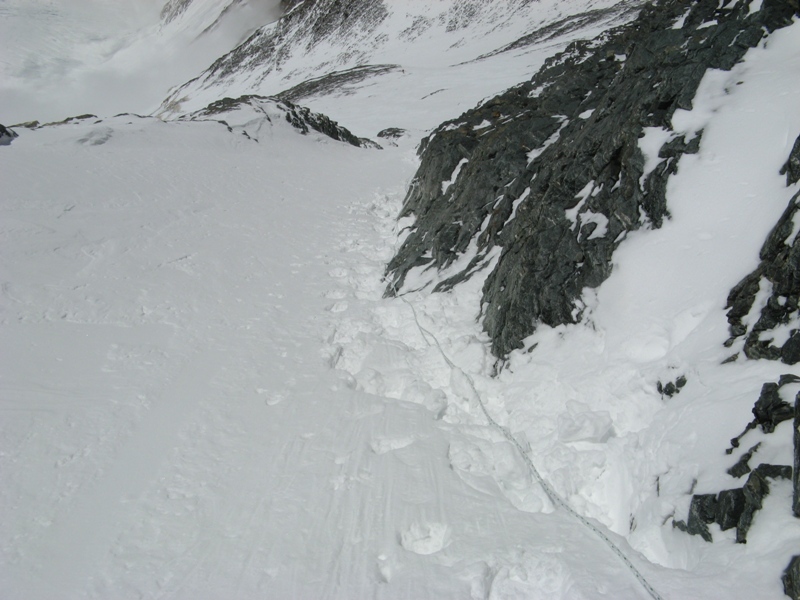 Temporarily halted the search because of the danger in the daytime decay of new avalanches. 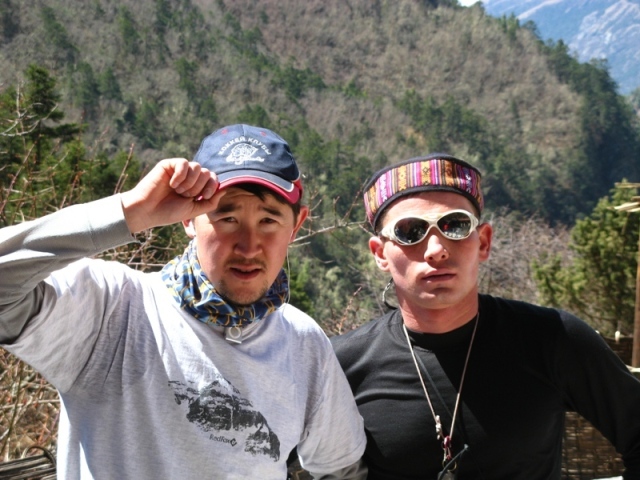 Out of Kazakhs and Russians was uninjured! 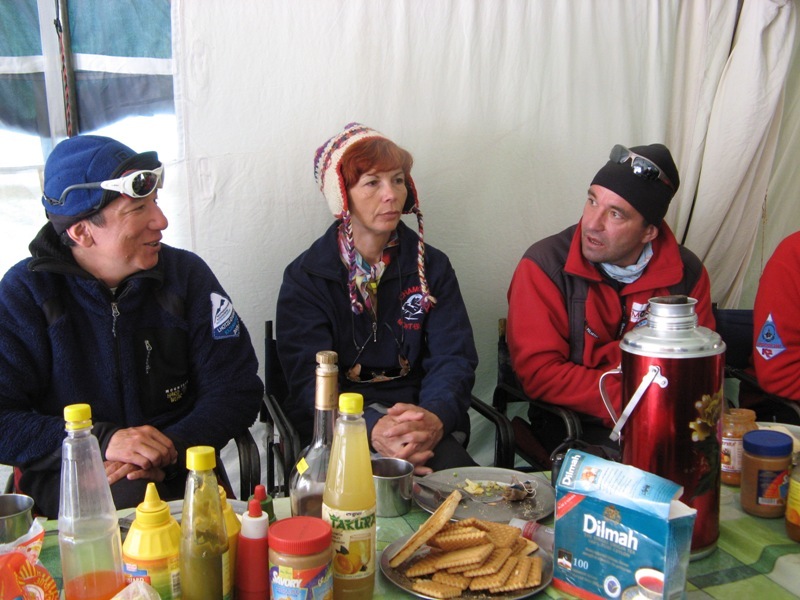 Early in the morning to visit Kazakhstan expedition came to friends. 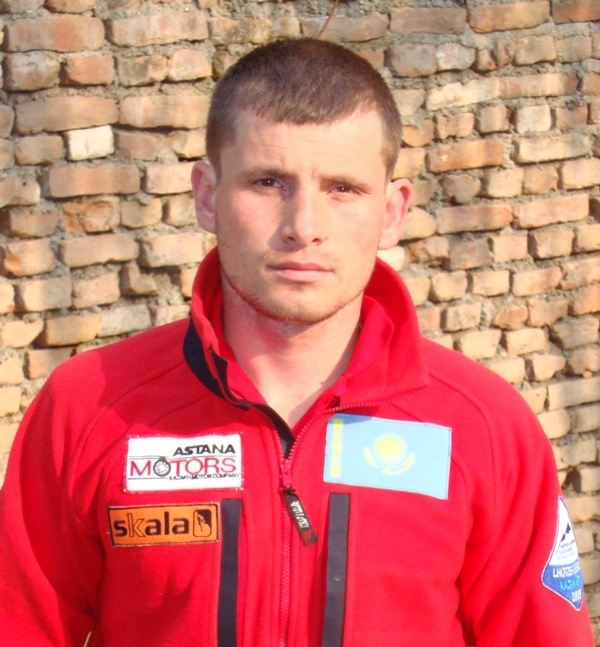 Friends have a long way from Almaty, for the sole purpose to support the national team of Kazakhstan on mountaineering. 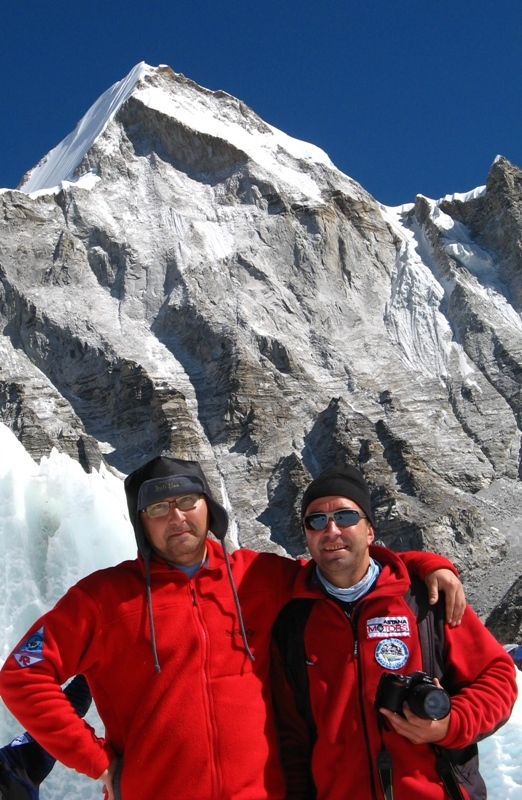 Among Friends LSGA by climbing Savina, Chechulo doctor, journalist Kaparov Adam, head of the group Raspopov Alex. 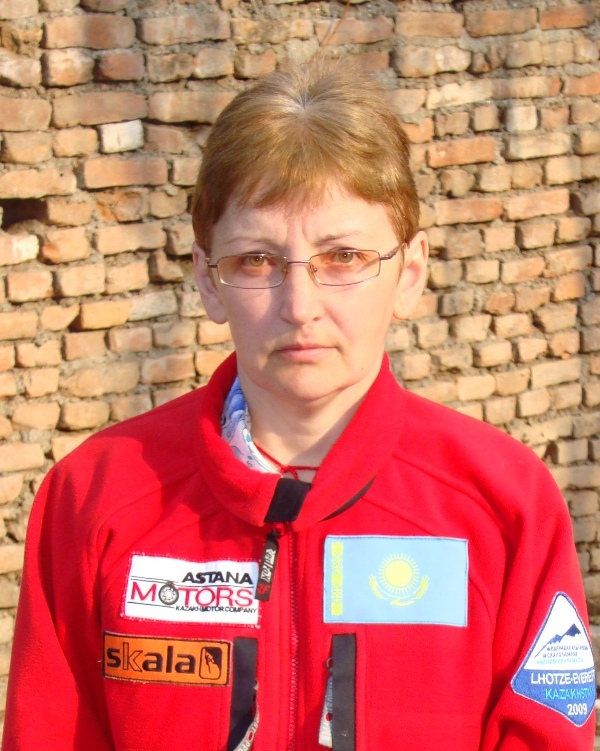 Inspirer and the general sponsor of expedition Smagulov Nurlan, unfortunately, was unable to personally support their visit. 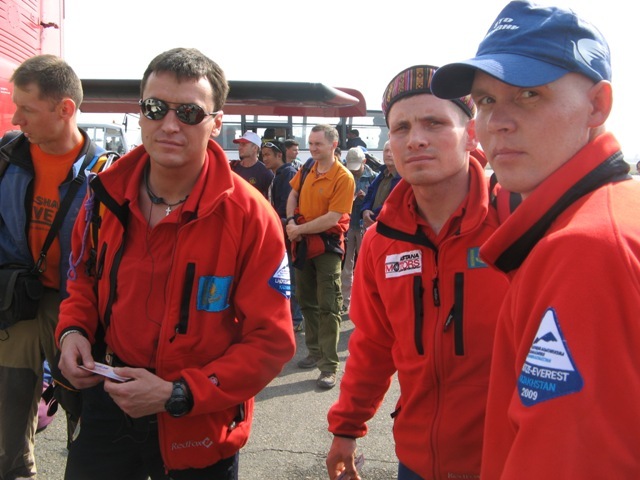 But handed hotels for members of the expedition, it “kazy”, “Kurt” and lard. After sharing breakfast dear friends from his native city of Almaty went back. 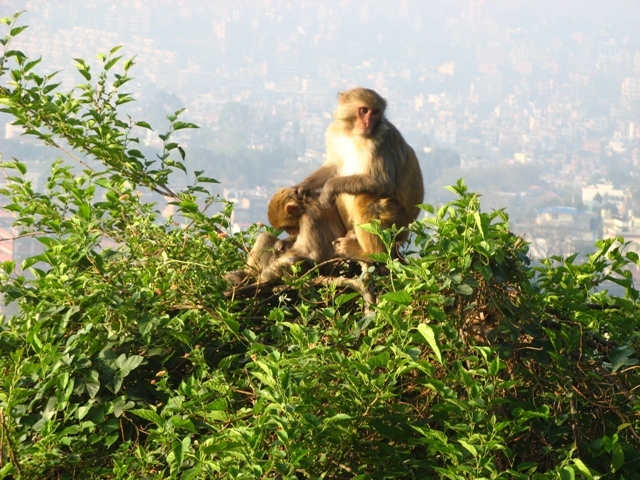 Today in Kathmandu went second liaison officer, and this time the health problems are not allowed to fulfill their duties until the end. 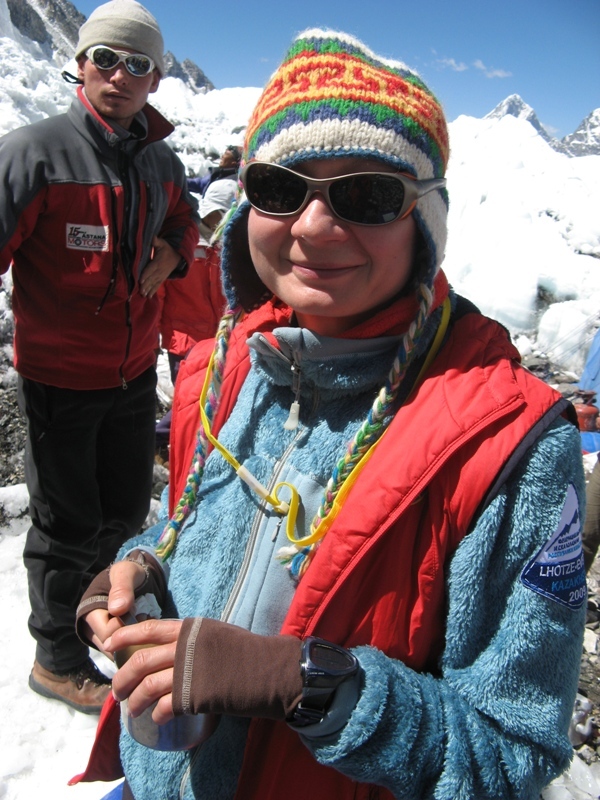 By the afternoon came Gerlinde Kaltenbruner with your friends, we discussed plans for a joint ascent to the summit Lhottse (8516 meters). 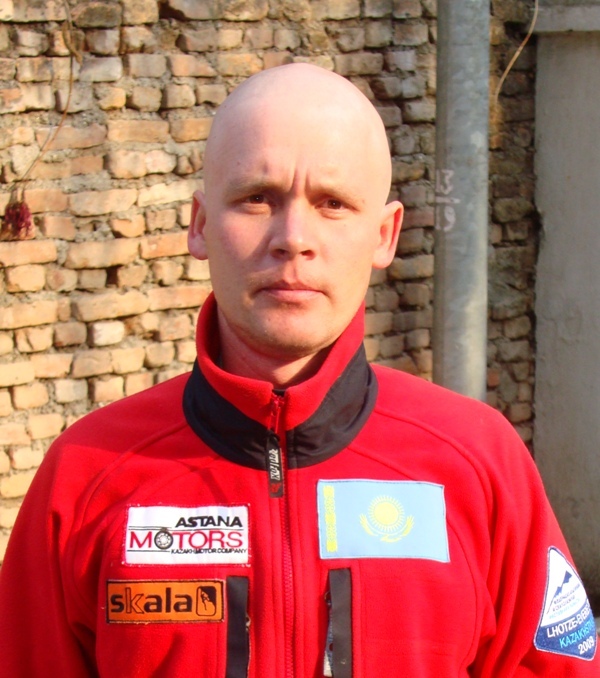 From Kazakhstanis expect that they would handle the first route to the summit. Information from the team: rest in the forest zone passes qualitatively, all feel excellent. After breakfast, a liaison officer was forced to go down. Another liaison officer left, the challenge to follow the procedure in the base camp and manage relationships with the local population and authorities. 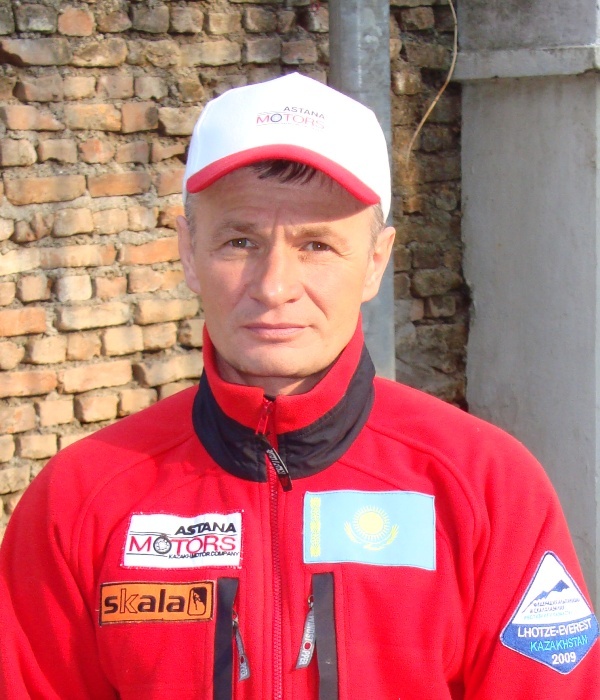 Today birthday Baghlan Zhunusov, right humbly, for sport. 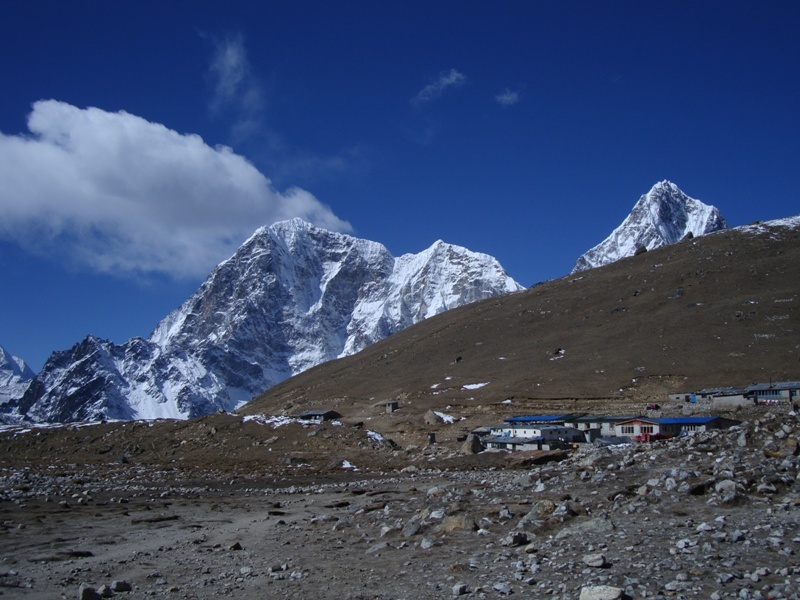 After breakfast, the main team went down to the village Dingboche (3700m.). 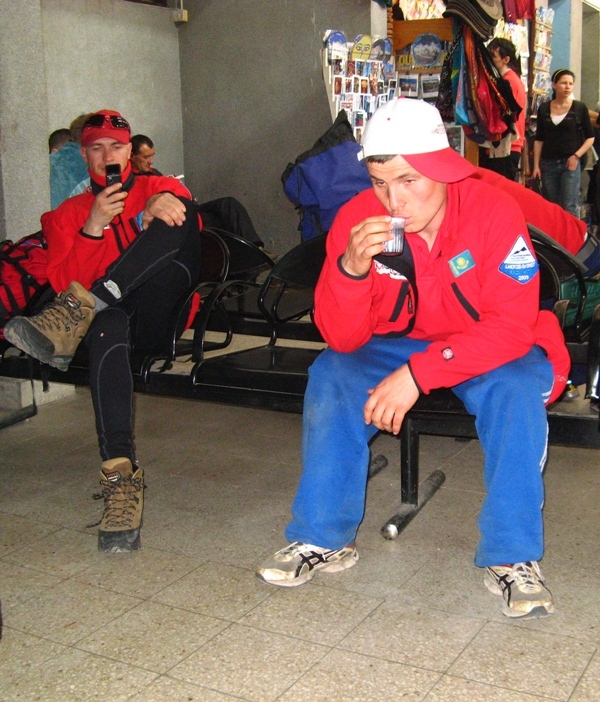 Relax in front of a decisive assault in the forest area will help climbers well recuperate. 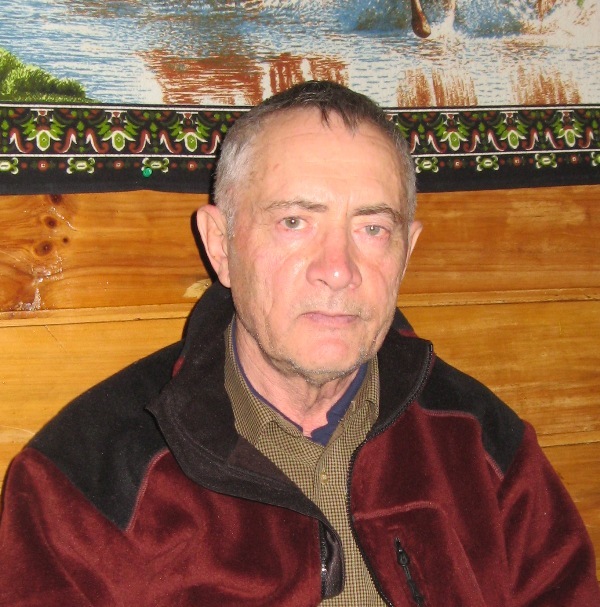 In the base camp were Ilyinsky Ervand, Zhunusov Baglan, Sergei Lavrov and Jumaev Maksut. For athletes went down and the group of tourists from Almaty, Moscow and Ukraine. After lunch, the weather deteriorated, went snow. 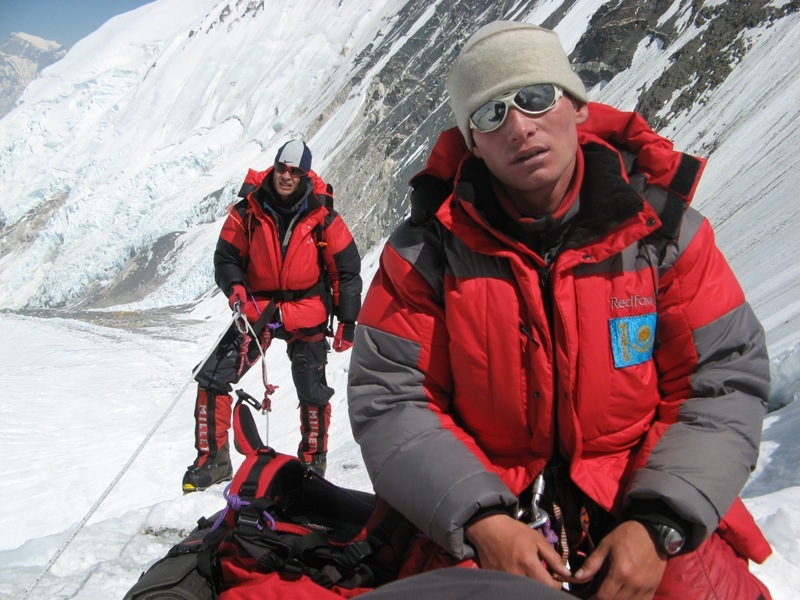 At 13:00 in Kazakhstan reached the base camp, two liaison officers, which are enshrined in Kazakhstan’s permit to Lhottse and Everest. One officer had been signs of mountain sickness, we gave him medicine. 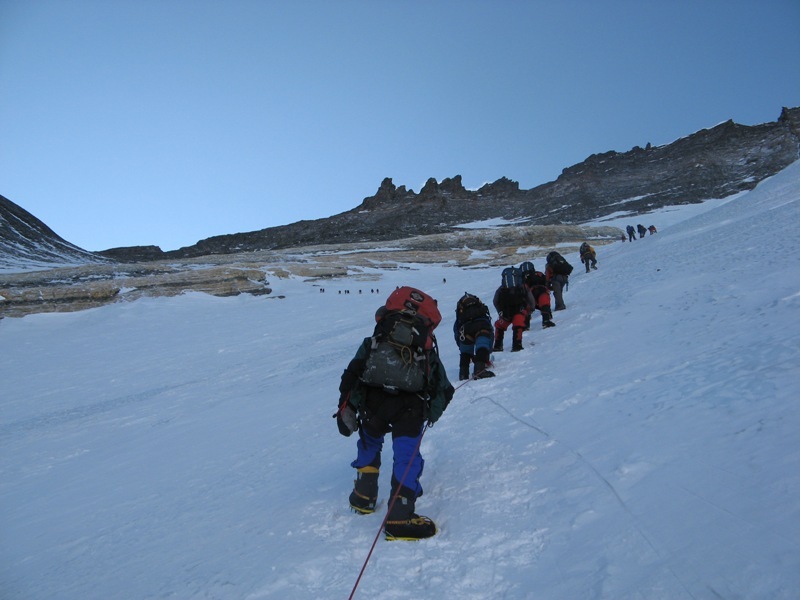 1 st group early in the morning withdrew from the camp 2 (6500m.) and 08 in the morning came to BC. 2-nd and the 3rd group the day before they came to the base camp. 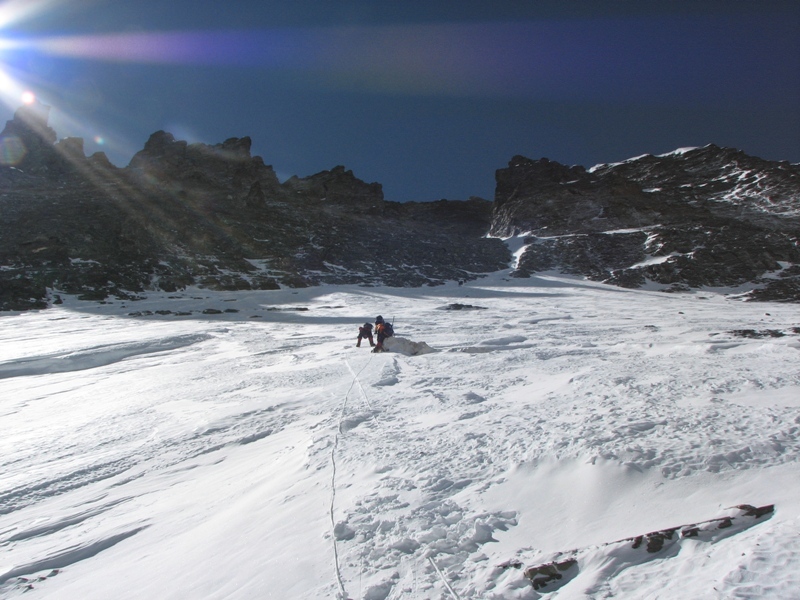 3rd acclimatization withdrawal became crucial, and now all teams are ready to assault the vertices Lhottse (8516m.) 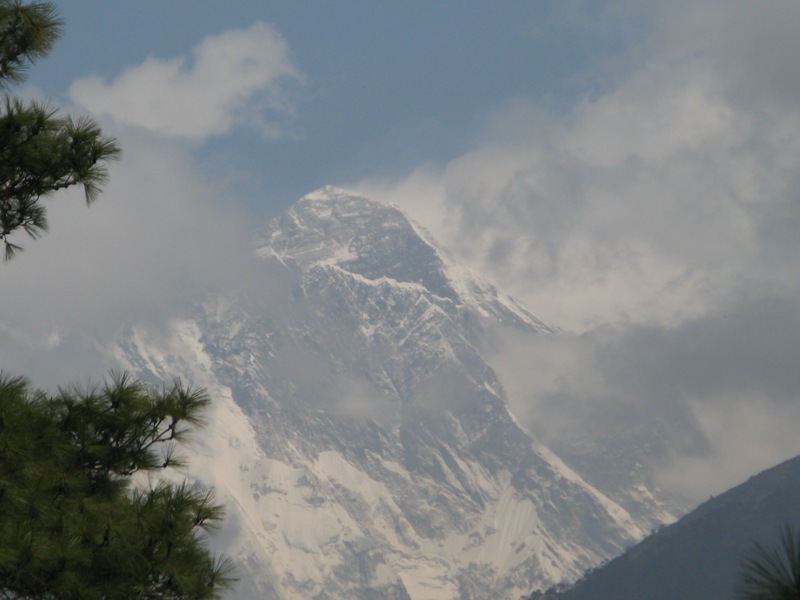 and Everest (8848m.). Group 1 returned to the high output of C3. 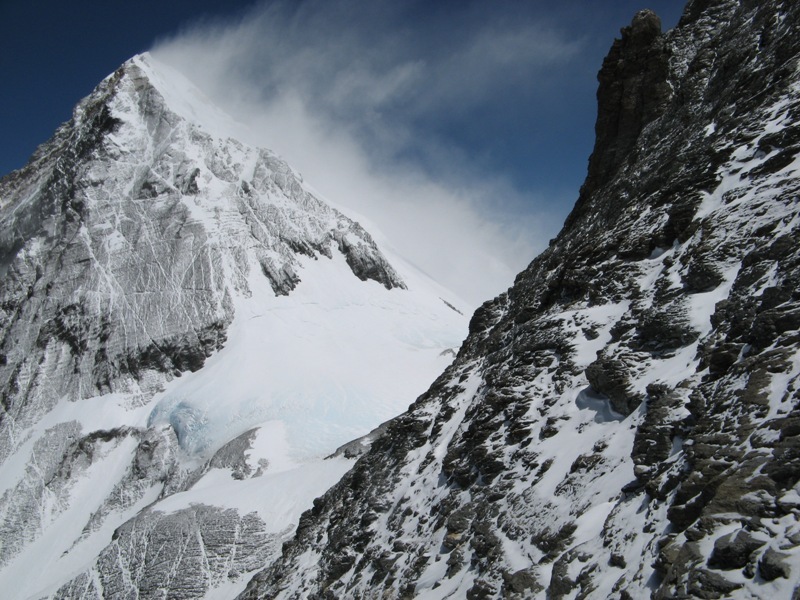 Today is divided into 2 groups – the first thing brought to the southern saddle, the second found assault camp (7900m) at Lhotsze. 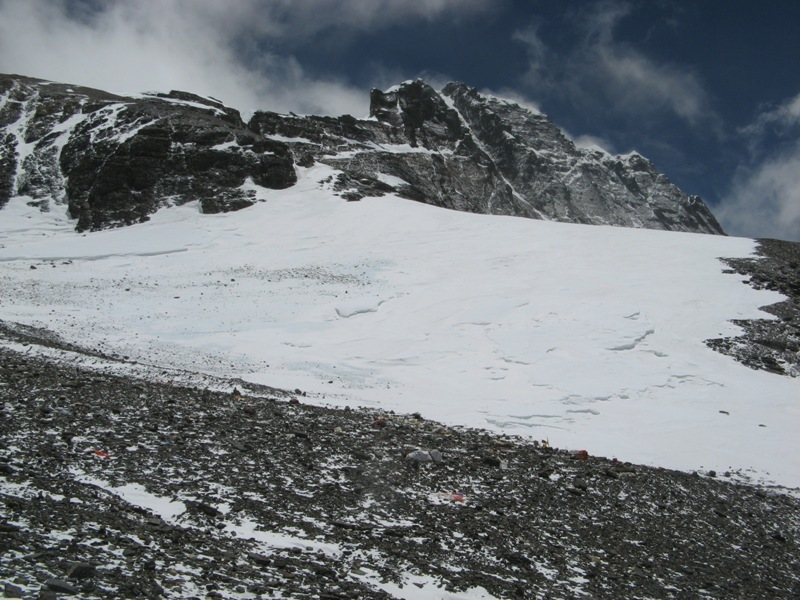 We descended to the glacier, will soon arrive in the 2 nd camp. 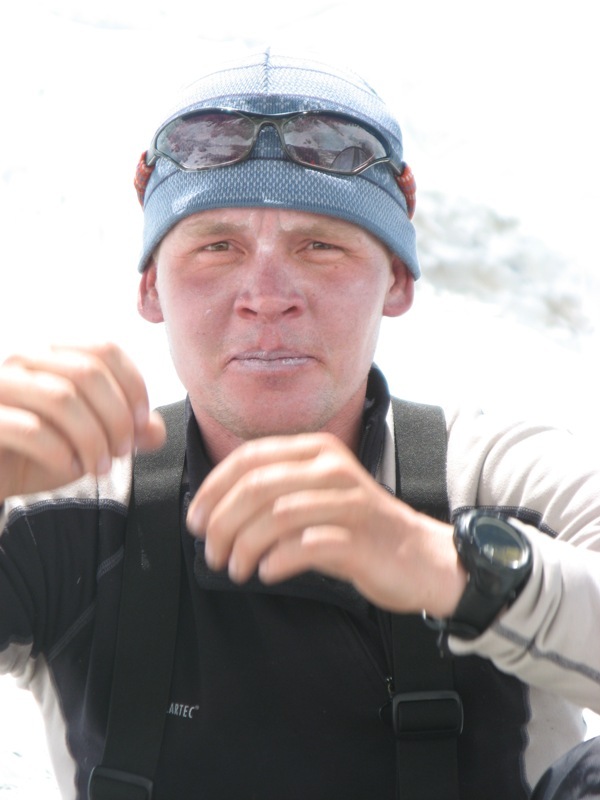 All tired, spend the night in the 2 nd camp and tomorrow later in the BC. Pulls cloudy. And so, intact, healthy … ALL BIG Hello! 1 st group in С3, Group 2 went to 2 hours later and is now going up on ice slope. Wind is not, very hot! 3rd group supplied С3 at 100 meters below. 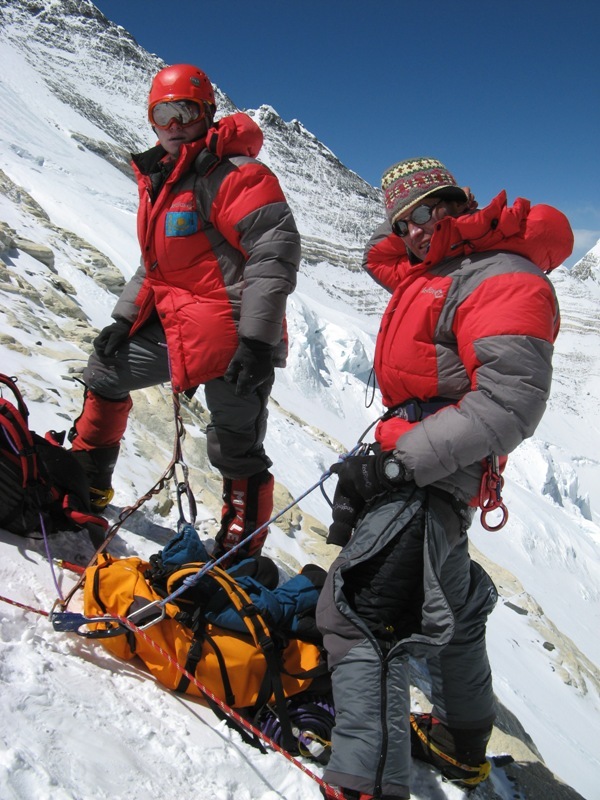 They came in C2 (6500m), at the bottom pulls cloudy. The tops of the clouds, but over the camp until the sun. 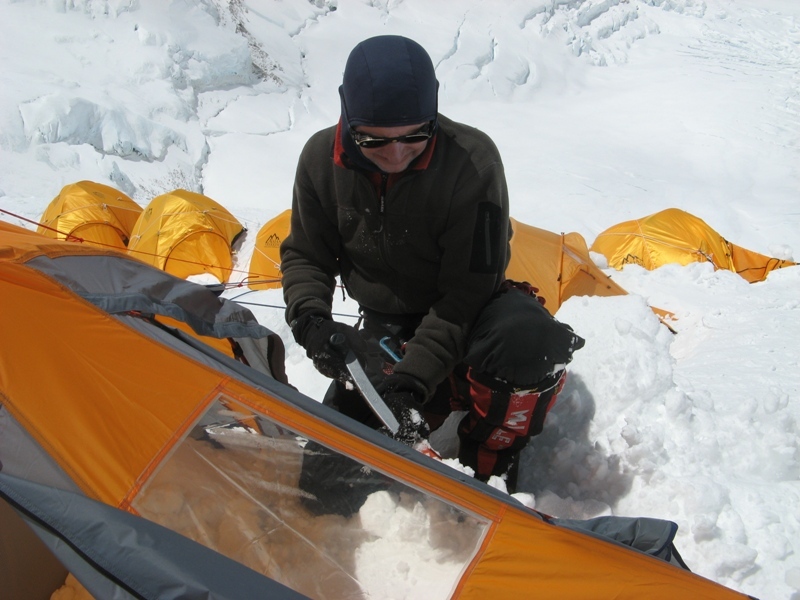 We decided to change the location of tents, as well as on-site water accumulates. At Camp 2 went up, all 3 groups. 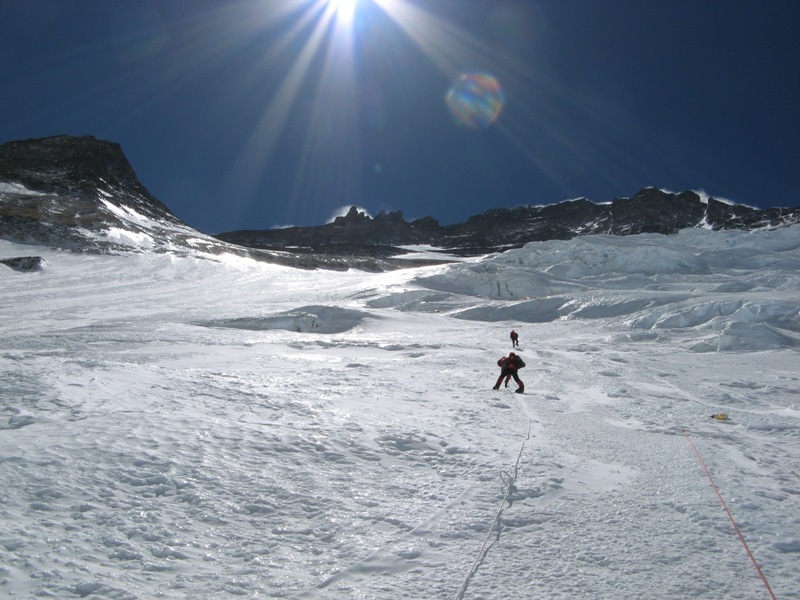 Tomorrow, all the exits in the C3 (7400m). Already a 2-second camp shows that C3 many tents. Feelings and mood all good! The second day of rest. 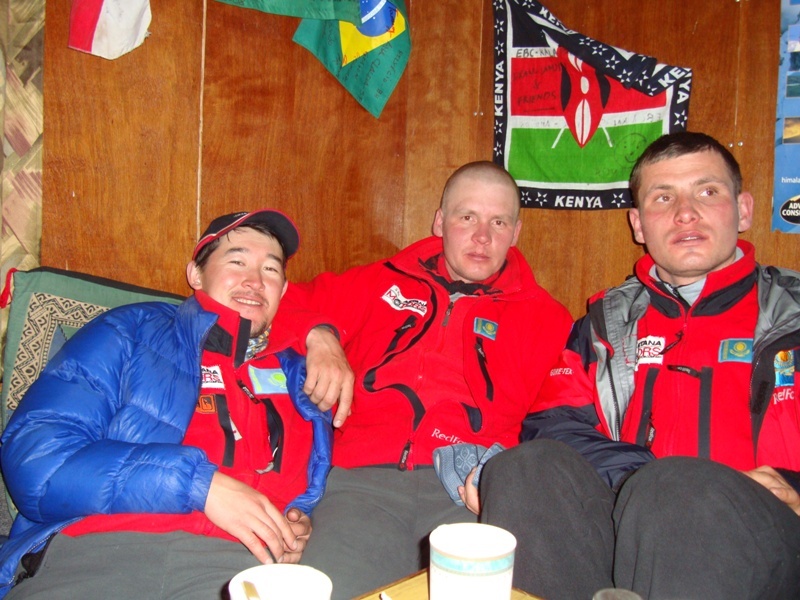 By the Kazakh expedition came to visit. 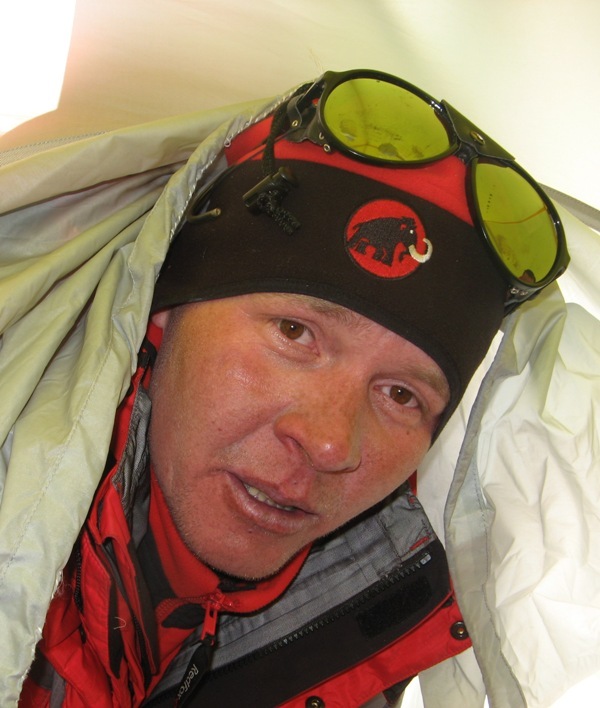 First came the leader of Krasnoyarsk at the peak of Pumori Expedition – Nikolai Zakharov. 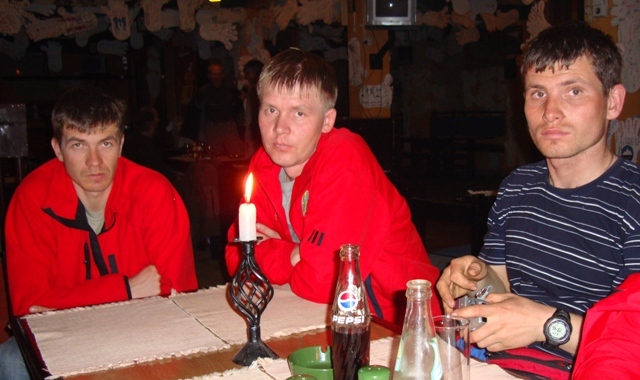 Senior trainer and instructor authoritative N. Zakharov had mental conversation with old friends, E. Ilyinsky and D. Grekov. 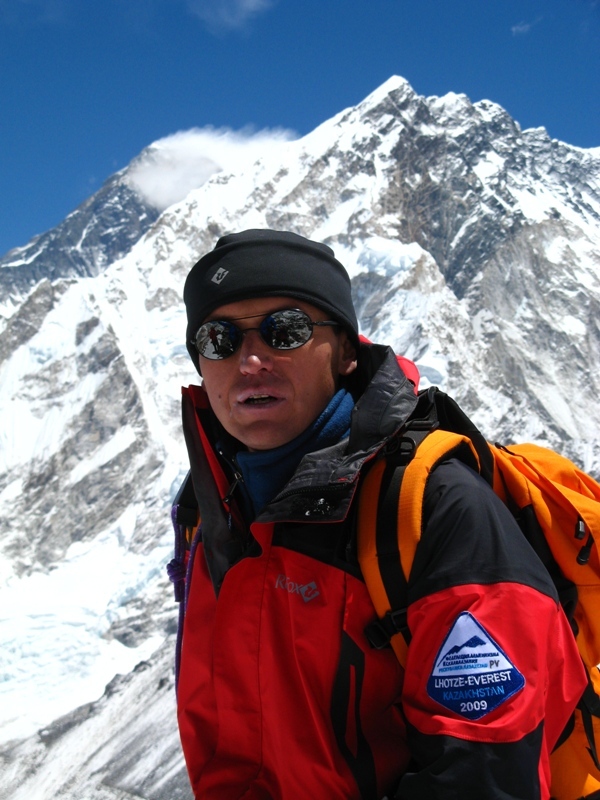 He described the new school projects Krasnoyarsk climbers. 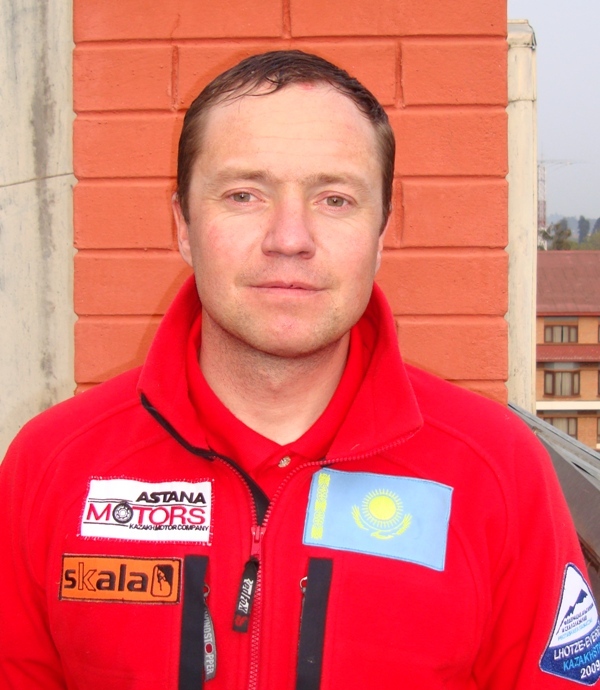 Then the guests arrived at Silvio Mondenelli (Italy), he has been involved in projects of the national team of Kazakhstan on mountaineering. 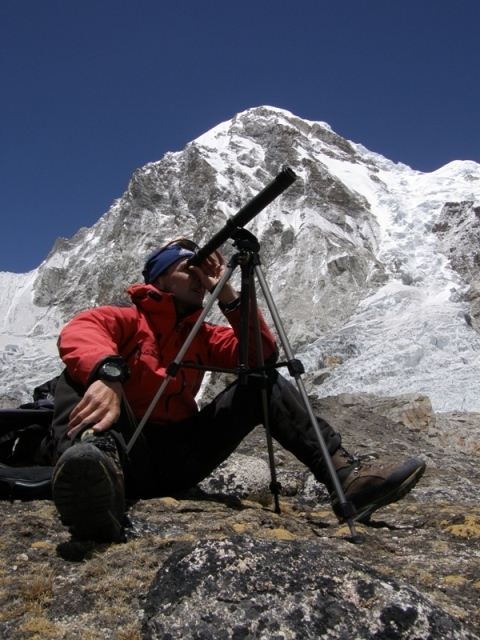 Now Silvio leads research in an international research lab studying atmospheric phenomena in the vicinity of the peak Everest. 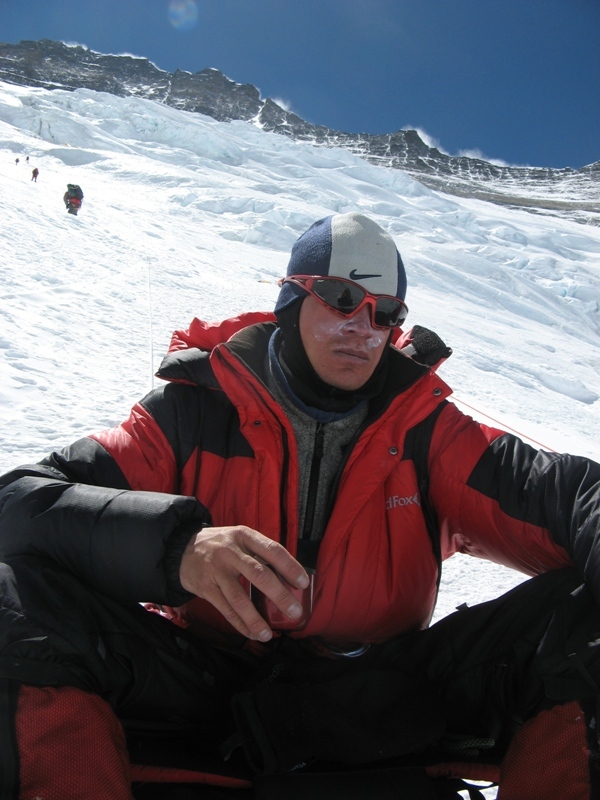 He reported that serves gauges, which installed around Everest. 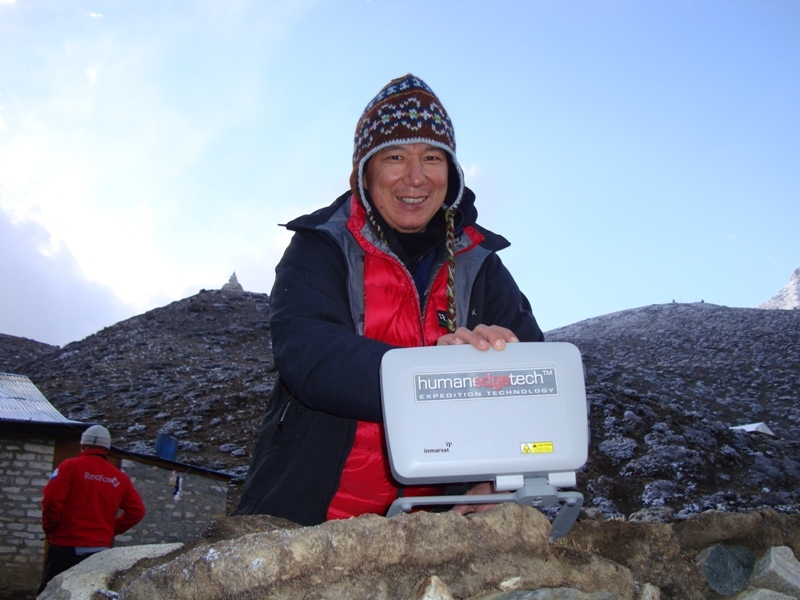 One device is installed on the southern saddle peak of Everest, 8000 meters height above sea level. 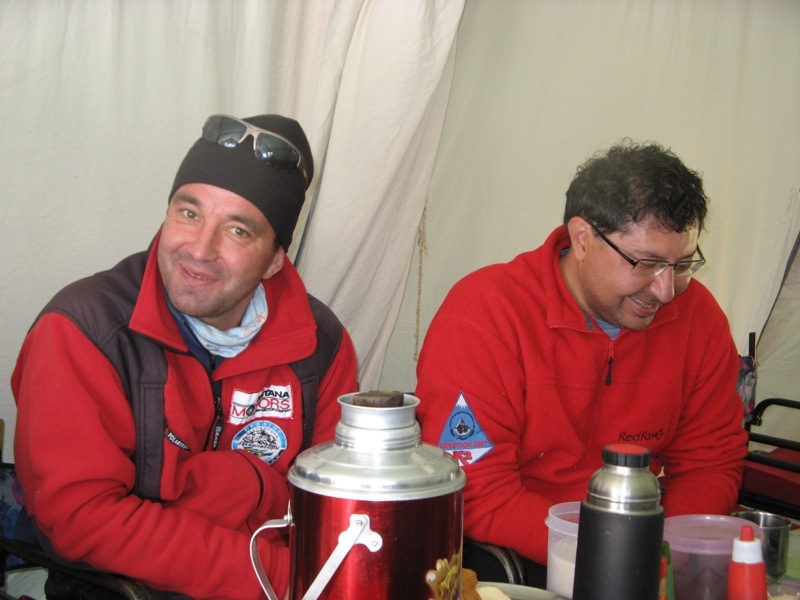 According to Silvio, April 25, 2009 on the southern saddle was recorded daily temperature of -22 degrees Celsius. 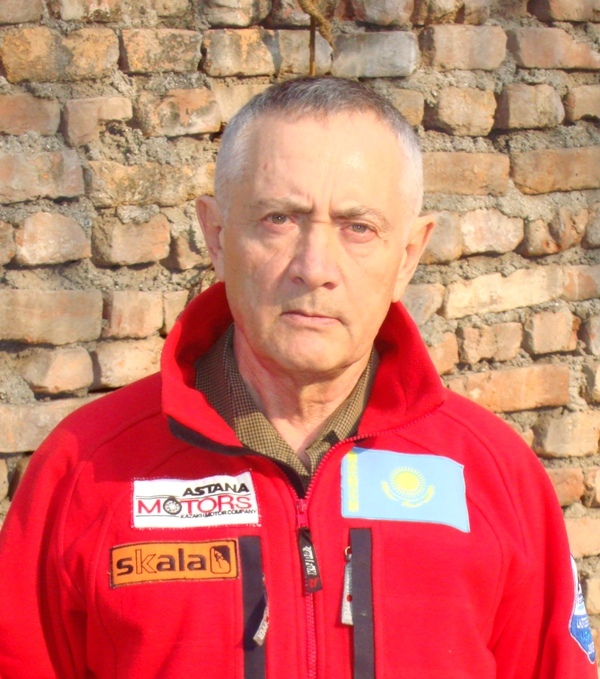 It should be noted that in 2008, Silvio Mondenelli completed the program 14 8000+ without the use of supplementary oxygen. Feelings and mood of the team is good. All convey greetings to relatives, family and friends! Yesterday all safely descended to base camp. 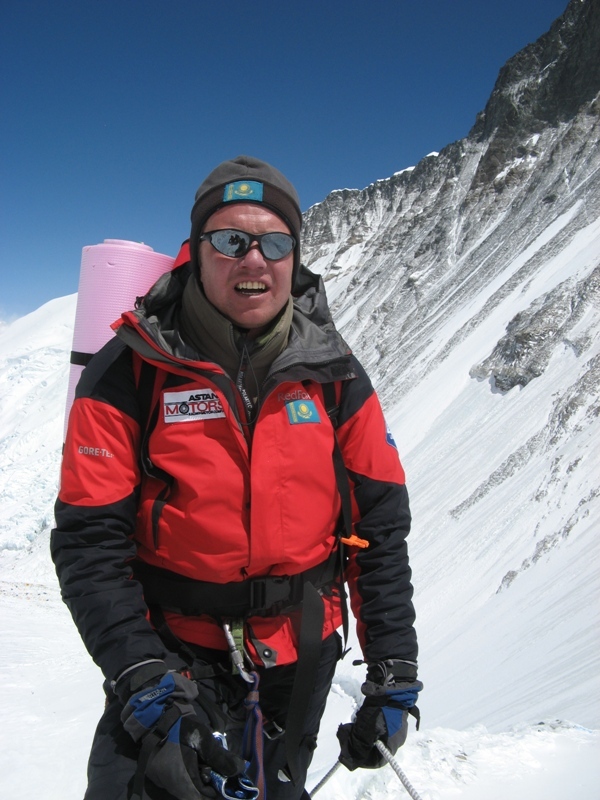 Having successfully completed the second acclimatization output. 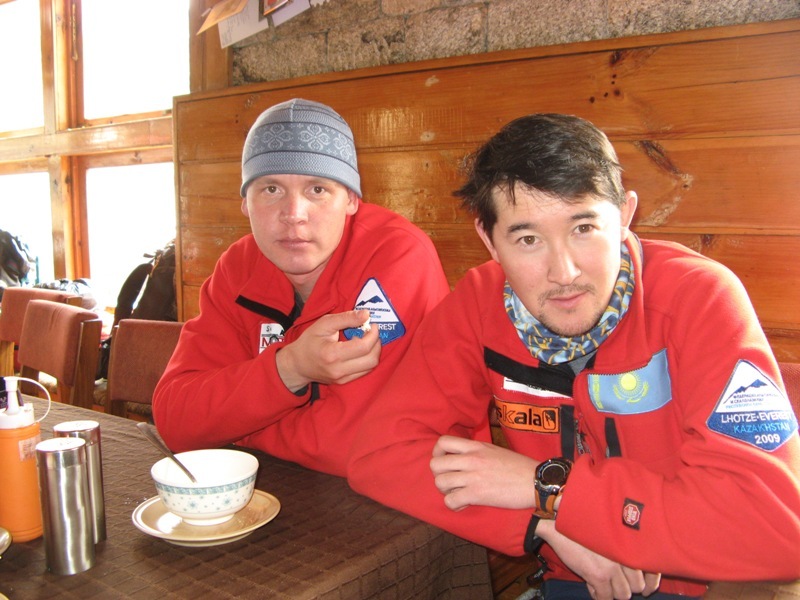 Kazakh climbers first established 3 high-altitude camp at an altitude of 7400 meters and spent two nights there. Now all the rest, eat and empty. 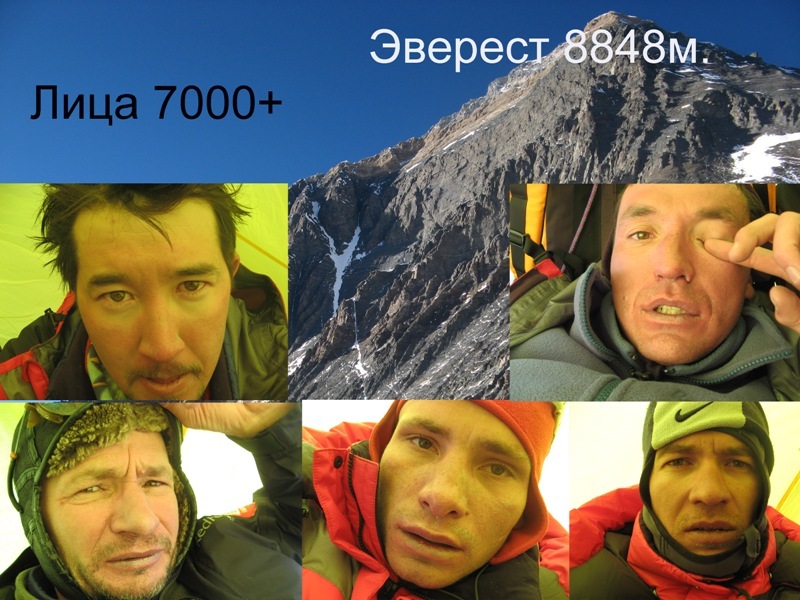 1 st group raised С3 with 7100m to 7400m. The terrain has not changed – the ice. Venues under the tent of snow and ice, but we have found convenient and safe places. All day the wind. 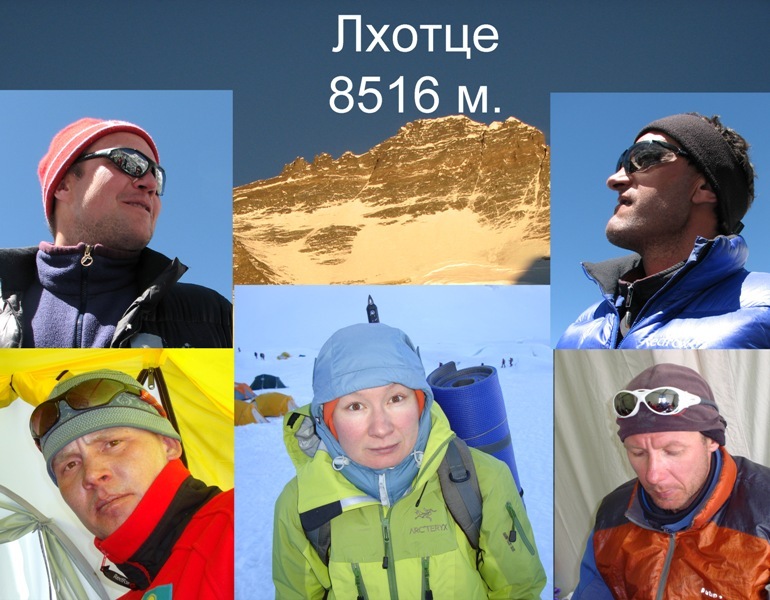 2 nd group today came out of the С2 at 7100m, this is the first output group of above 7000m. After the night, tomorrow morning team up to C3 in 7400. Then descend to BC. 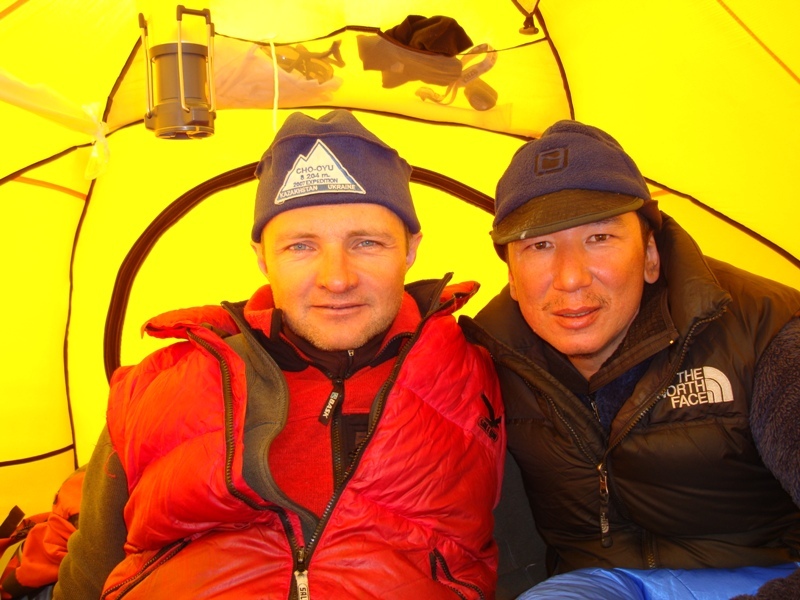 Baglan Zhunusov and Sergei Lavrov made the radial exit from C2 to 7000m and down to C2. 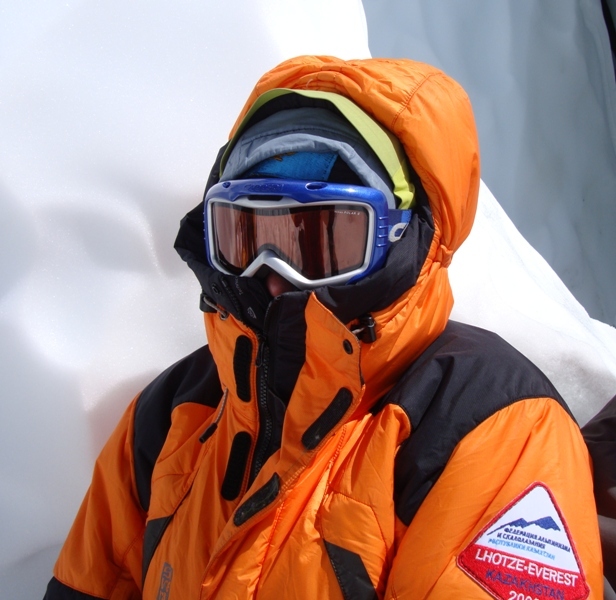 We are in the camp 3 (7100m), the day a strong wind blow. Tomorrow we will search suitable sites for tents. Prior to C3 ice, at the camp, too little snow. Sherpas sag railings. 1 st and 2 nd team in C2. 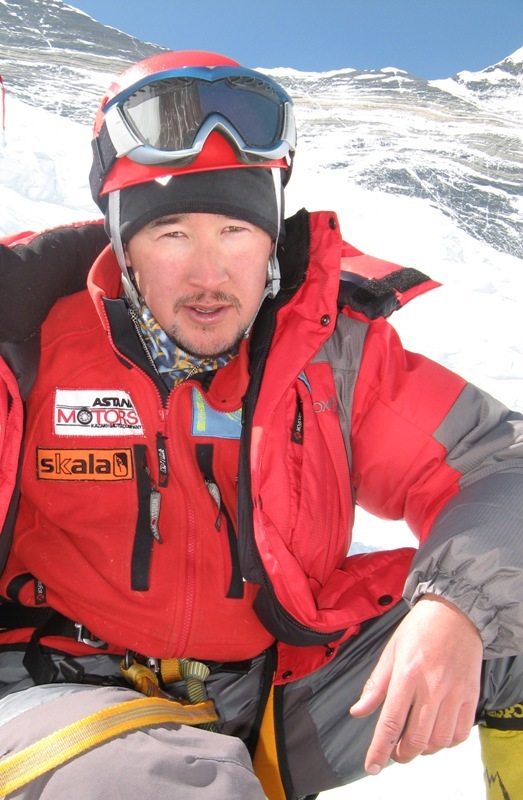 Today, went the distance from the BC (5300m) to C2 (6500m) in 6 hours and one hour of rest in C1. As a result, the overall elevation of BC to C2 – 1200 meters. Came out of the base at 6 am and arrived an hour of the day. Tired, but tomorrow we are going to C3. 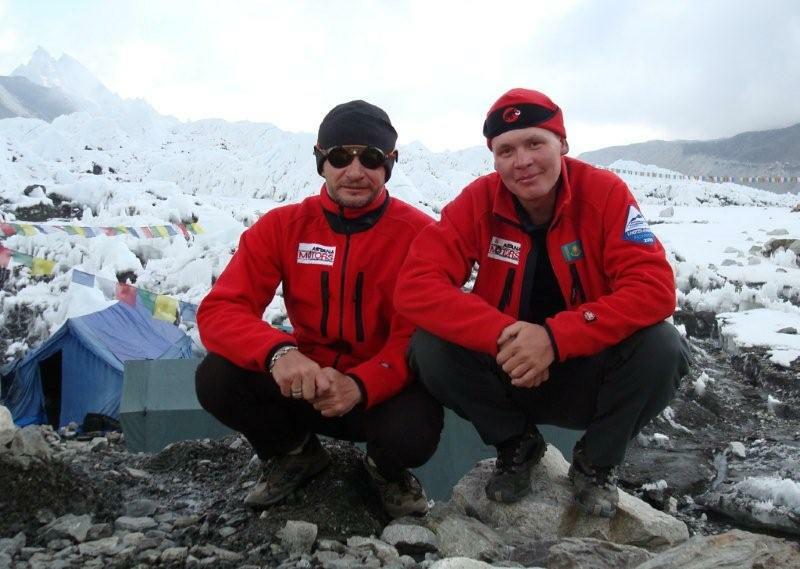 Baglan Zhunusov and Sergei Lavrov of camp 1. All is well! Hey all! 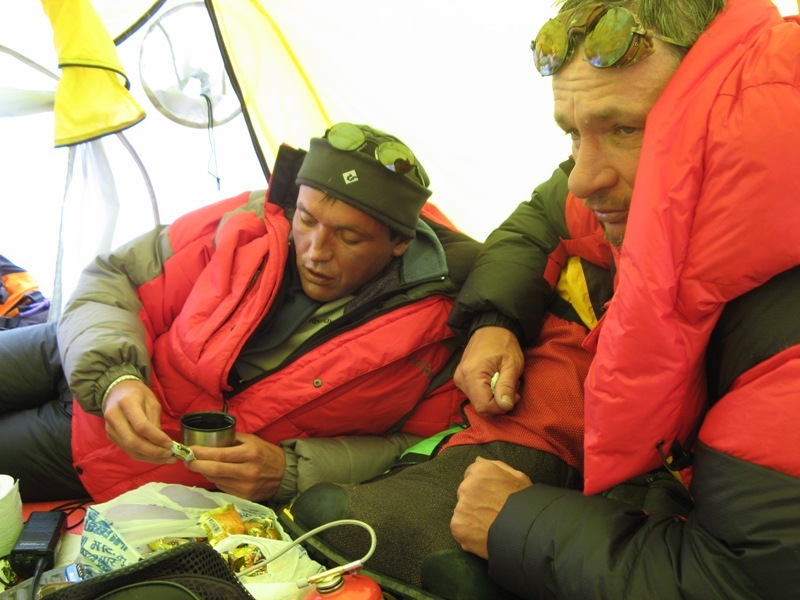 Today at 5 am the team was ready to be released in C1 (6100m.). 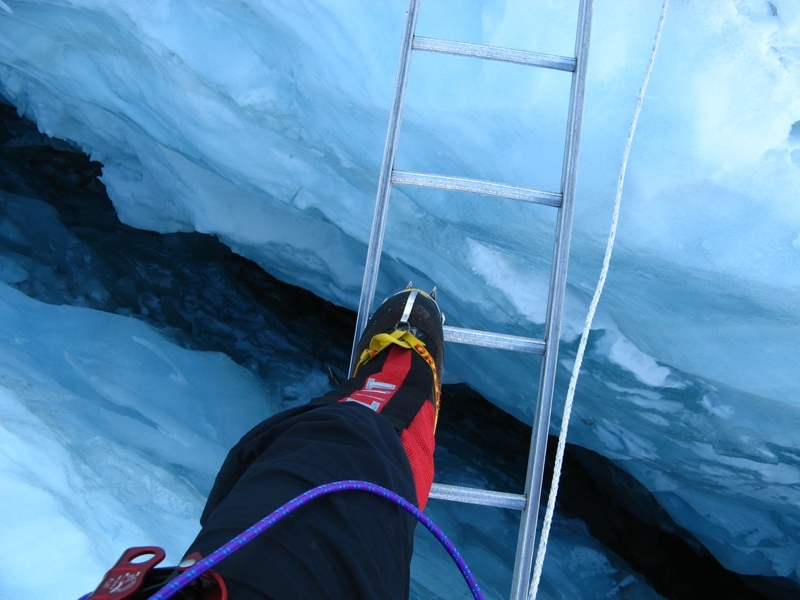 But the collapse of the glacier in the central part, has destroyed over 200 meters of rope railings and aluminum ladders. 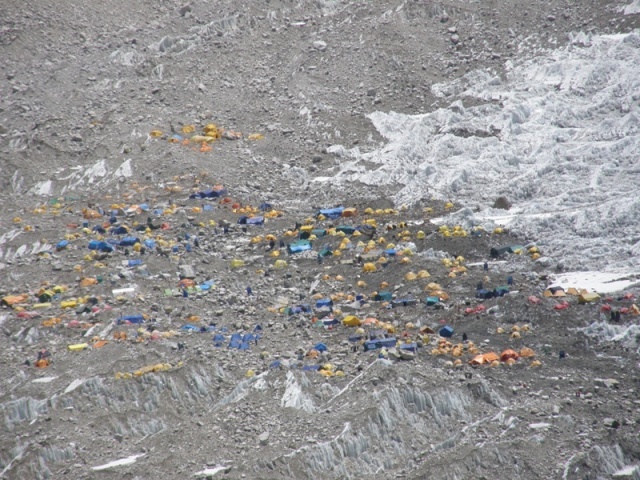 All the climbers were forced to return to BC. 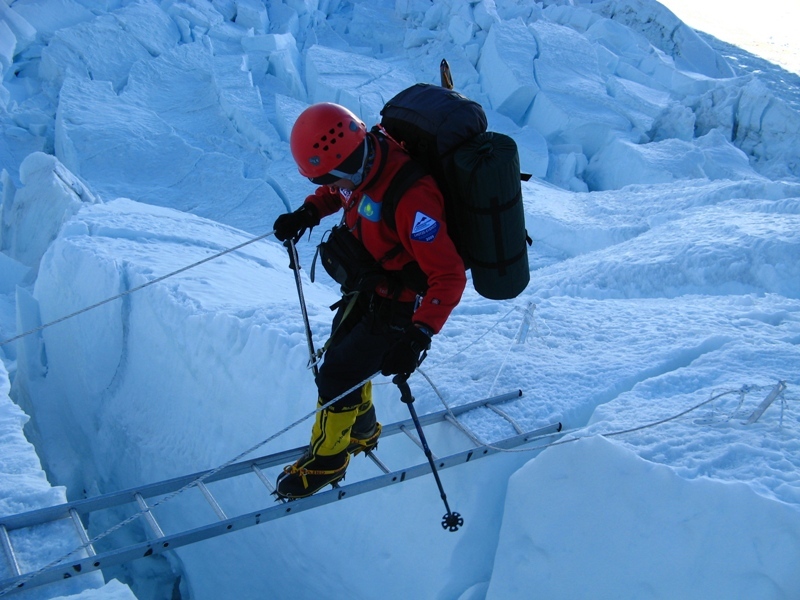 At the glacier came Sherpas who will find new, safe path to the glacier and restore rope railings. 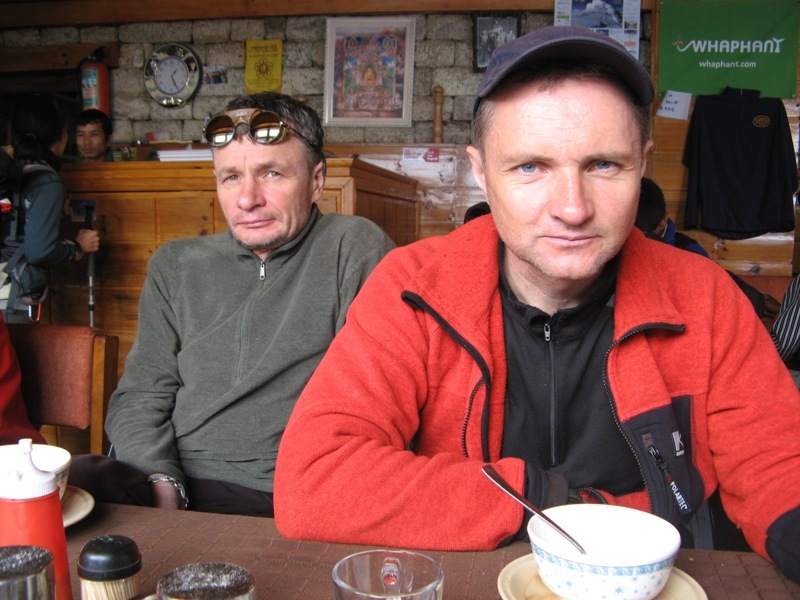 Now the team rests in the plans for tomorrow to withdraw from the BC immediately in C2 (6500m.). Today is Easter. 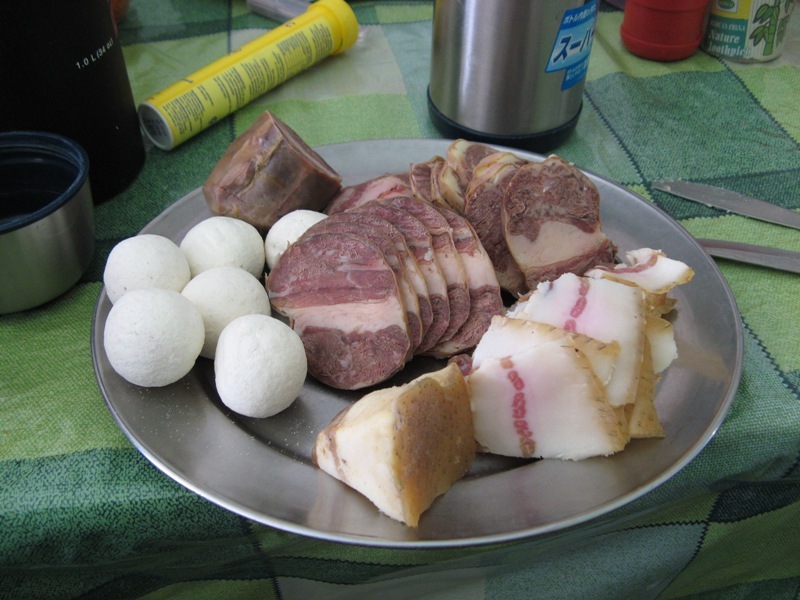 At breakfast, our chef Dzhaget gave us colored red, green and black markers eggs. 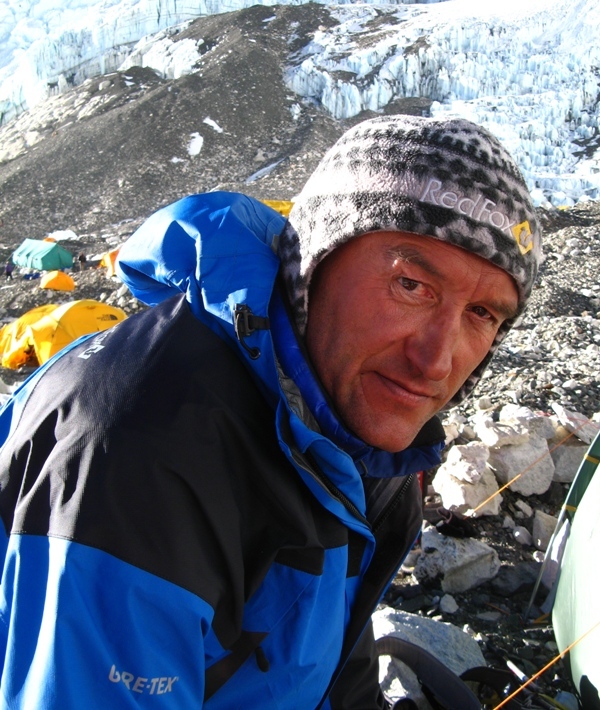 Some were painted mountains, inscriptions Lzotsze and Everest in 2009 and «Om Mane pedme HUM». Jack won the battle of eggs Shutov – its eggs appear to be the strong! 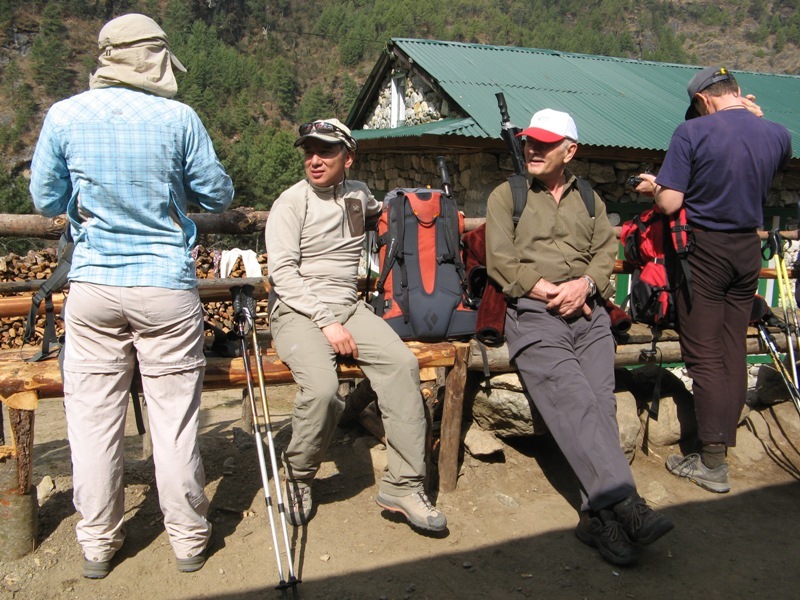 After breakfast we all went to Gorak Shep, one-hour fly down from the base camp. By the afternoon the whole team should be back to base camp. 08:30 After breakfast we had a ceremony «Puja». 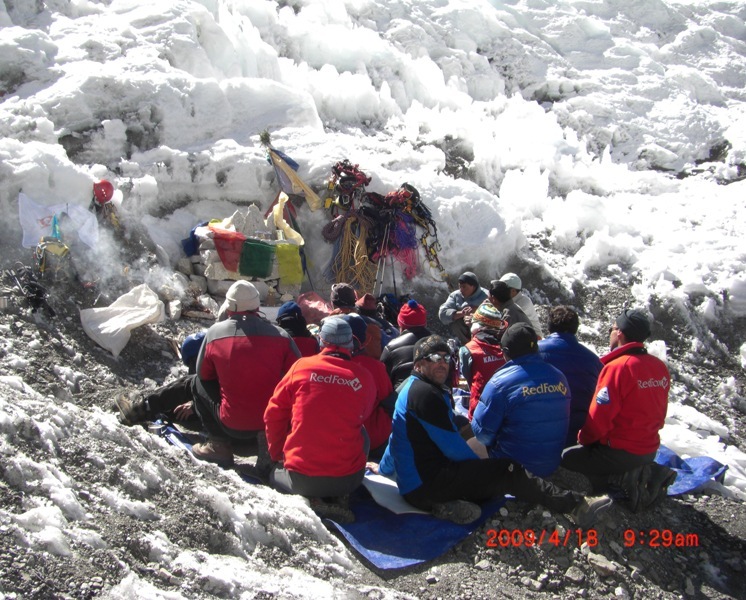 Puja – Buddhist ritual of worship is the spirit of the mountains, in our case, high-altitude Sherpa Nava served the role of lamas and prayed to the spirits of mountains and Lhottse Everest. Of the altar stone was posted on which the image of Buddha, prayer flags, sacrificial food and burning fire of prayer. 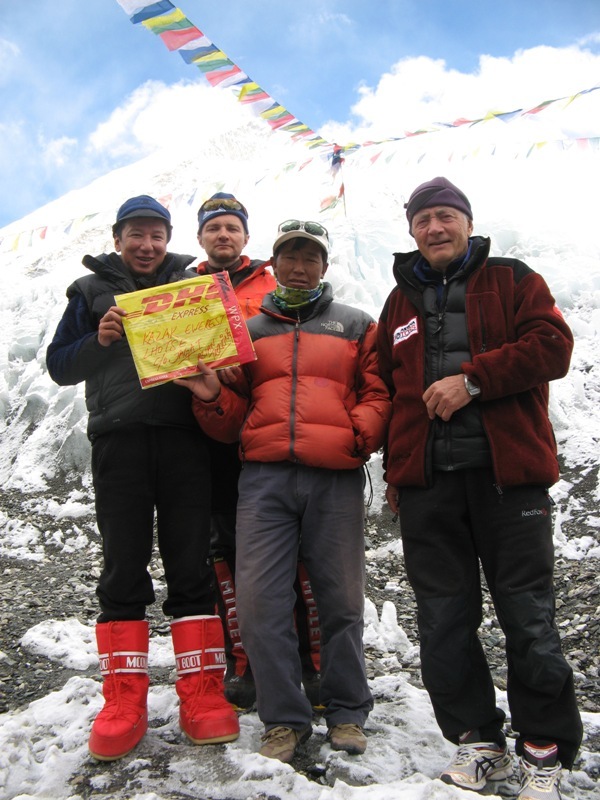 Sherpa Nava read Buddhist prayers for the record, periodically throwing rice, fend evil spirits. 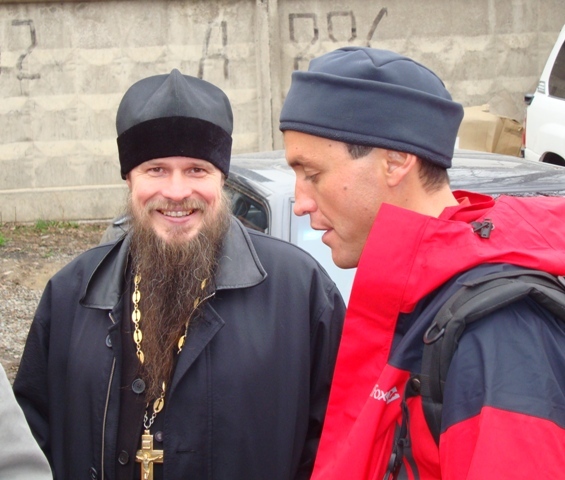 The entire team sat near the altar and everyone, regardless of religion, asked about the welfare and the successful outcome of the expedition. 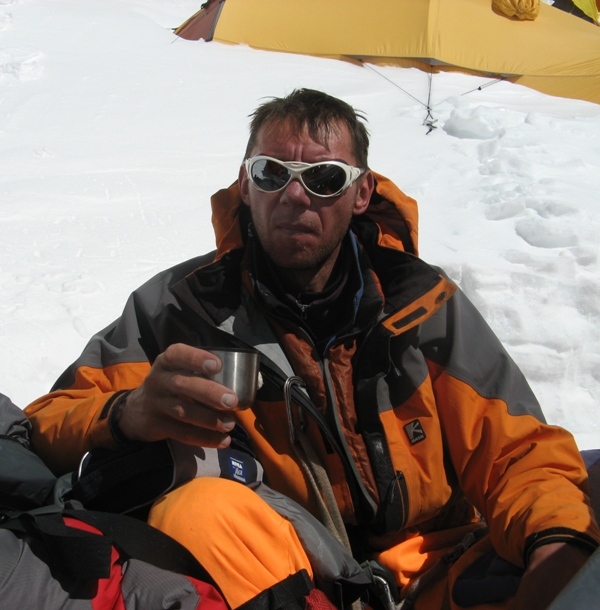 After the ceremony, by tradition, all who drank tea, those Passerines (Nepalese vodka), who chang (Nepalese rice infusion). Then began the traditional dances and songs. 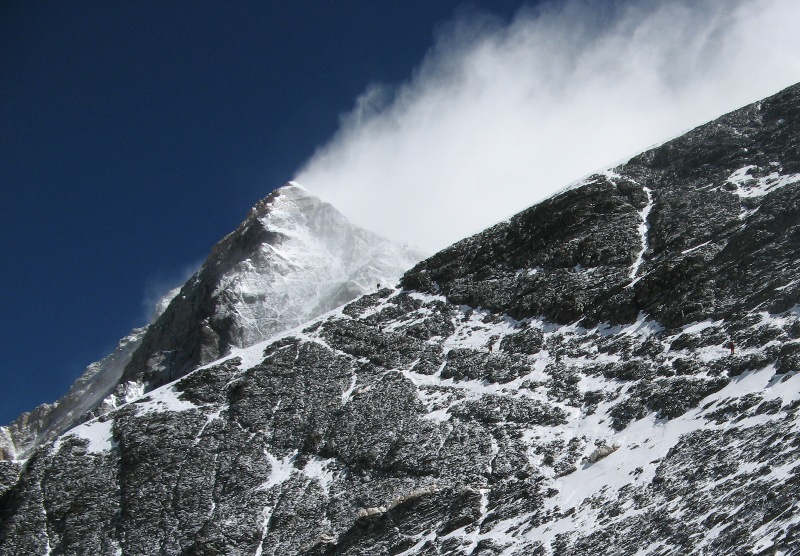 “Puja” – this is especially the unity team towards one goal, this word is not tops on hand, and on respect for the mountain and to fellow teammates. Everything will be OK! Woke up at 4.30, off 5.10 in the camp and went down to the database. 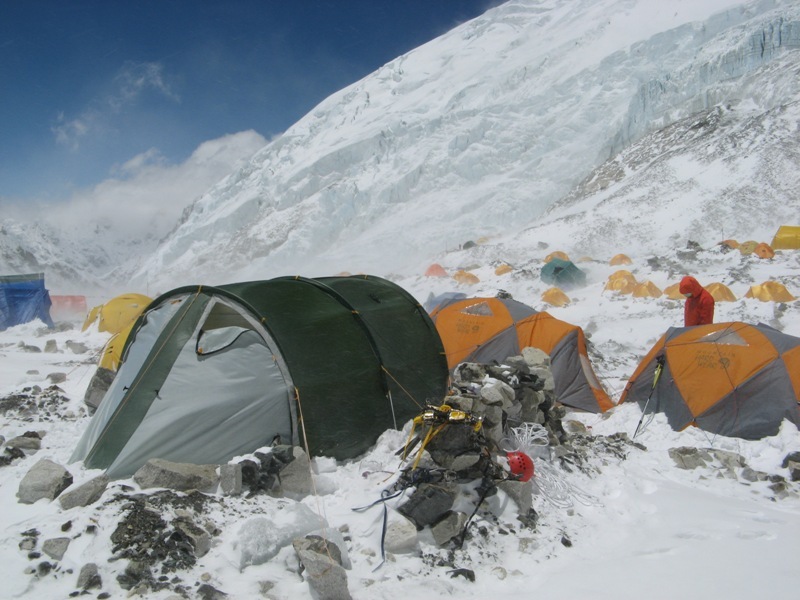 During the hour came to the 1 st camp and from there, passing the endless pile ledopada Khumbu, down to 8.30 in the BC. Early exit just surprised us – at 6 am on the path above the camp 1 was very lively. 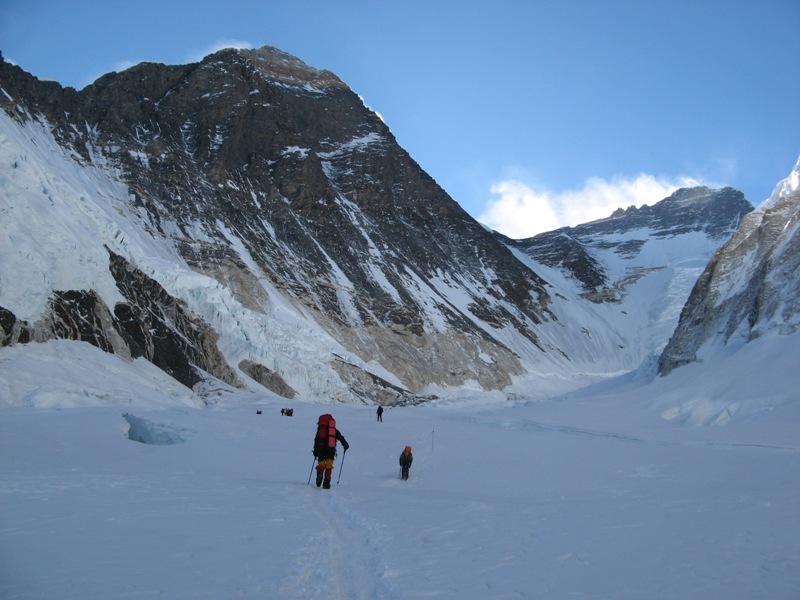 Sherpas commercial expeditions enter goods into the camp 2, way before it goes on ice plateau sandwiched between the slopes of Everest, and Lhotsze Nuptsze. Up to camps 2 survived for 3 hours. 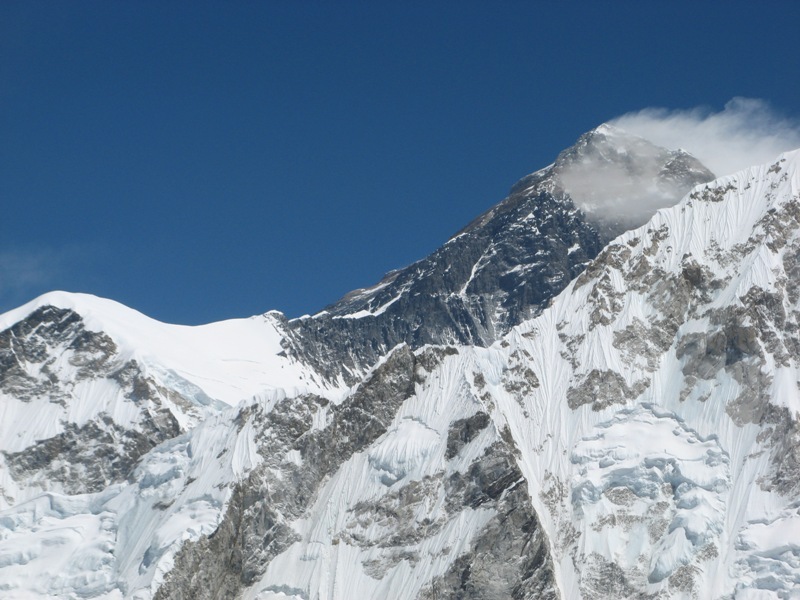 All moraine of the southern wall of Everest was taken and marked the commercial expeditions. But we found a flat area for 2 tents. After lunch, went to the ice slope leading up to the top of Lhotsze. 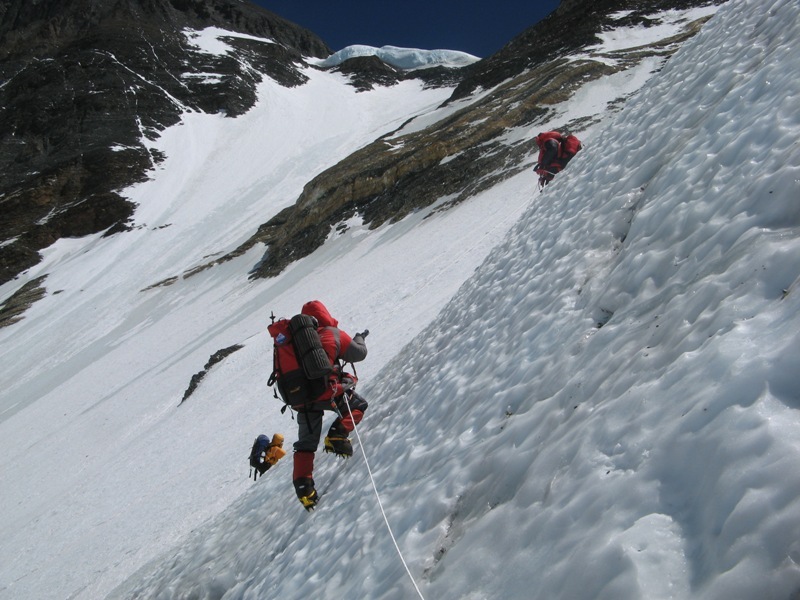 Views alternative descent from Everest in the west edge of the camp 2. Lavrov and Zhunusov came out of Camp 1, reached the 2 nd camp and went back to the 1-st Camp. Tomorrow in the BC. 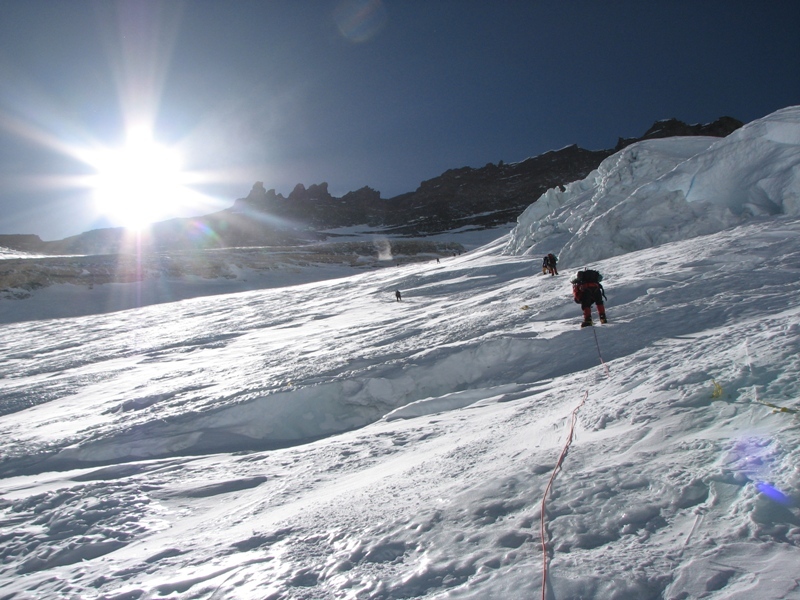 1 st and 2 nd group of the afternoon went on the 7000m and descend back into the camp 2. Tomorrow in the BC. 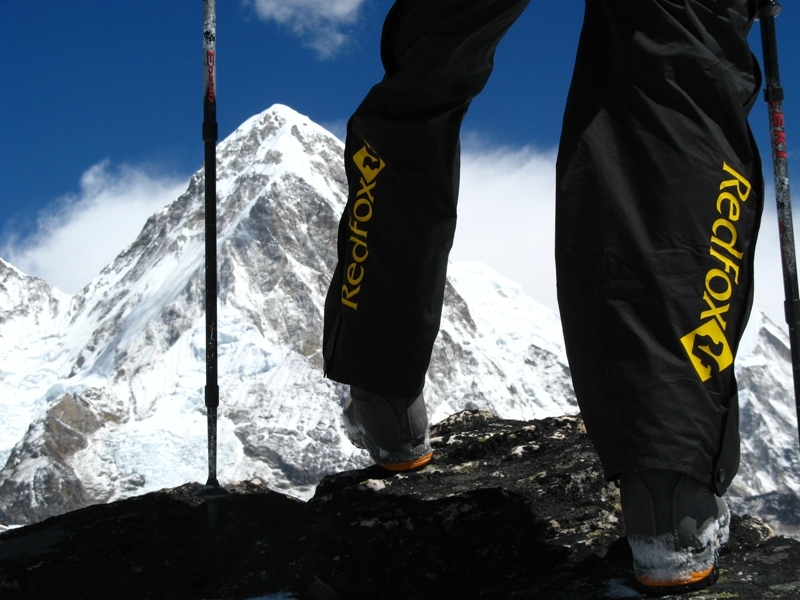 We have ledopad Khumbu and is now in the camp 1 (6100m). We put bivuak. Today there were 5 hours, a clear, sunny, very hot. 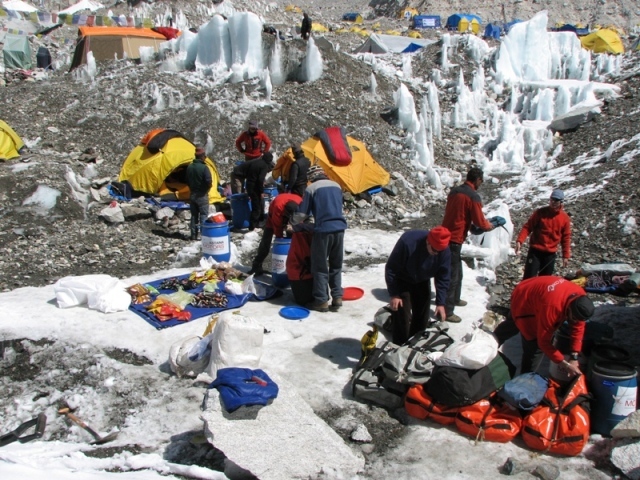 Plans have changed and some groups today are still in the camp 1 (6100m). The trail up to Camp 2 passes under the wall Nuptsze strong punches and stones are due to hot weather. Go for it is dangerous! 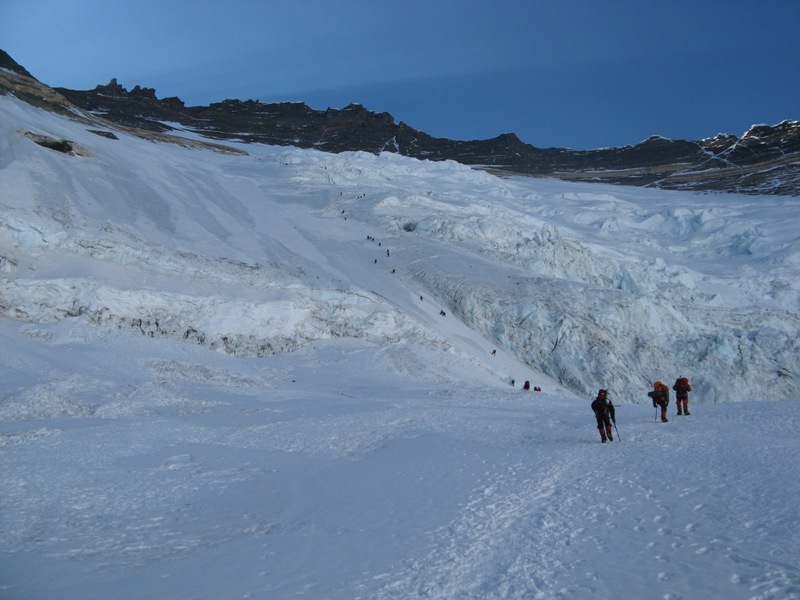 Tomorrow, early in the morning, all went to Camp 2 (6400m), 1 st and 2 nd group of the equipment after the camp 2 immediately plan to make access to the camp 3 (7100m) and back to camp 2. 17 th, all three groups to come down to base camp. 05:30 Out on the route. 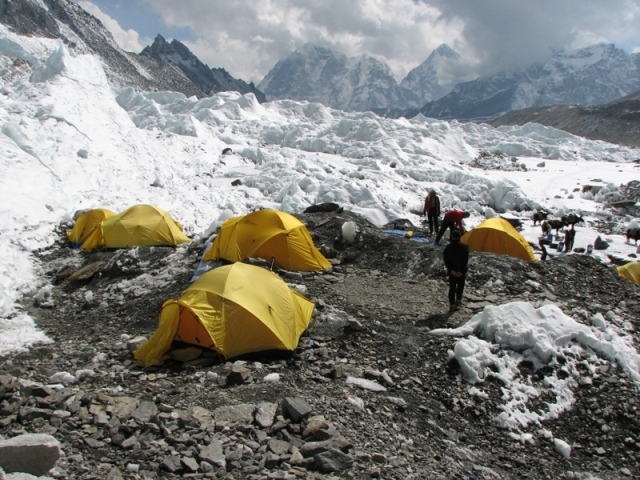 Base camp is located on the edge of Khumbu glacier moraines. Before ledopada went for about 15 minutes. 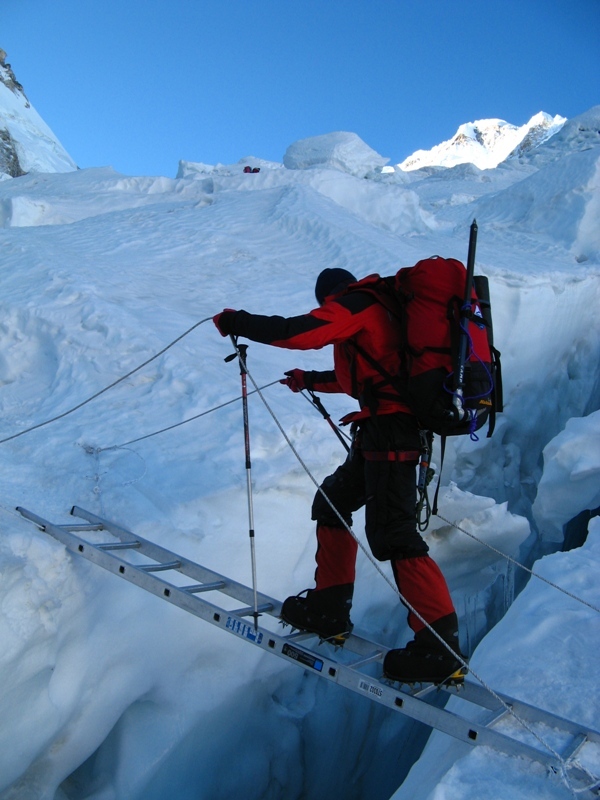 Then began rope railings and aluminum ladders – continuous line, they dragged all over ledopada Khumbu. Ledopad is a pile of huge blocks of ice. You go to a house built where every snow and ice block live their lives. A total of 5 hours we «ran» ledopad and reached a plateau of silence, where set camp 1 (6100m). 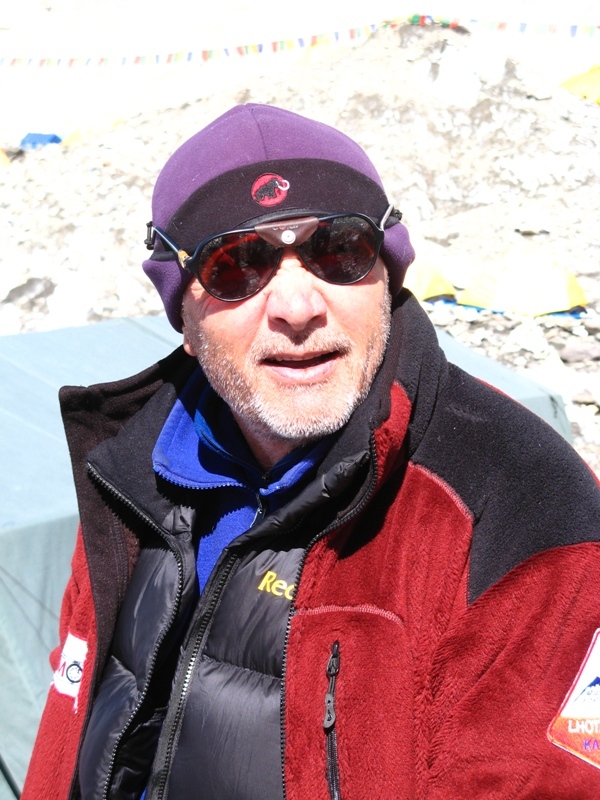 By noon the sun burn through the eyes of sunglasses and a track for the camp 2 stones began to fall from the wall Nuptsze. 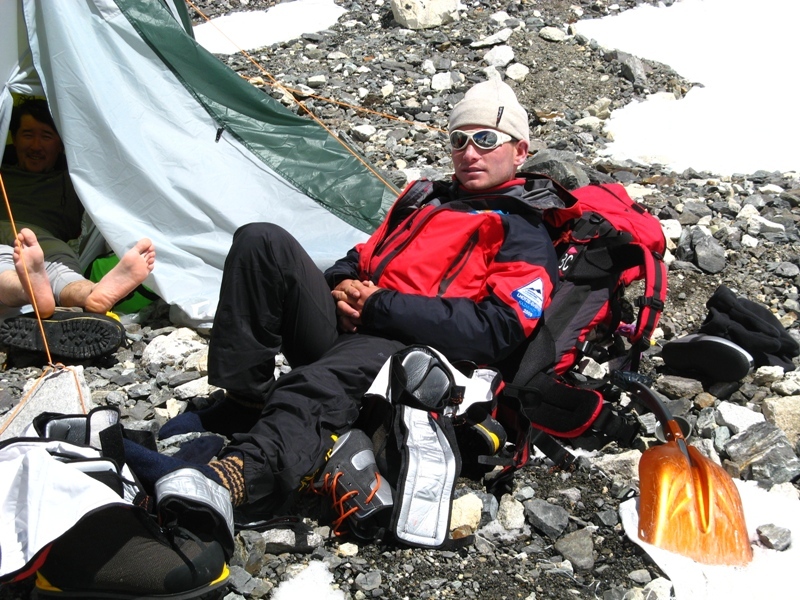 We decided to go for the camp 2 (6400m) the next day. All is well! All healthy! All big hello! The whole day was preparation for the exit. The team was divided into 3 groups. Group 1: Pivtsov V. (supervisor), Juma M., Shutov, J., Sofrygin A., S. Samoylov. 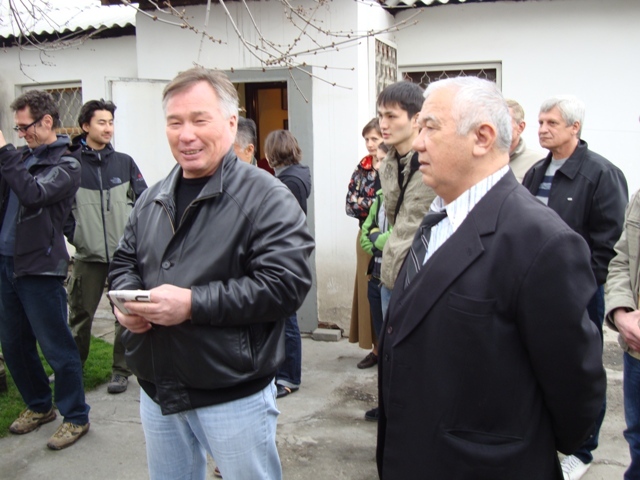 Group 2: Grekov D. (supervisor), Skopin A., Gutnik N., Rudakov, A., S. Sharipov. 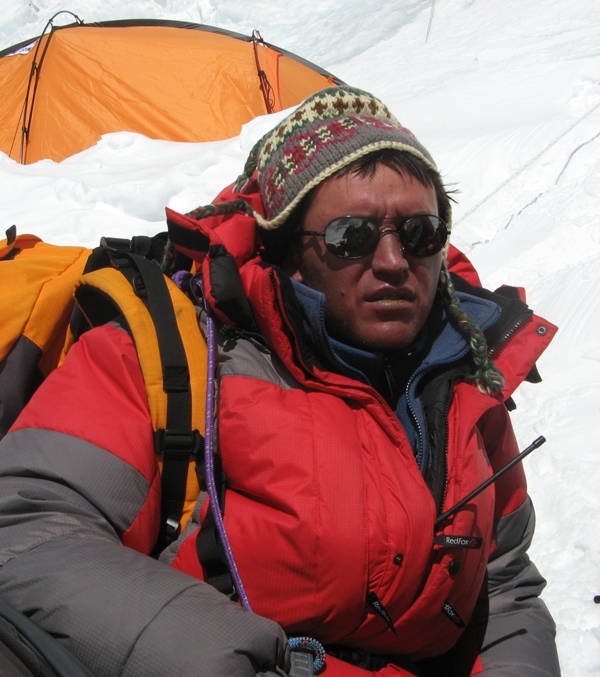 Group 3: S. Lavrov (head), Zhunusov B., Nava, Sherpa, Sherpa-Ttsering. 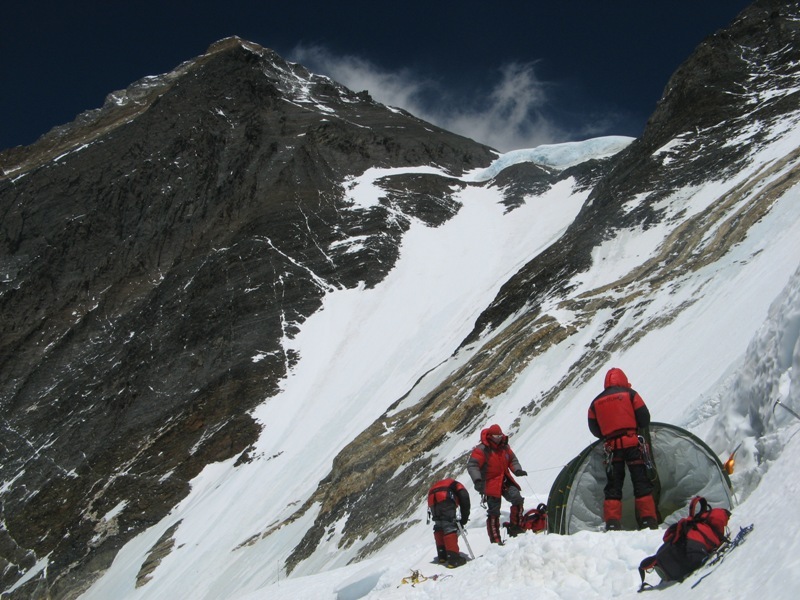 17.04 descend to base camp. 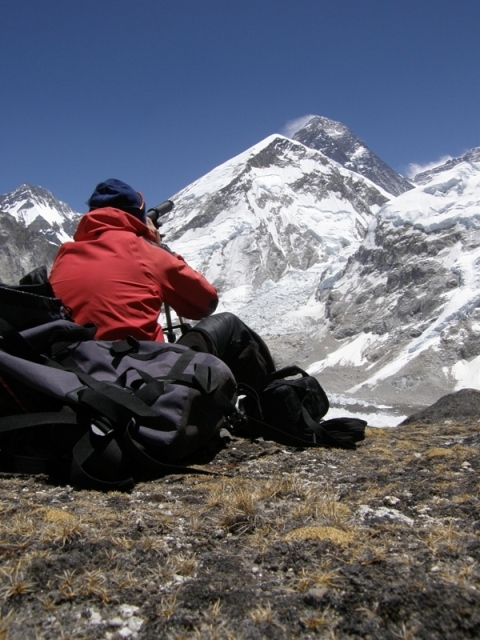 All the necessary products and high-altitude gear prepared. Backpacks weigh an average of 15 kg. Feelings good mood battle. 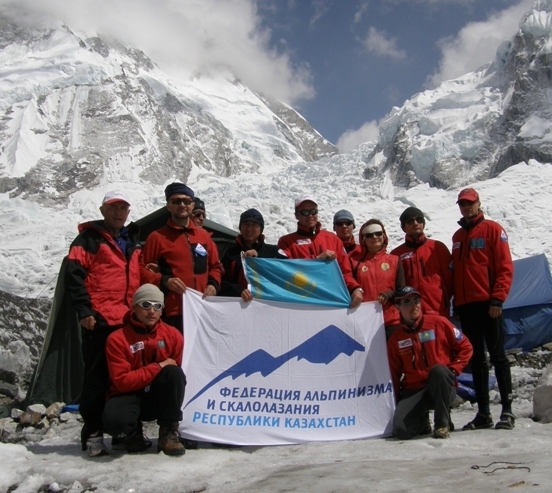 On the morning of the camp raised the flag of Kazakhstan. After breakfast, high-disassemble products and equipment. Full swing preparing for the first entry to the route. 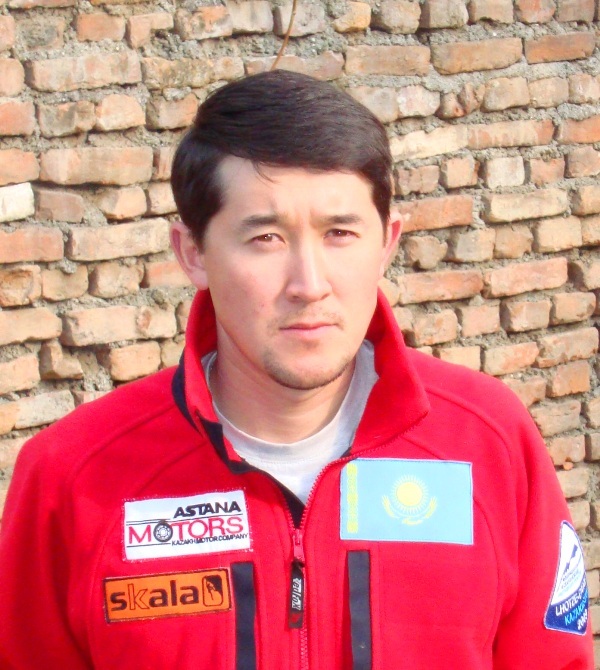 14:00 Arrival of the Kazakhstan team in base camp (5300 m.). 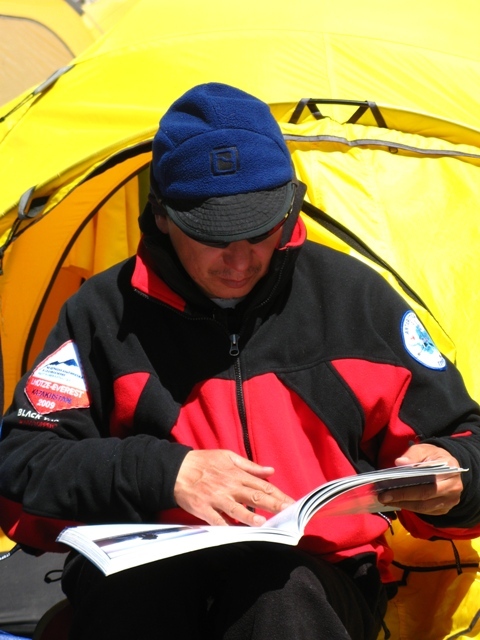 Immediately upon arrival at camp, all began to equate Moreno, under the tent. The work is not an easy one, had to pick and shovel wave. 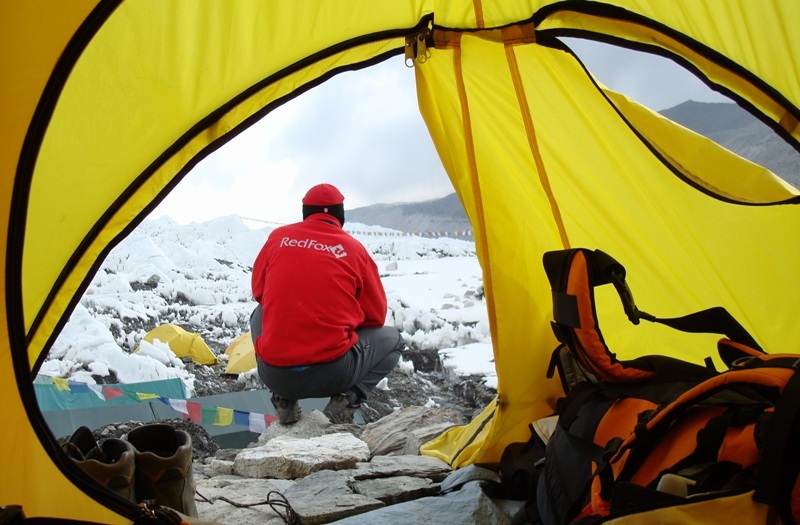 Our camp is located on the Khumbu Glacier, as well as on the moraine, all seats were occupied. 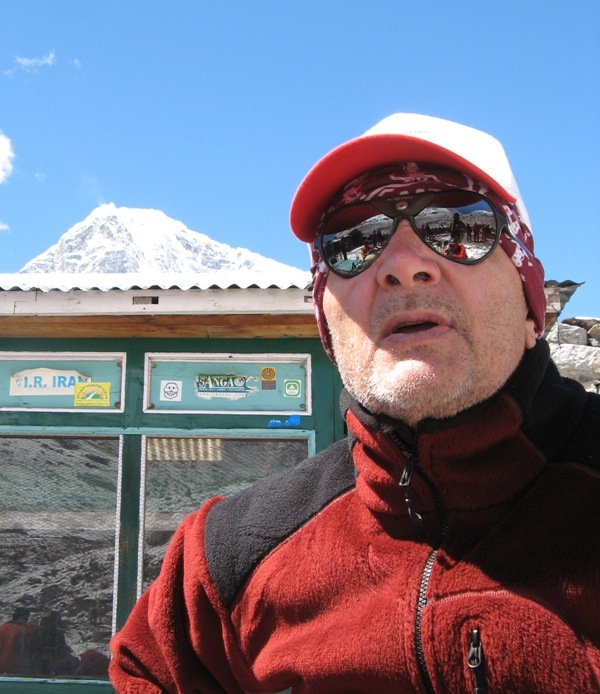 Day in Lobuchi (4950 meters). 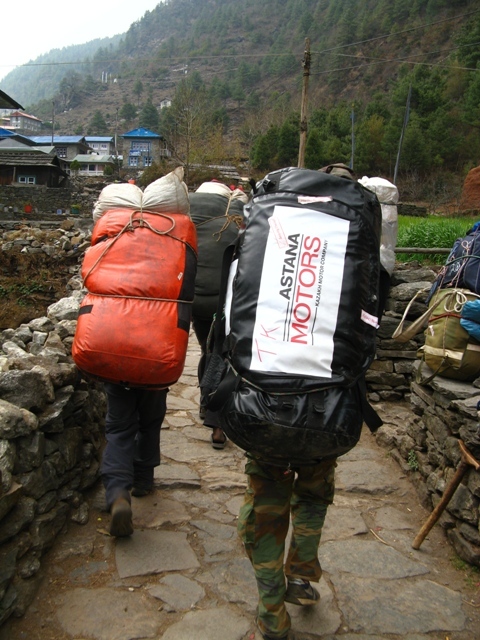 Our shipment has not yet reached the base camp, as we move ahead. 09:00 acclimatization exits. 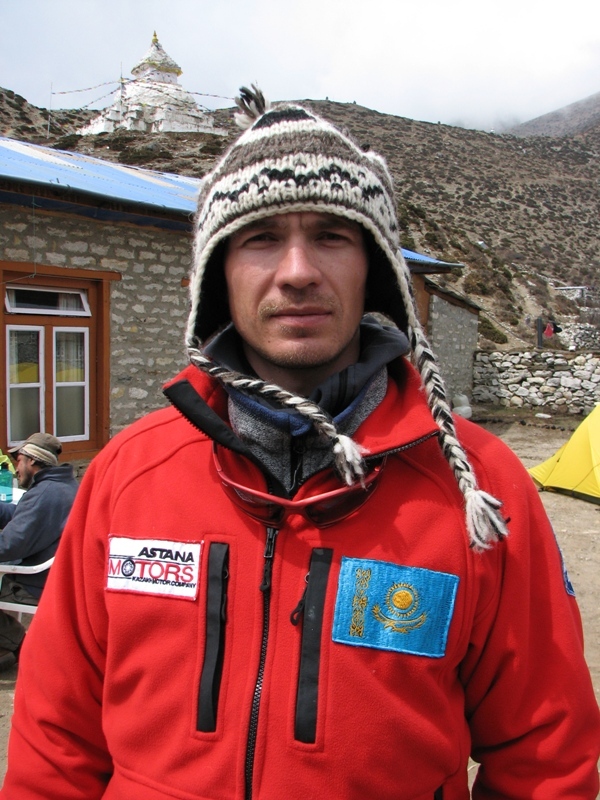 Alexander Sofrygin at 06 am left with our Serdara Dzhakatom limbu to base camp, to check the readiness of the parish team. 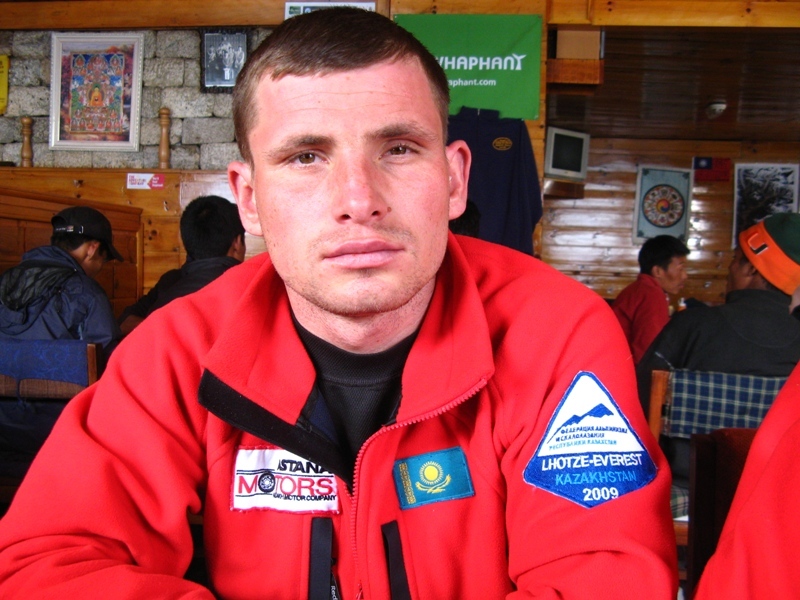 Alexander Rudakov Dmitry Grekova went under the eastern wall of Lobuche Peak (6120 m.), and «iron outrunner» Sergey Samoilov fled somewhere upwards. 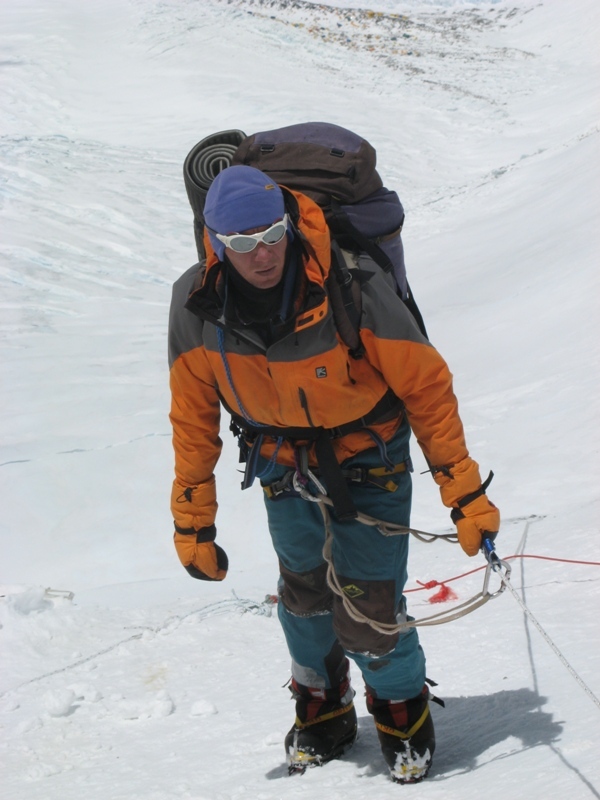 The remaining participants (V. Pivtsov, M. Jumaev, EG Shutov, A. Skopin and S. Sharipova) climbed to 5600 meters on the western ridge of Lobuche. 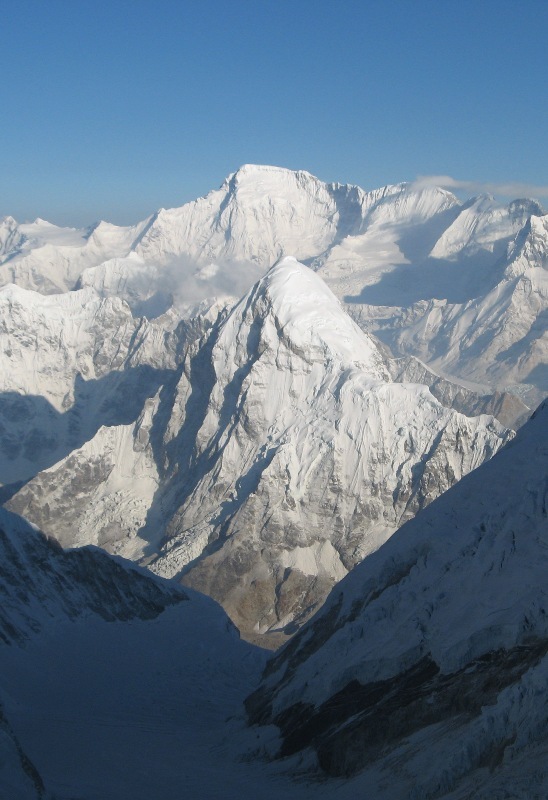 The purpose of recovery explored descent from the top of Everest along the western ridge. 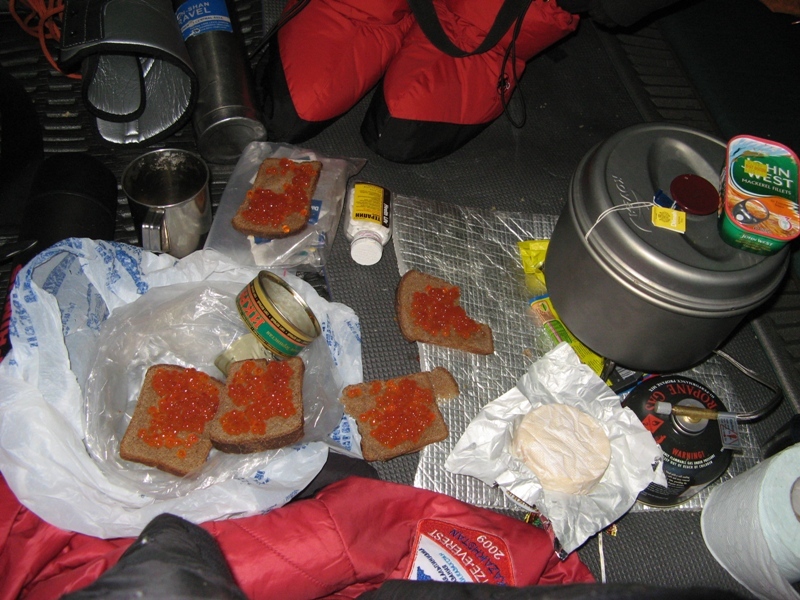 For dinner back Aleskandr Sofrygin, who has had to work at the base camp for the preparation of sites for tents. 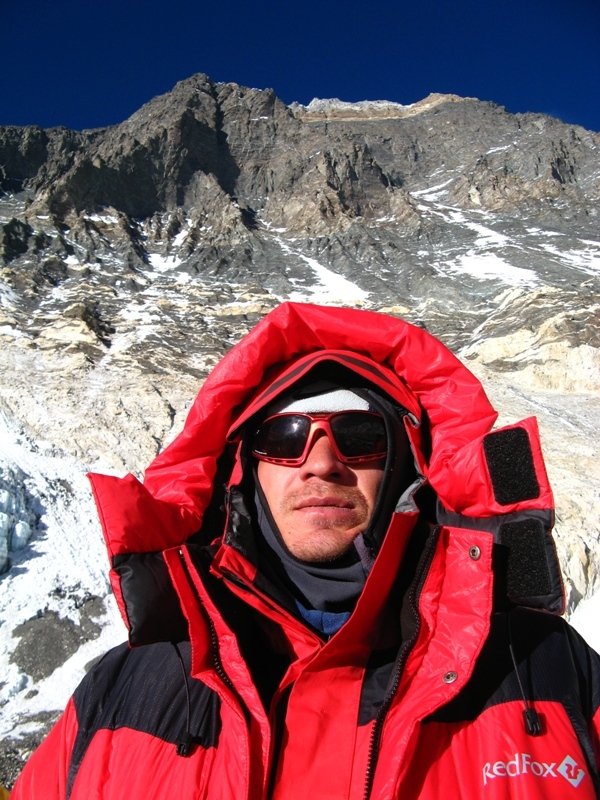 Alexander is the first time I saw ledopad Khumbu, and expressing emotion: «I am in shock, Khumbu – breathe», laughed. Before the evening was heavy snow, but just rang the morning weather – clear skies, bright sun, cool breeze. 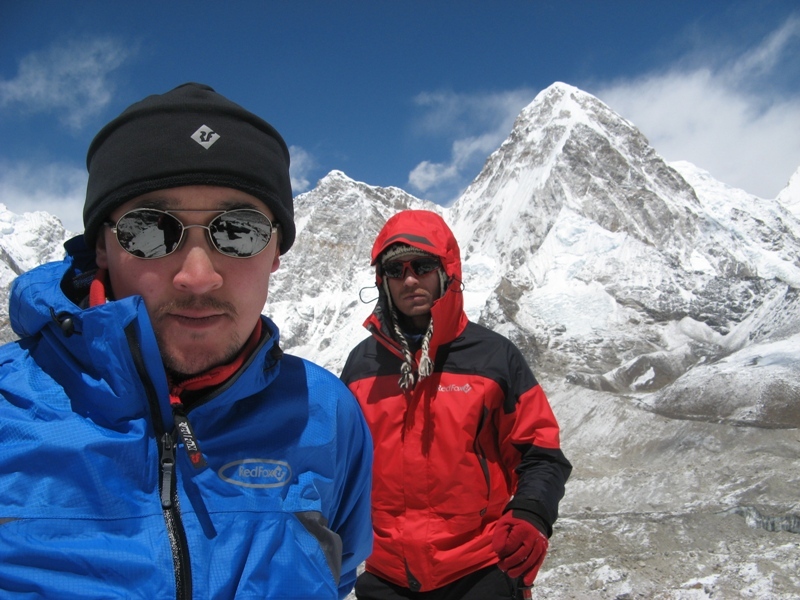 08:00 all the team together out of Dyangboche and 2 and a half hours came to Lobuche (4950 m). 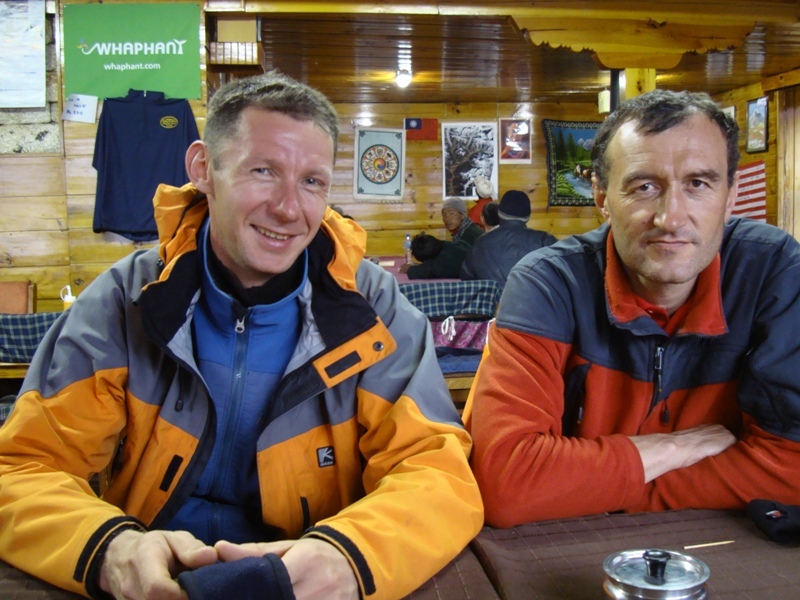 Housed in a cozy loggia «ECO Loggia Asian Trekking» with a view to the top of Nuptsze. After lunch, setting satellite equipment. Weather clear, but perceptibly cold. 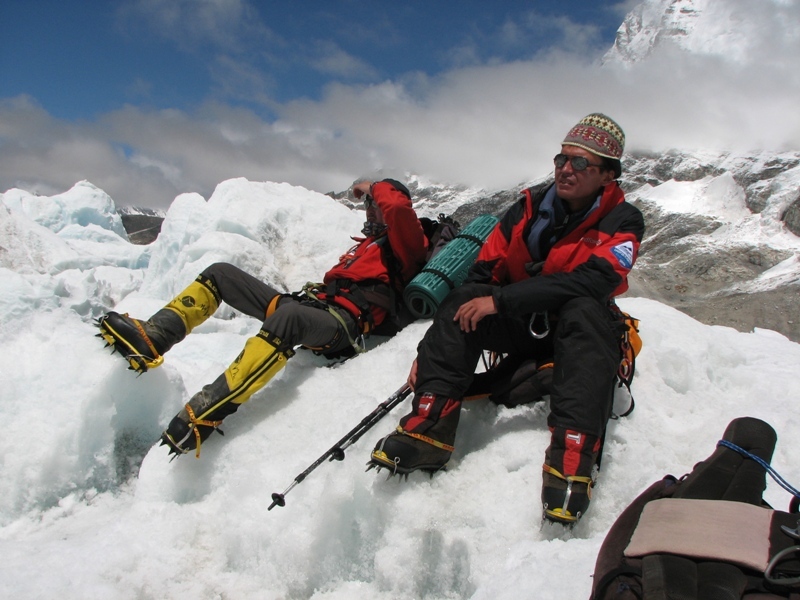 The guys in the hope of discussing that with the advent of warm spring at the foot of Everest. Part of the team healed headaches, making a climb to a nearby hill. 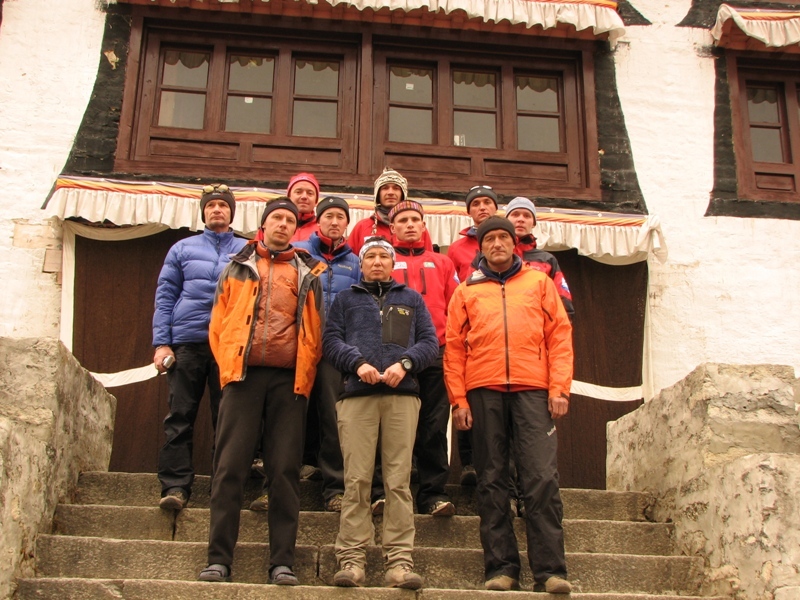 07:00 entire team has received the blessing of lamas in the monastery Tyangboche. 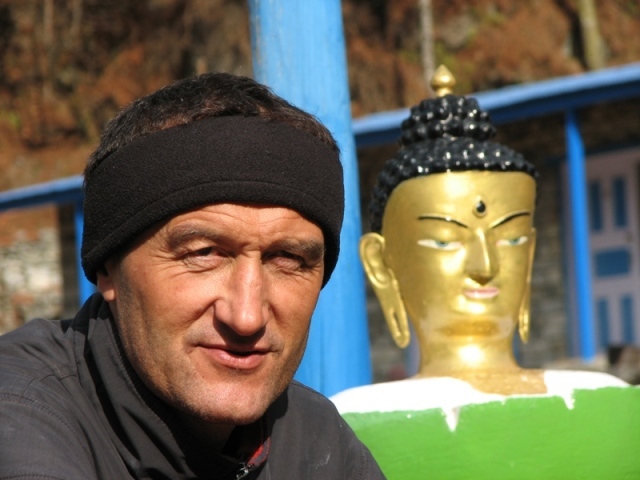 From 6 am prayers at the monastery began, the well-being of mountain climbers, Everest Expedition Lhotsze. In the large hall at the same time praying for more than 20 monks. Guttural chant sometimes disrupted Buddhist drums and highland. 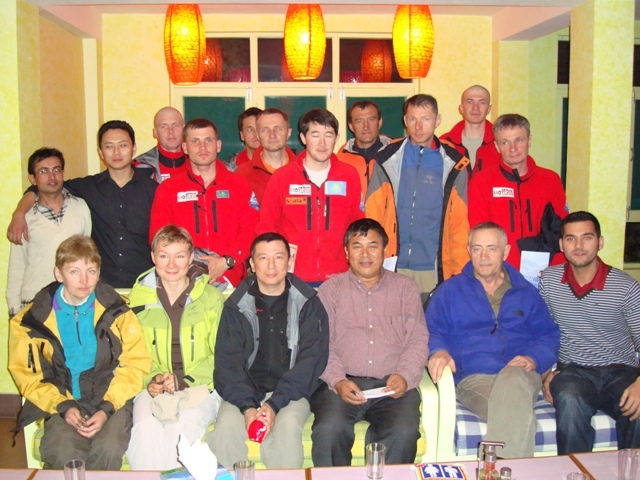 At the end of the ceremony of the High Lama blessed each participant in the expedition. 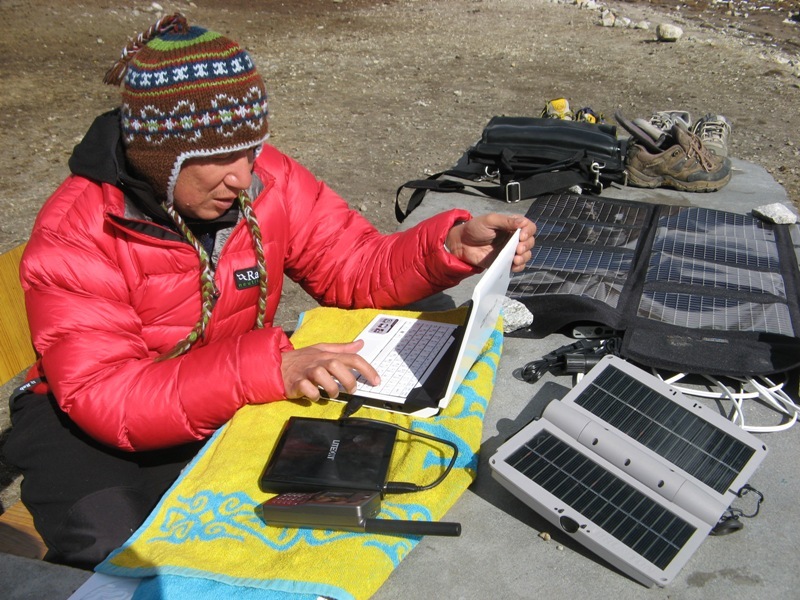 11:30 arrived at the village Dingboche (4410 meters). Placed in the loggia «Snow Lion». 07:30 Breakfast and departure. 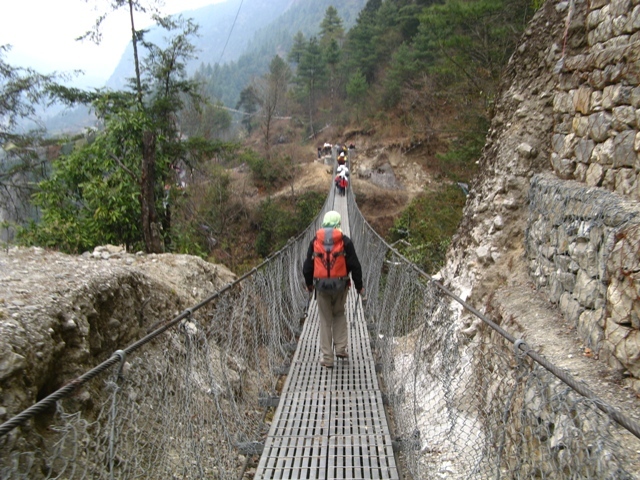 The trail from Namche Bazar went down to 300 meters at the bottom of the valley. 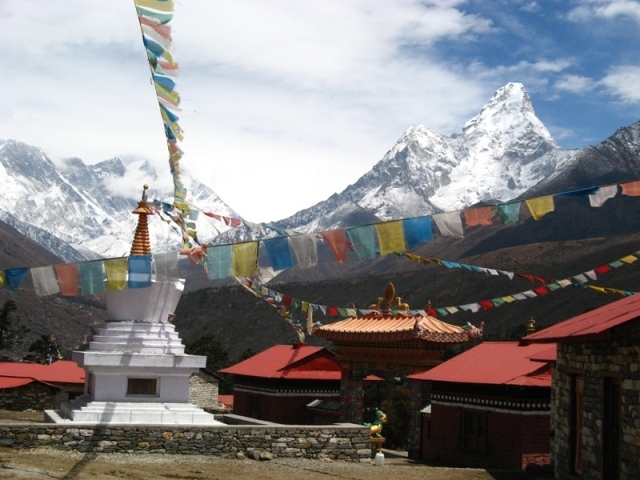 Then, twisting dial 600 meters in the vertical path led to a monastery Tyangboche. 14:00 housed in the loggia «Tasha Dela». 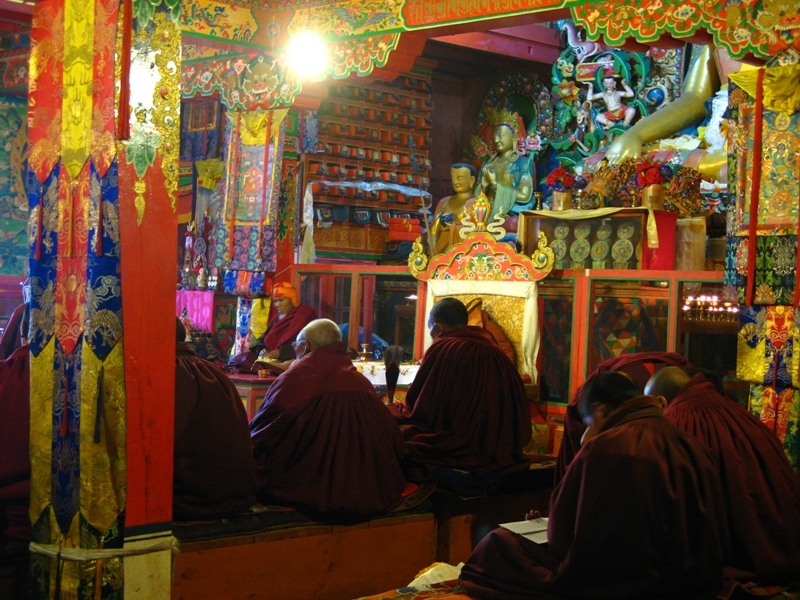 On the Tibetan language «Tashi case» is translated as, «Salam Alleykum». 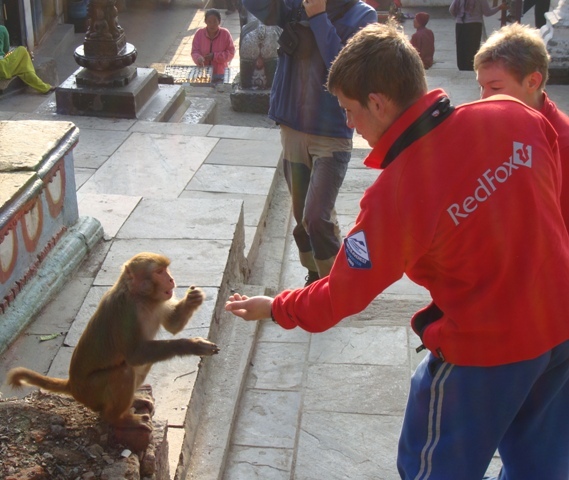 After lunch, tour the monastery and Buddhist sites. 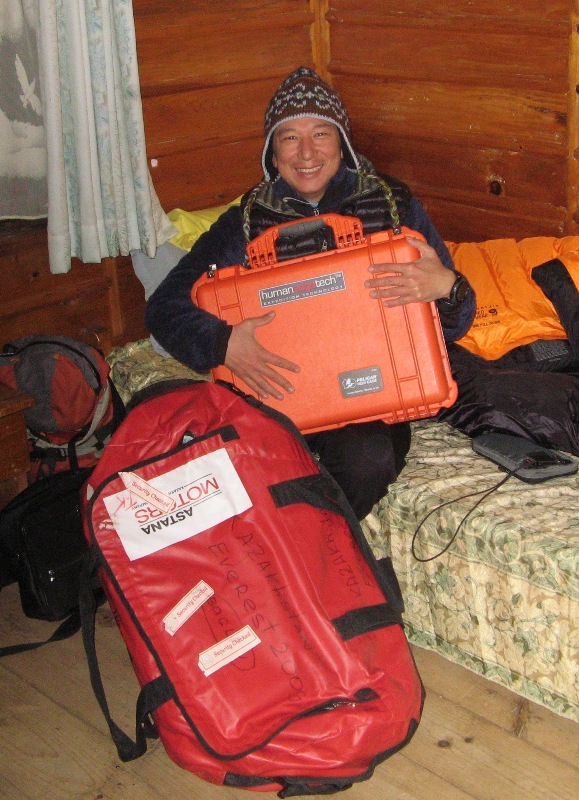 Main news of the day: A straggler trunk with all the telecommunication equipment expedition. 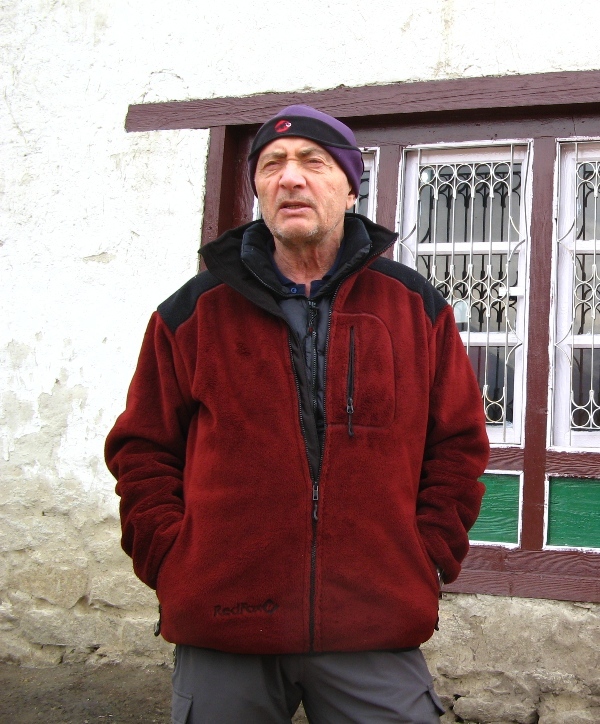 Background – 05 April 2009 upon arrival in Lukla, the confusion arose because of a three day break in flights between Kathmandu and Lukla, was not doschitan 1 trunk. 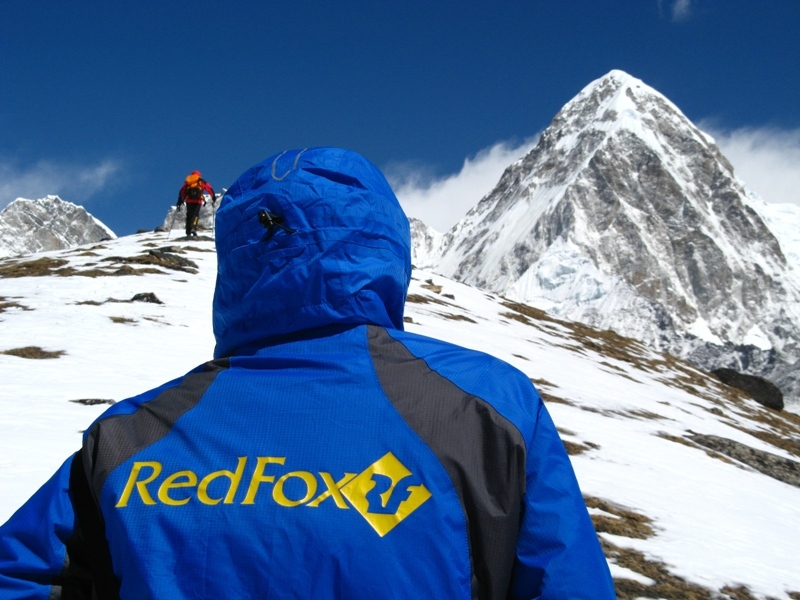 It has proved most valuable in our expedition, as it is specially prepared for the high altitude satellite terminal and the computer. Have not lost at once, went in search of all, participate actively in the local population and even the police. But the searches produced no effect, and the team continued its way on to the village Phagding. 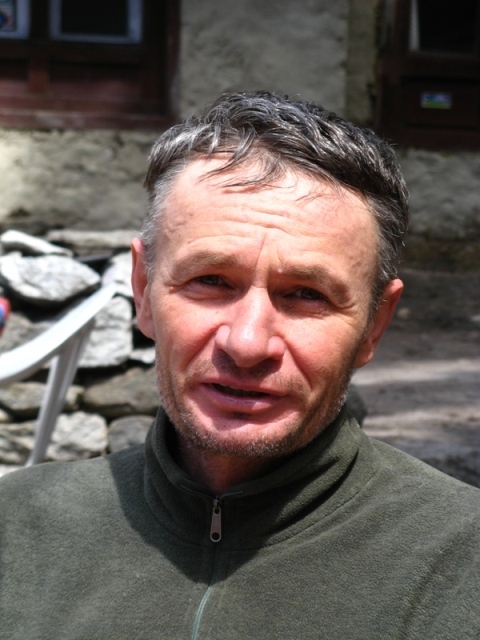 Our guide and part-time cook, has accompanied the expedition in the Himalayas, Kazakhstan Tsakat Limbu, agreed with the district office of the Communist Party “Maoists” for assistance in finding lost trunk. 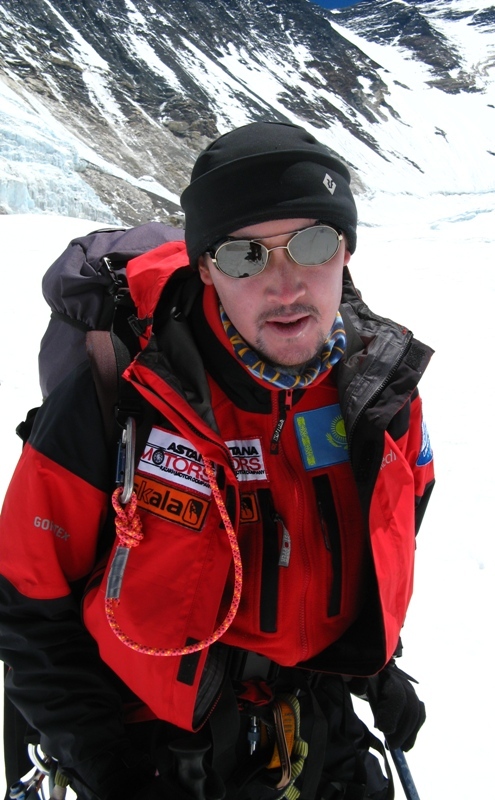 The caravan was moving further and further from Lukla’s and the chances of finding a trunk decreased. 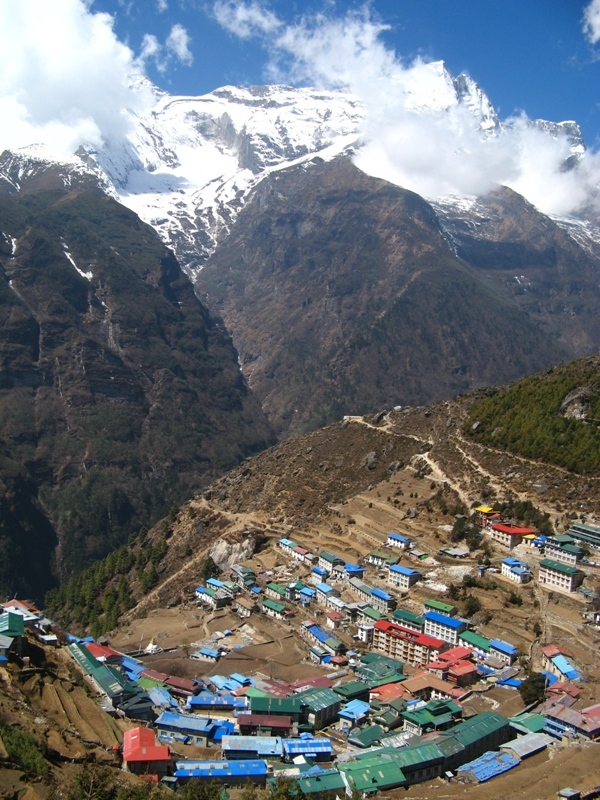 In the town of Namche Bazar actively seek not to continue. From Kathmandu, we have helped managers of tourist company “Asian Trekking”, who tried to investigate the cause of the disappearance of members of the Lukla airport. 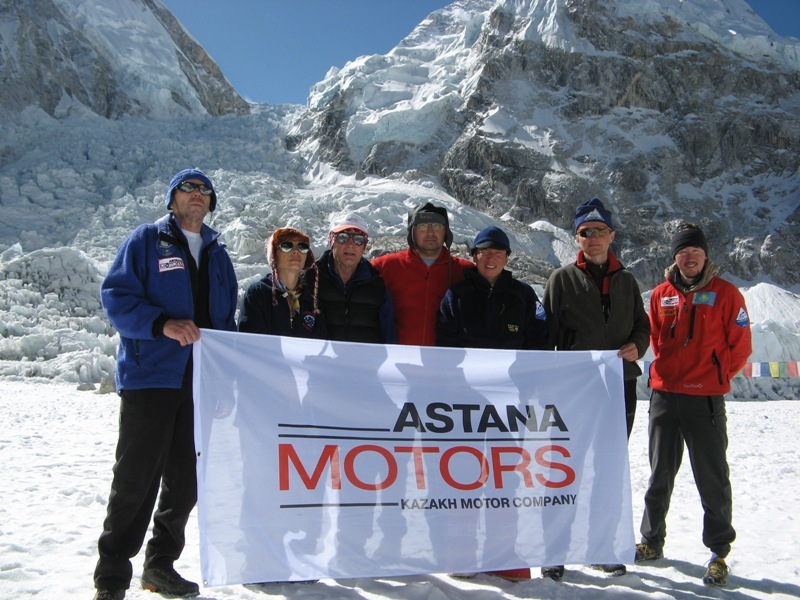 By moving the caravan expedition to Everest base camp in Namche Bazar was scheduled 1 overnight, but we extended the stay of up to 2 days. Extra day, the team decided to fill one shift to pass a two-day shift. Following the appointment of a substantial reward to trunk was found. And the evening the same day we brought him in complete safety to the hotel. 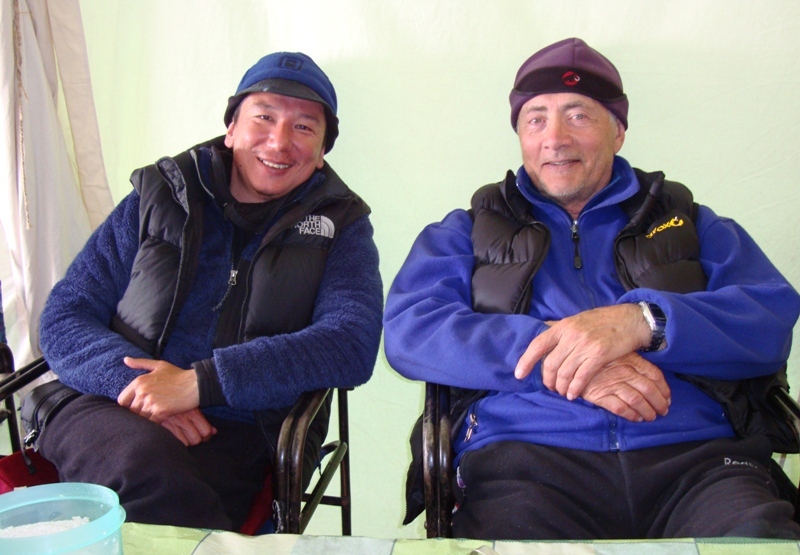 10:00 Head of expeditions to Everest (8848 m), Baghlan Zhunusov and head of expeditions for Lhottse (8516 m.) Maksut Jumaev briefed at the regional office for environmental control Sagarmatha National Park, where the documents are signed on to make a deposit for garbage removal from the base camp. 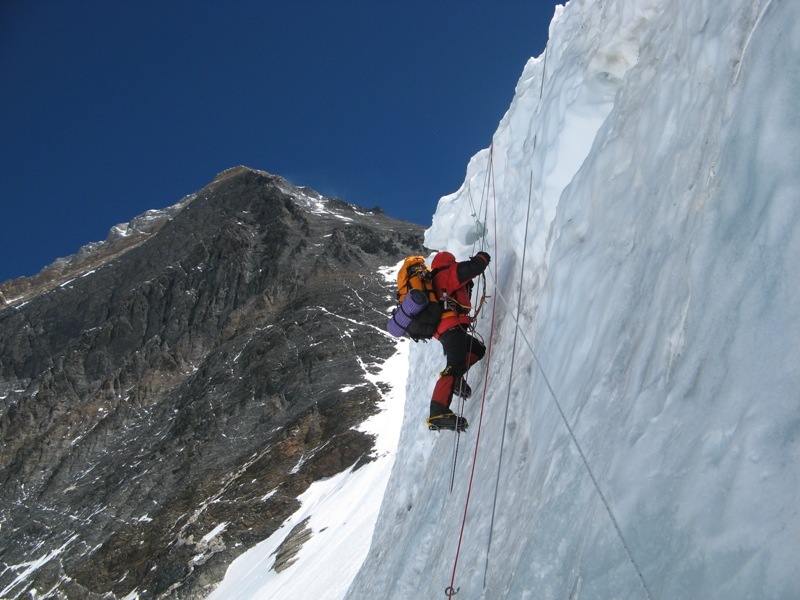 11:00 sports team SC on climbing radial carried out with 500 meters difference in height. 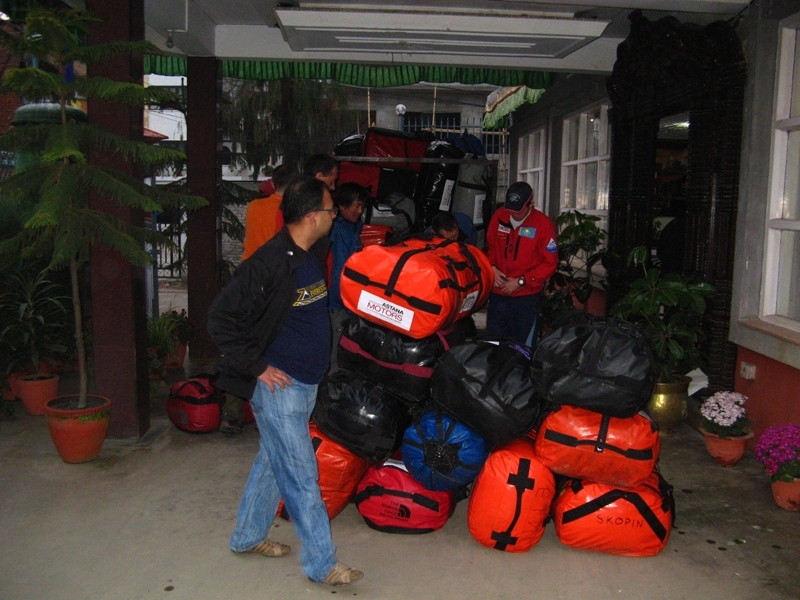 15:00 meeting at the airport Namche Bazar main cargo expedition, who arrived by helicopter from Kathmandu. 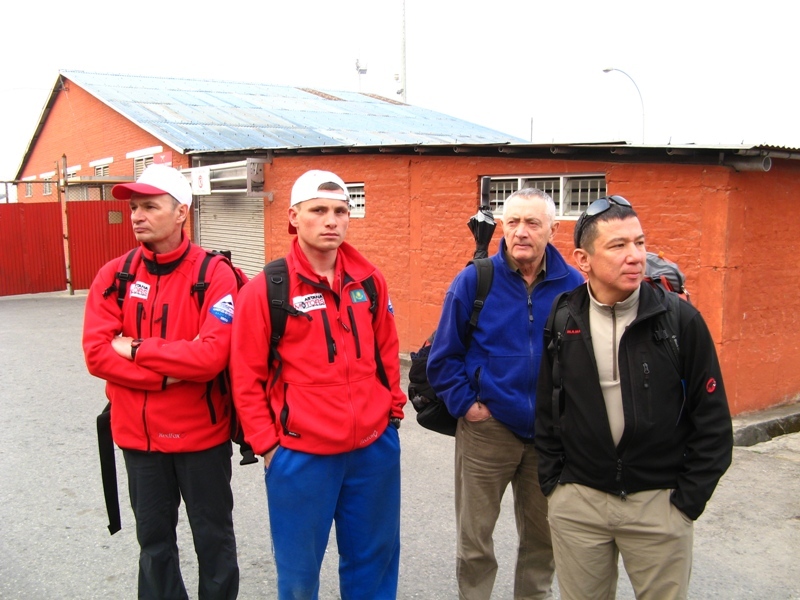 Then the team and a caravan of shipping goods to the base camp will go together. In the dynamics of the weather conditions improve, rain and snow come, briefly. A whole team of health and good spirits. 06:30 recovery. 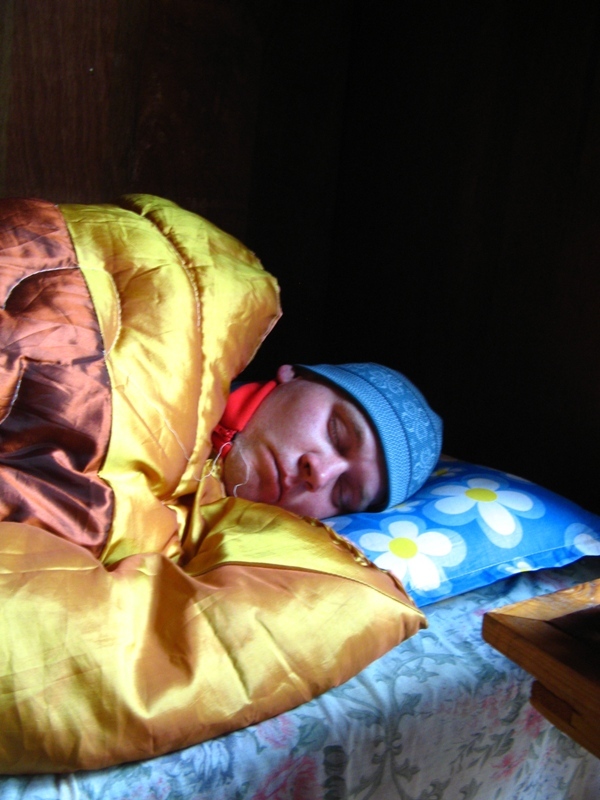 Cold, 0 degrees in the room, slept in sleeping bags. And this is understandable, Phagding settlement is at an altitude of 2620 meters above sea level. 07:00 breakfast and access to the town of Namche Bazar. 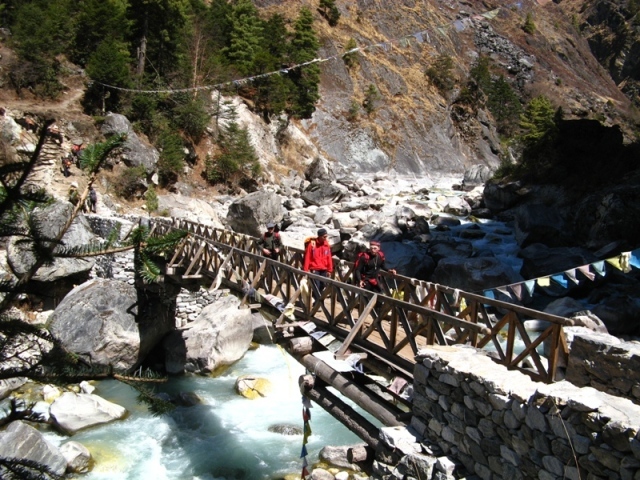 On the way for the first time in trekking to see the top of Everest. 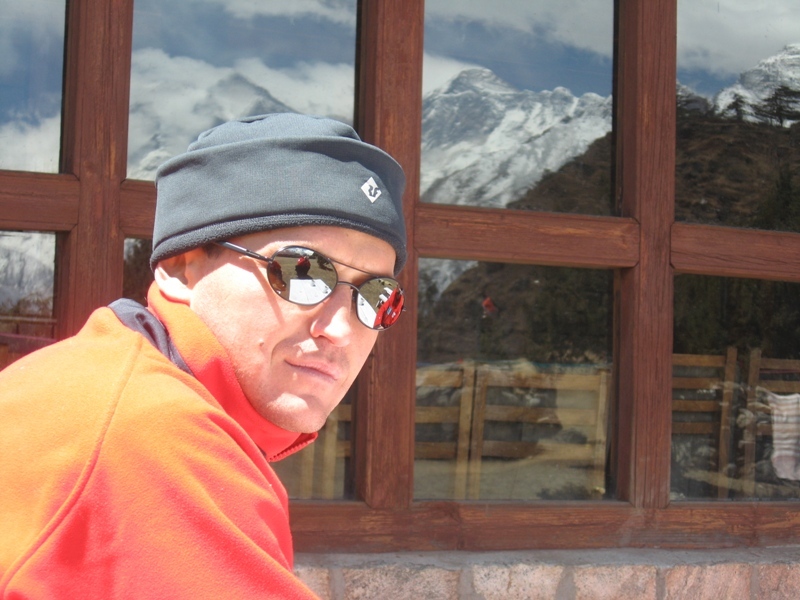 At noon they came to Namche Bazaar (3440 m.). Placed in a good hotel «Camp de Base». After lunch, went for a walk around the city. Visited the International Mountaineering Museum. The mood and feeling all good! 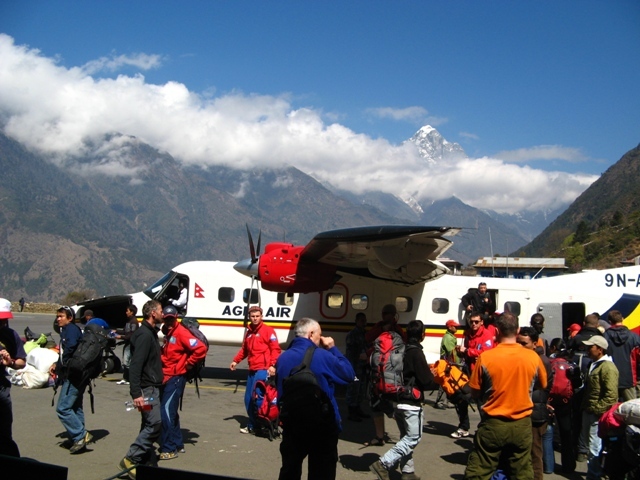 09:30 flight airline «AGNI Air» from Kathmandu in Lukla. Time in flight for 20 minutes. 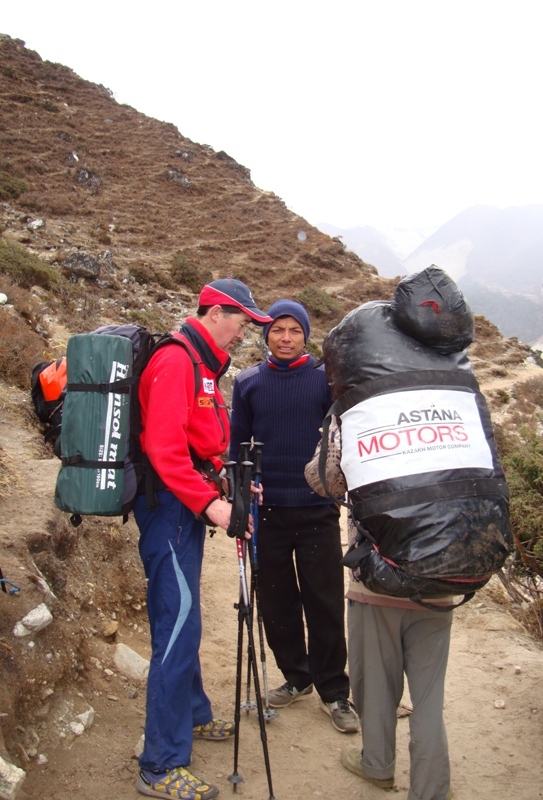 On arrival at Lukla dinner and went to trekking to base camp, Everest Lhottse. Weather cloudy, cool. 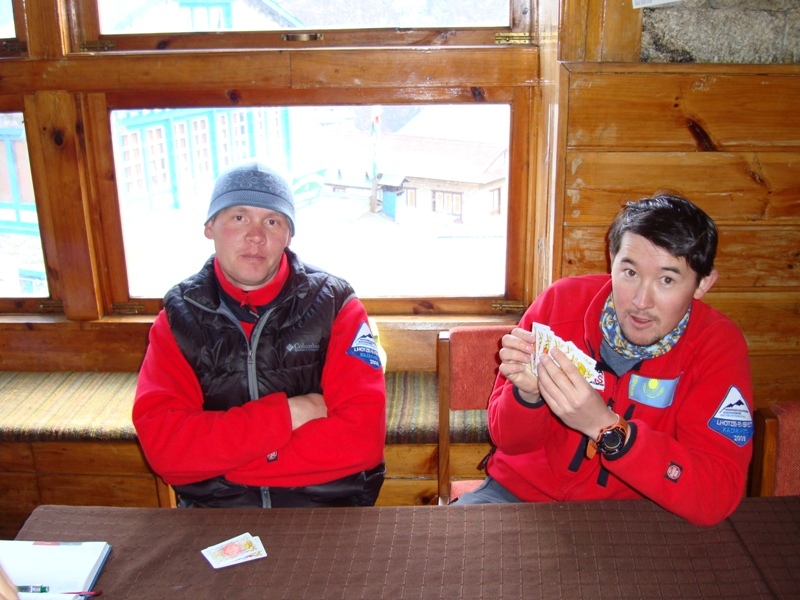 The first stop in the village Pakding, in the loggia «Mountain Resort». Feelings all good. On the first day there were only 2 hours. 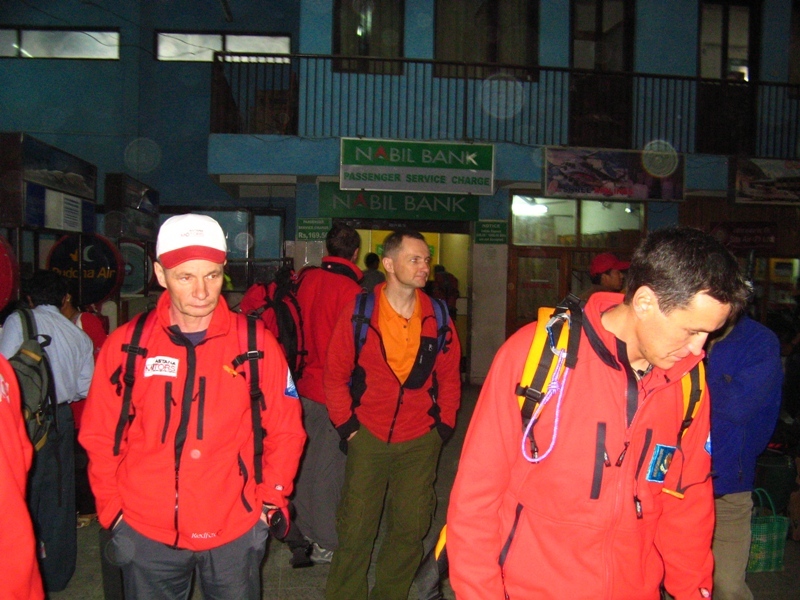 06:00 until 13:00 waiting for information on the possibility of departure in Lukla. But unfortunately, the weather at Lukla airport area all day was neletnoy. 06:00 Departure to the airport. 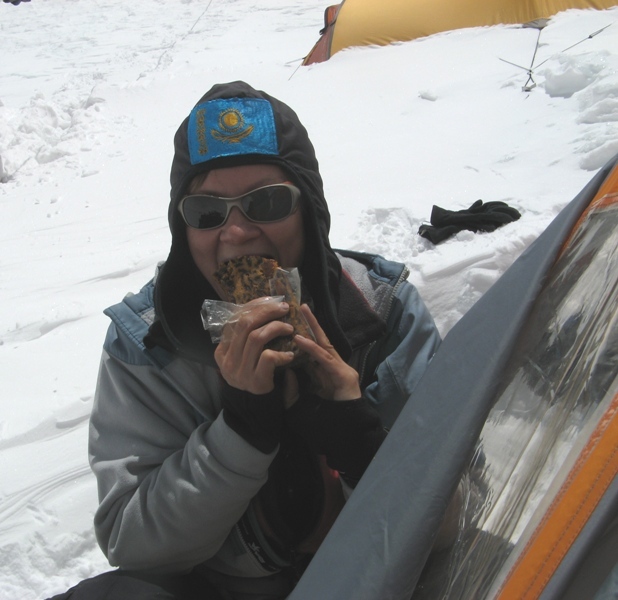 Due to the summer weather is not all flights were canceled in Lukla. 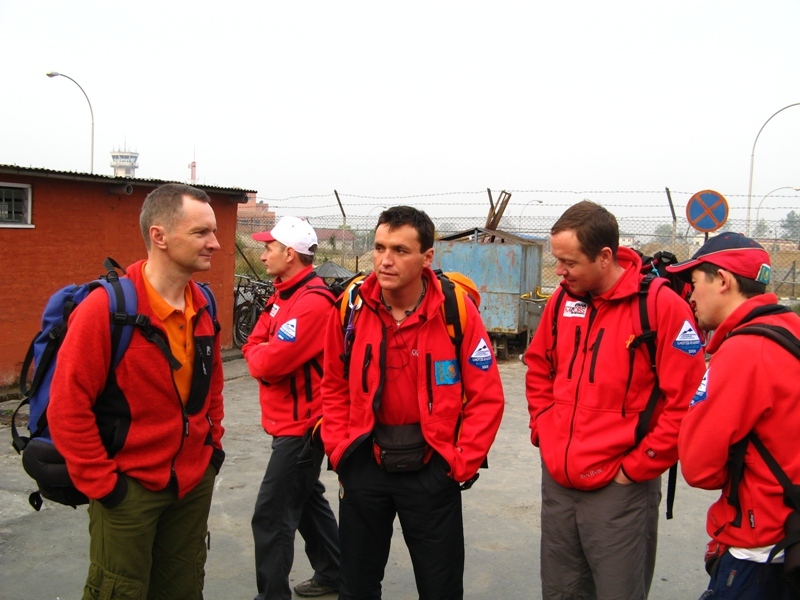 The team waits for improving weather in the area of the airport of Lukla. 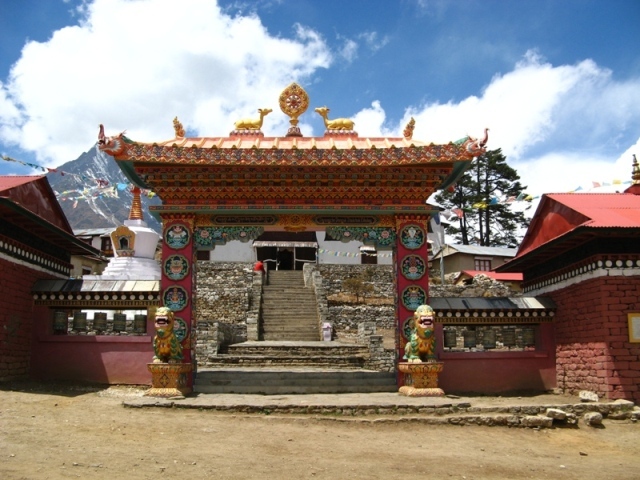 Due to the summer weather is not all flights were canceled in Lukla. 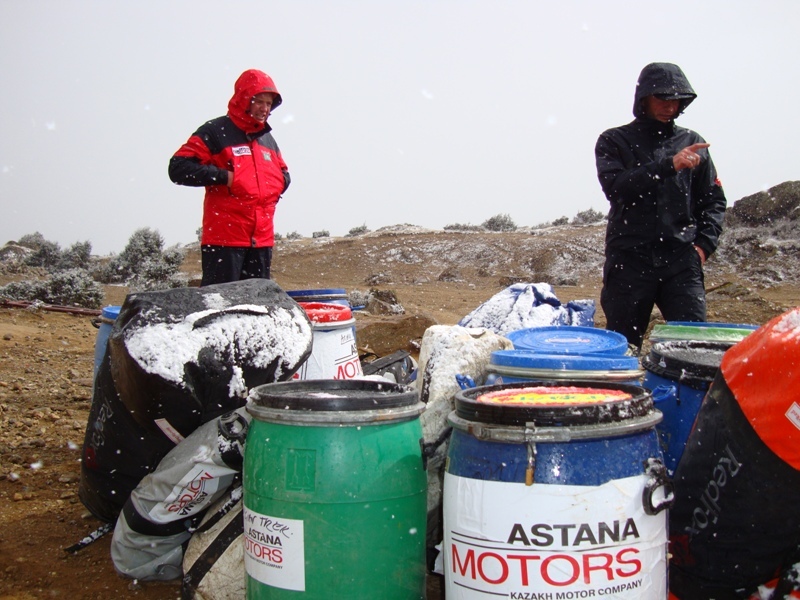 The team waited until 15:00 of improving weather in the vicinity of the airport of Lukla. 09:00 packing all expedition equipment for transportation to base camp. Each trunk and barrel should weigh no more than 30 kg. 12:00 Baglan Zhunusov, Sergei Lavrov, Svetlana Sharipova and received the blessing of Lama in the Buddhist monastery Kathmandu. 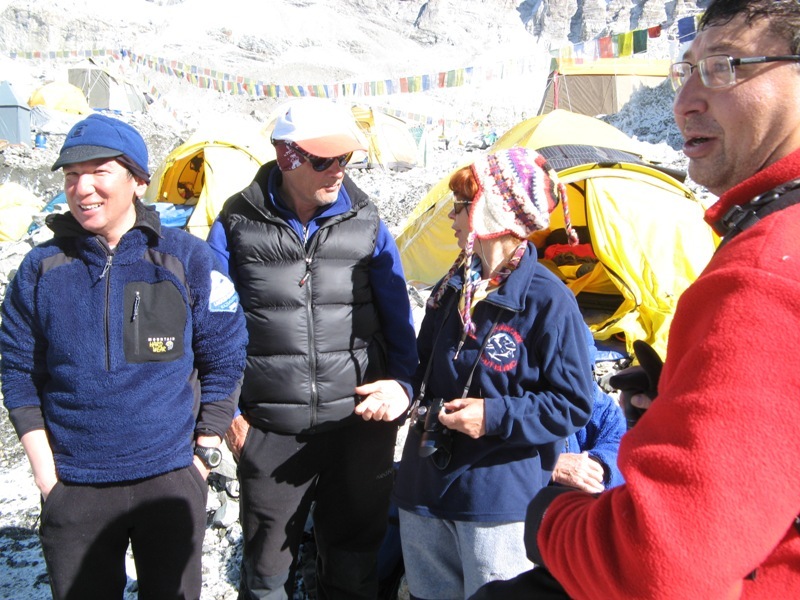 The team will receive a blessing before climbing to Everest base camp. 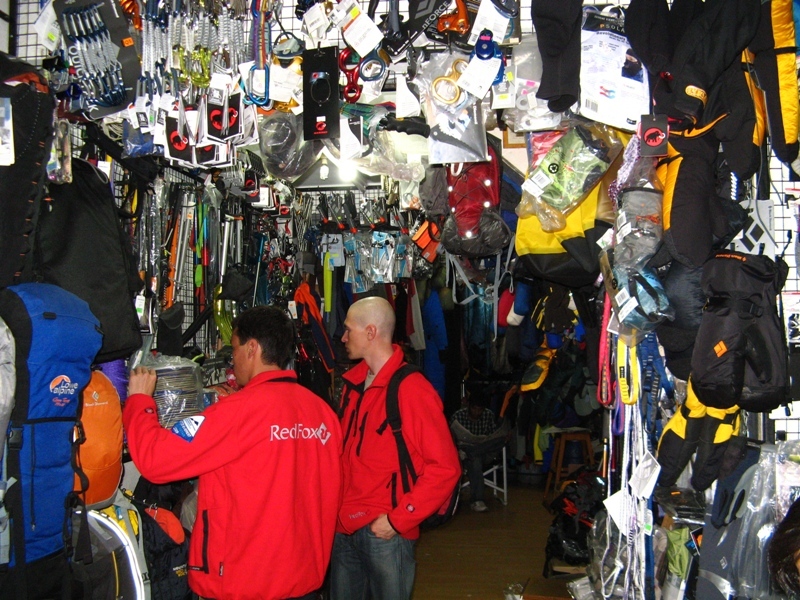 09:00 procurement of business supplies and equipment, as well as an expedition gear. 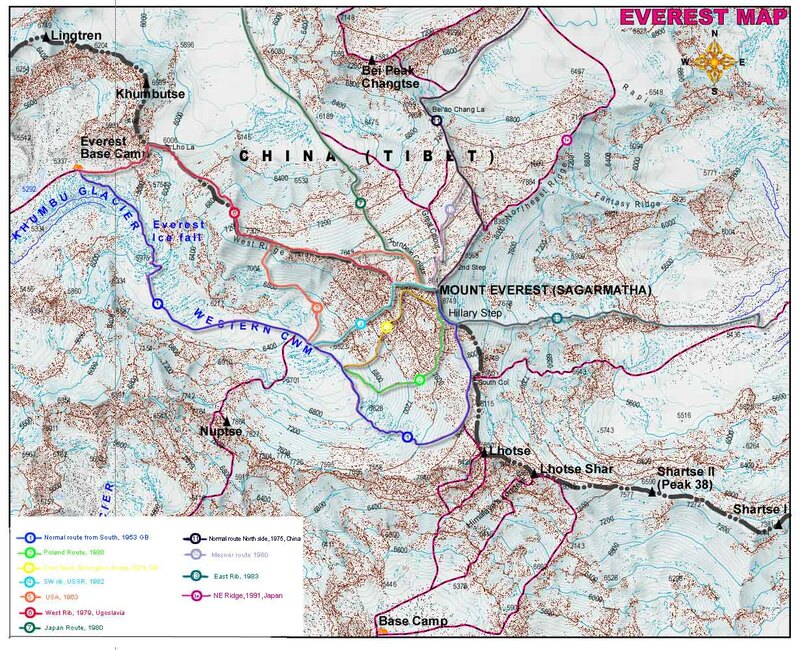 15:00 briefing at the Ministry of Tourism of Nepal, the receipt of permit at the top of Lhottse (8516 m.) and Everest (8848 meters). 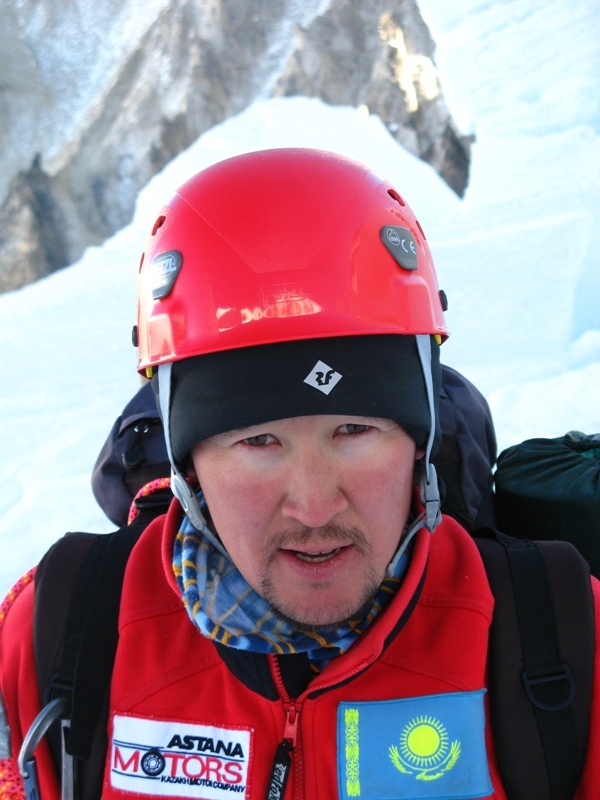 Head climb Everest appointed Zhunusov Baglan Abdullaevich, leader of the climb to Lhottse appointed Jumaev Maksut Sagintaevich. 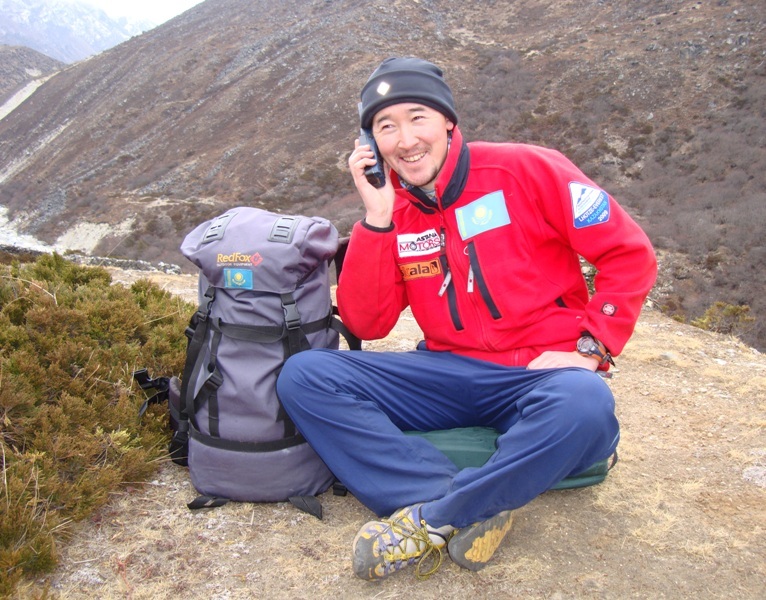 19:00 meeting at the office of the tourist company “Asian Trekking”. Dinner with the President of the tourist company “Asian Trekking” Mr Ang Turing. 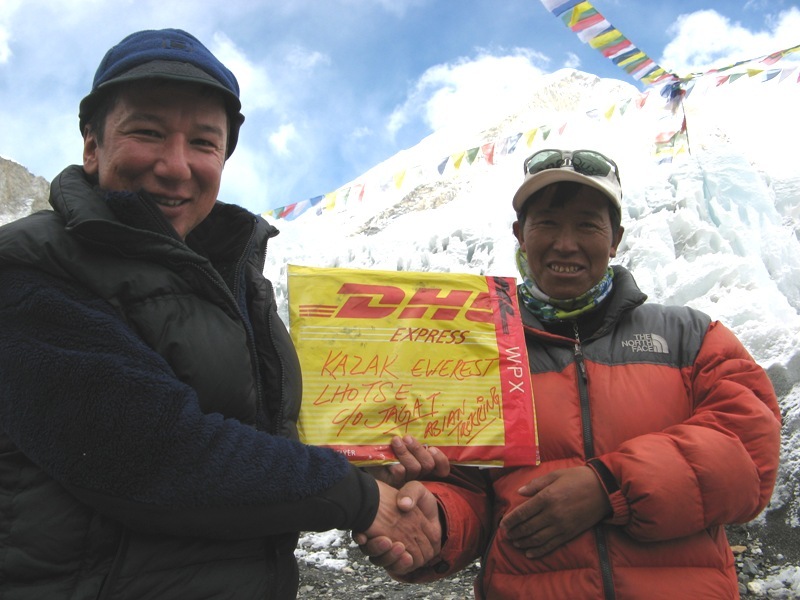 09:00 procurement of products and high-altitude expedition gear. 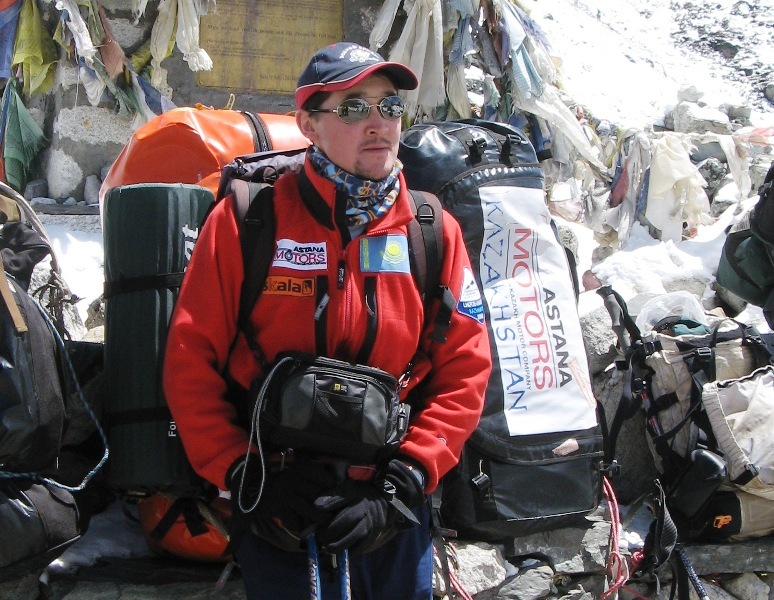 15:00 Meeting with chronograph Himalayan expeditions Miss Elizabeth Houle. 06:30 All teams flew flight 264 from Delhi to Kathmandu (Nepal). When flying from New Delhi had difficulties with the expedition supplies, athletes had to open the trunk and the barrel to see it. 08:30 in Kathmandu airport we met the representatives of tourist firms “Asian Trekking”. 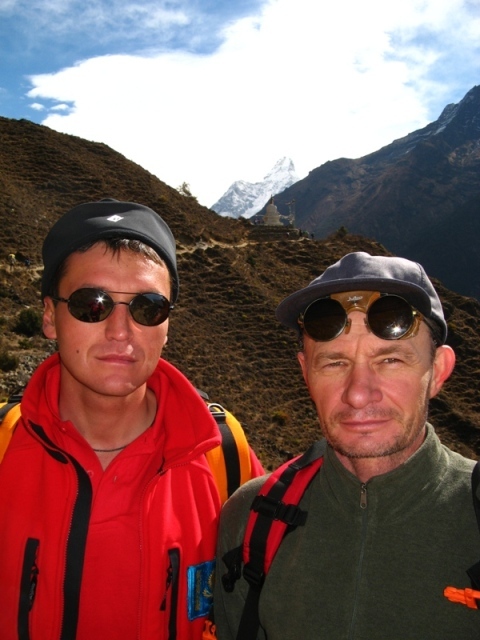 Posted by team at the hotel “Hotel Norbu Linka”. 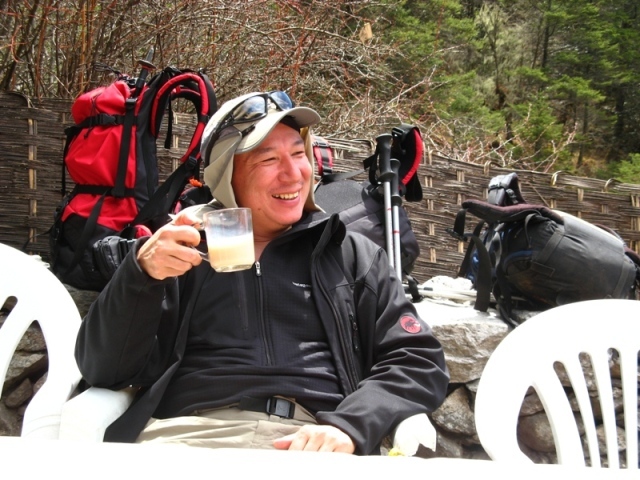 In the foie we met the president of tourism firms “Asian Trekking” Mr Ang Turing. 12:00 General Meeting of the team, approved a plan of action, when purchasing products and equipment, who is doing what, and other organizational matters. 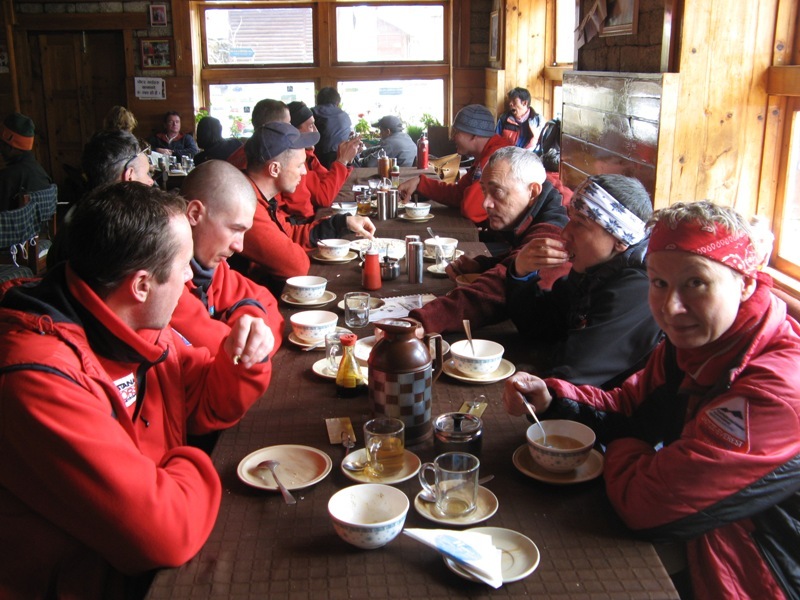 14:00 Lunch in the traditional Tibetan restaurant “Yak”. 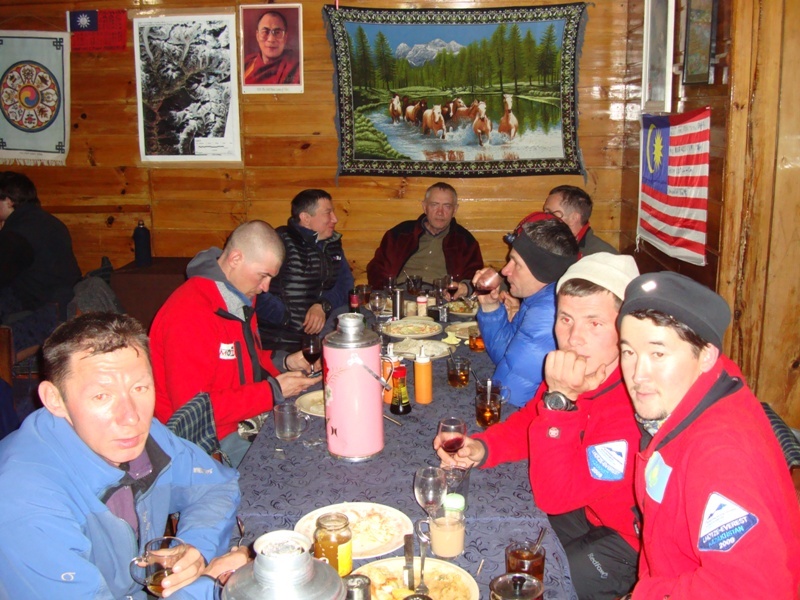 I must say that the restaurant “Yak” is very popular with climbers from the former Soviet Union. 16:00 free time for recreation. 19:00 Dinner at restaurant “Rum Doodle”, on the occasion of the arrival of the team in Kathmandu. 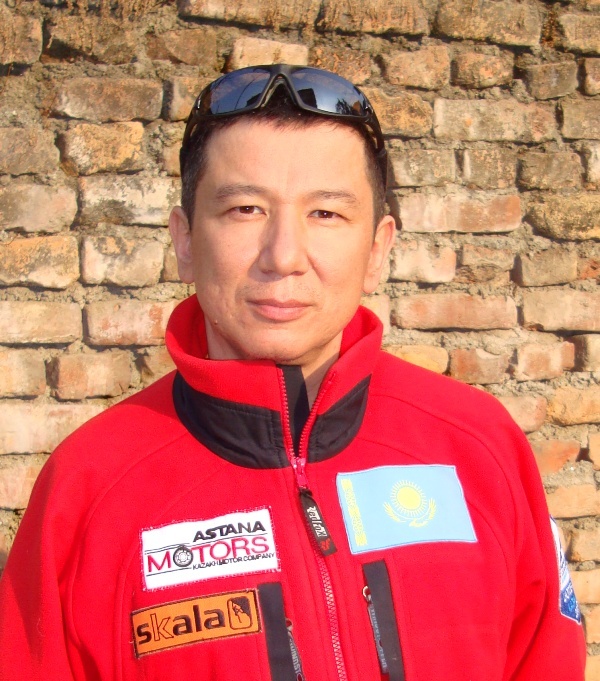 Since the beginning of the Kazakhstan-Everest Expedition Lhottse all congratulated the head of the expedition Zhunusov Baglan Abdullaevich. 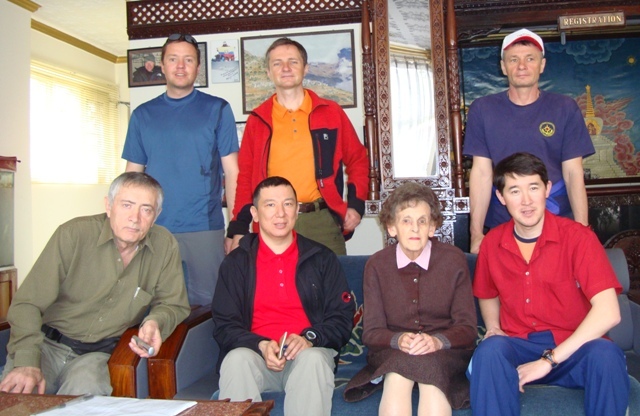 In parallel with the main command Lhotsze-Everest from Almaty started to Sergei Lavrov, Svetlana Sharipova, Dmitry Grekov (Kyrgyzstan), Nikolai Gutnik (Kyrgyzstan) and Olga Ismagilova – a journalist. 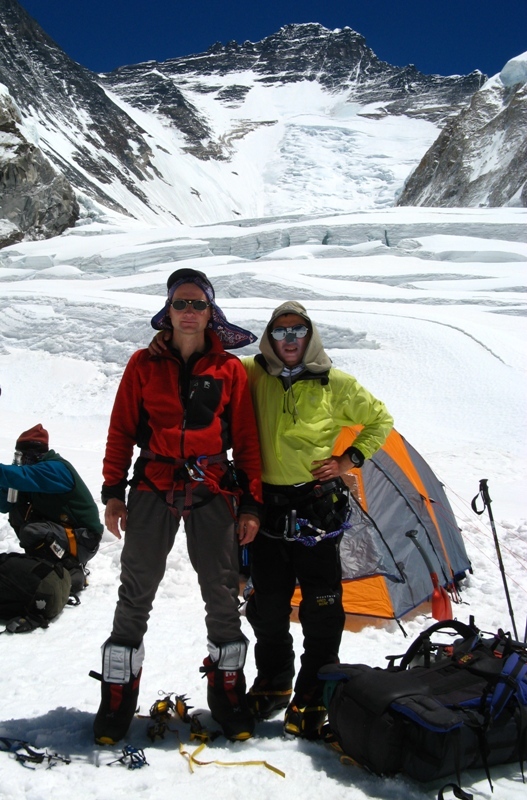 Svetlana Sharipova, Dmitry Grekov and Nikola Gutnik go to Lhotsze, Sergei Lavrov and Baghlan Zhunusov going to climb the Everest. 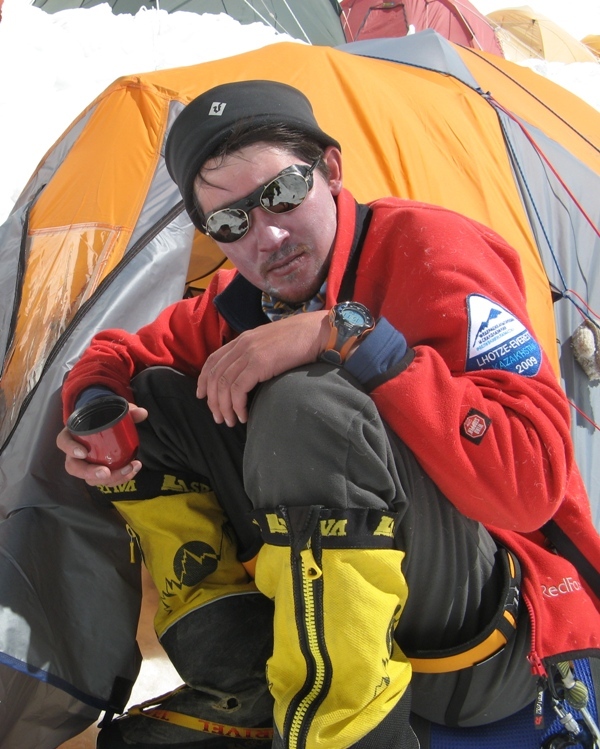 The entire team will live together in a base camp and work on routes in parallel. 12:00 total collection of the former Mountain Training Center “CSKA” at Zharokova st. 208A. 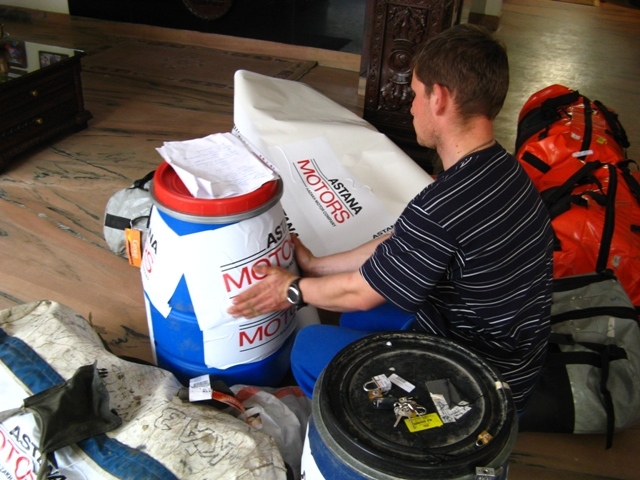 Preparation of public and personal gear for shipment. 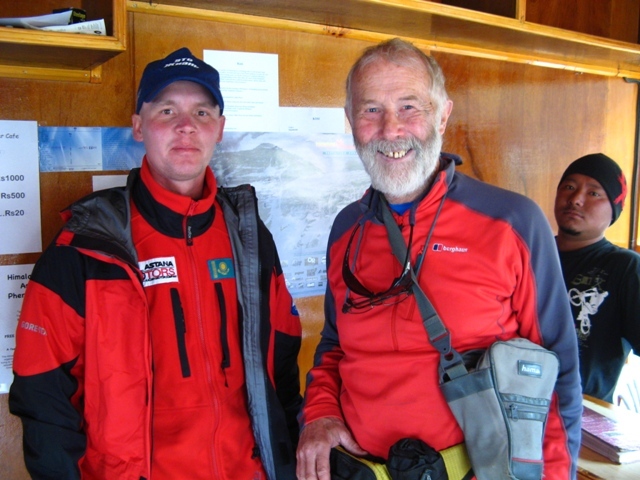 14:00 departure of the expedition team. 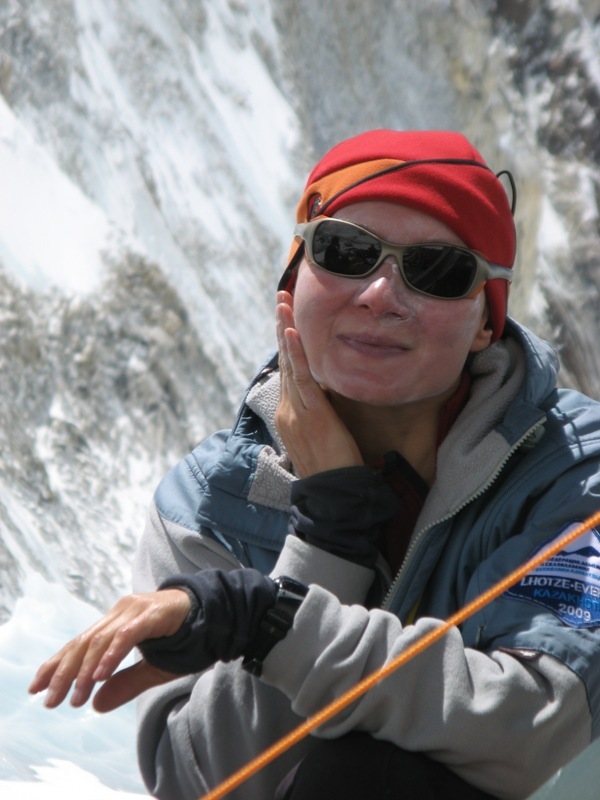 Wish farewell and good weather came to climbers of all generations. 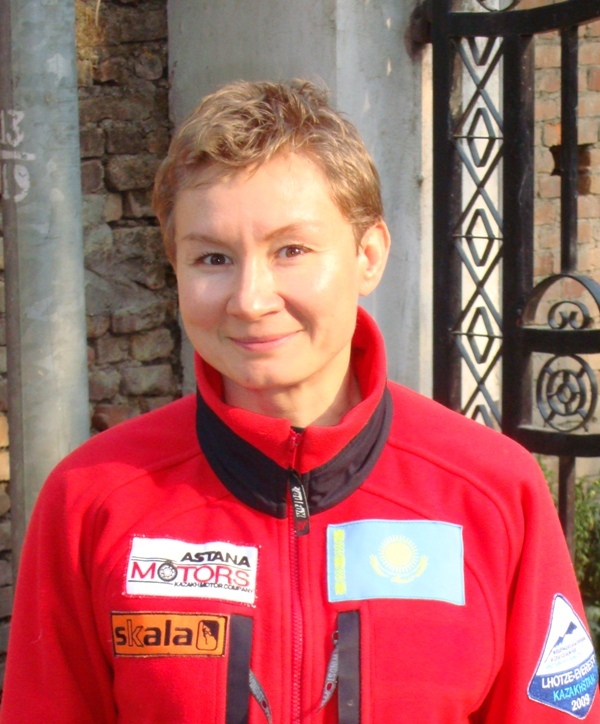 Addressed Valiev Kazabek Shakimovich, journalist Agency Khabar Mulenkova Galina interviewed athletes. At the table together and mountaineers and rock climbers, and home and family and friends are warmly accompanied their children, brothers, husbands, friends. 15:00, all serving in the expedition on a large bus left for the airport. 18:05 departure from Almaty flight 907 in New Delhi (India). Upon arrival in New Delhi, the team divided into 2 groups. One group held a passport and customs controls and received the luggage. The second group proceeded to the transit of the Delhi airport.